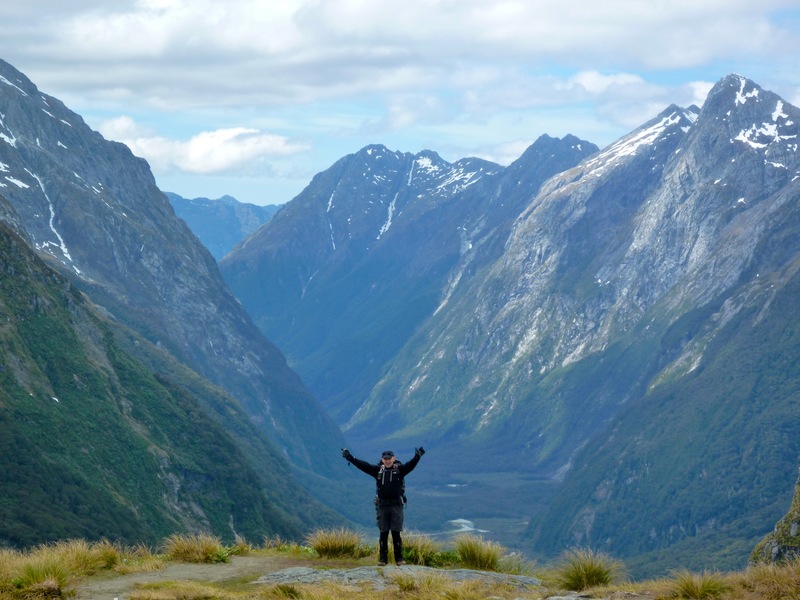 The reason Ultimate Hikes make this a 5 day experience is because once you’ve walked all the way to Milford Sound, who’s NOT going to want to go for a cruise out on Milford Sound before going home? The bone of contention is when people realise the advertised 5 day / 4 night guided walk includes only 3 full days of actual hiking in the wilderness. But damn it’s worth it! The clouds that float around the mountains are fantastic. The many moods of Mitre Peak – we were lucky to see it in such spectacular form. 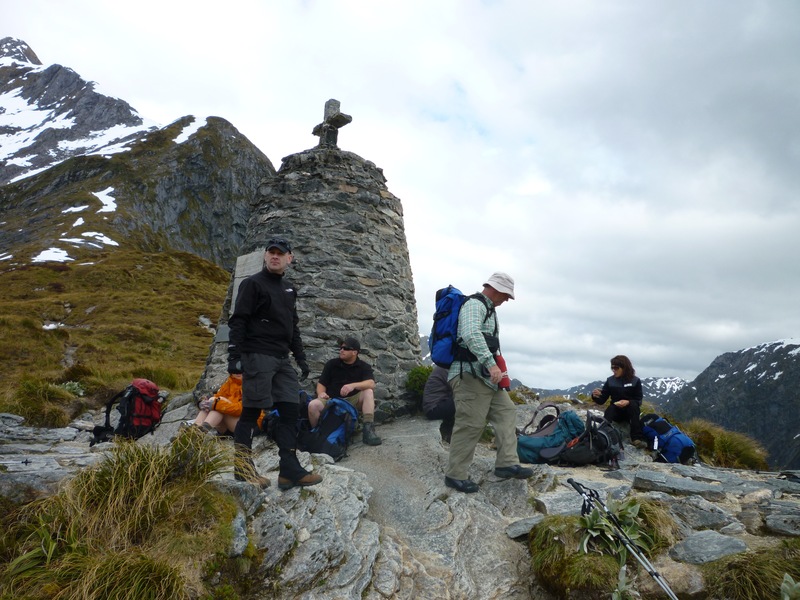 Everyone had packed an extra change of clothes in an overnight bag that Ultimate Hikes had sent on ahead from Queenstown on Day 1. Not having to wear the same hiking gear for the 5th day in a row – on the last day when we weren’t even hiking – was very nice. Of course, you do have to do a wee bit of walking today – from your room to the bus, from the bus to the ferry, around the ferry while taking photos… you get the picture. 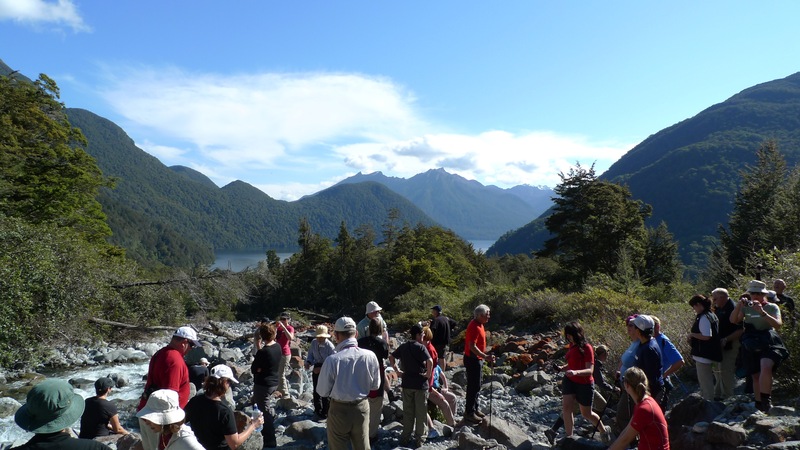 Local Maori tribes used to visit Milford Sound, that they called Piopiotahi (after a now-extinct bird) to collect pounamou (greenstone) to make into tools and jewellery. 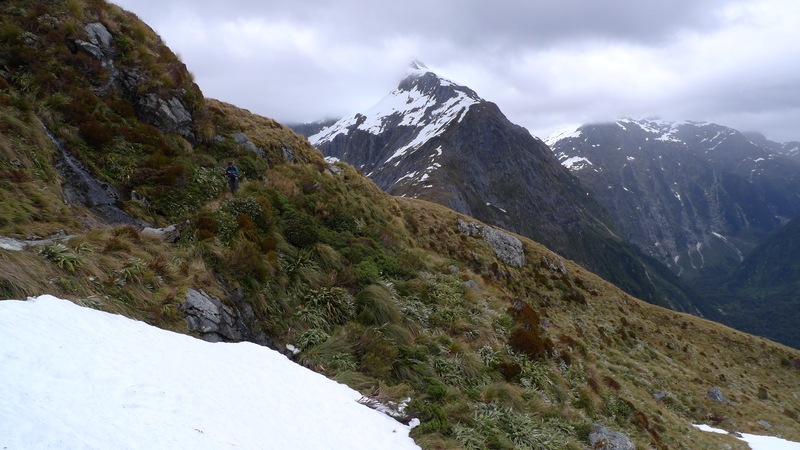 They walked the same route through the mountains as we did, over what is now known as Mackinnon’s Pass. Read more here. 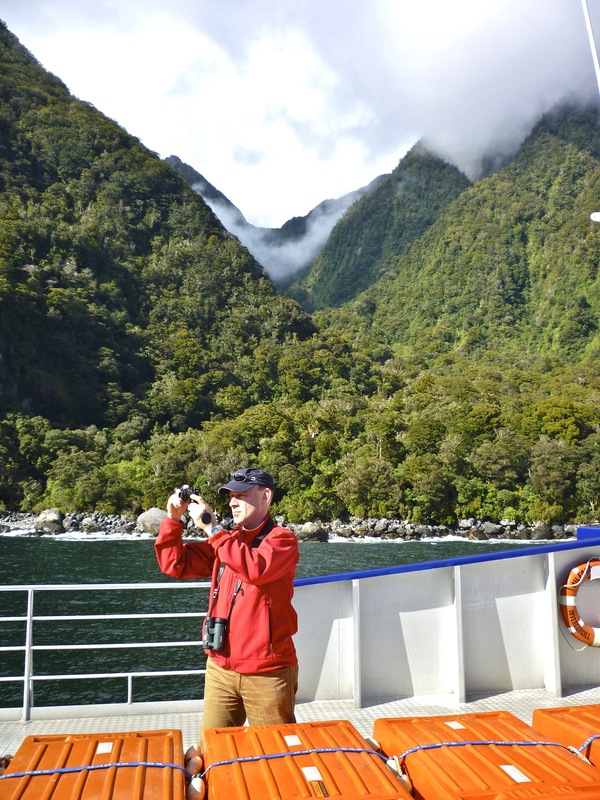 No matter who you travel with, there are a few things every boat operator on the Milford Sound will do. 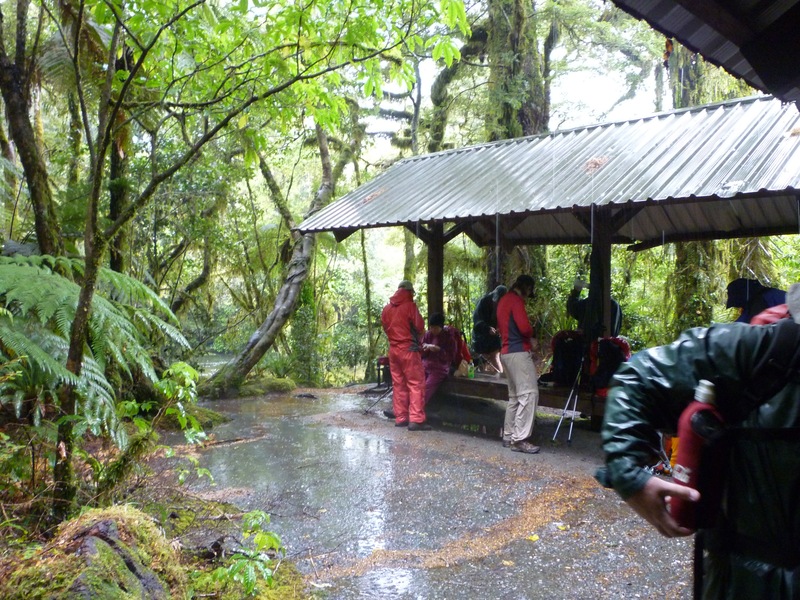 One of them is going right up to a waterfall cascading down the side of a cliff… one might even say under it! The point of this ‘stunt’ is to prove that the cliffs continue down below sea level just as steeply as they appear above it. 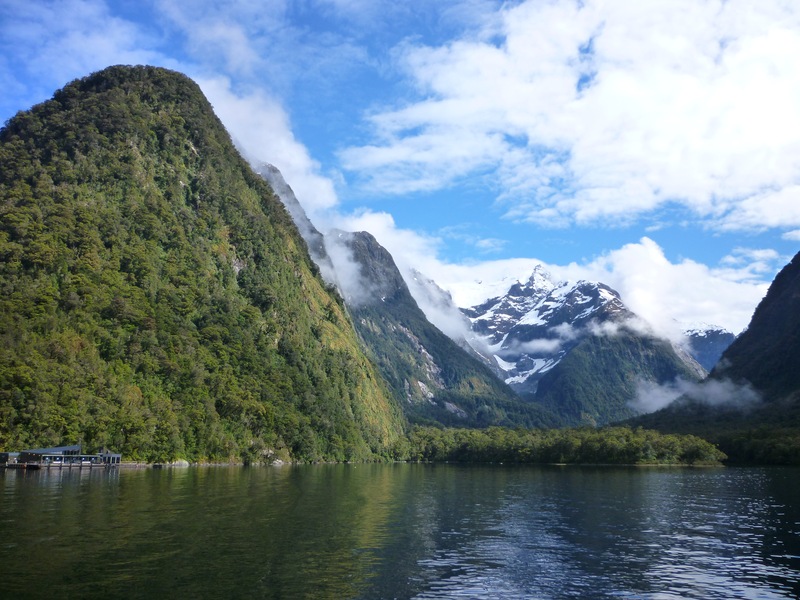 Milford Sound, and I believe all the other ‘sounds’ in the region, is actually a fiord (thus why the region is called ‘Fiordland’), which means it was (Ages ago) a valley carved by a glacier, not a true sound which is a ‘drowned river valley’. 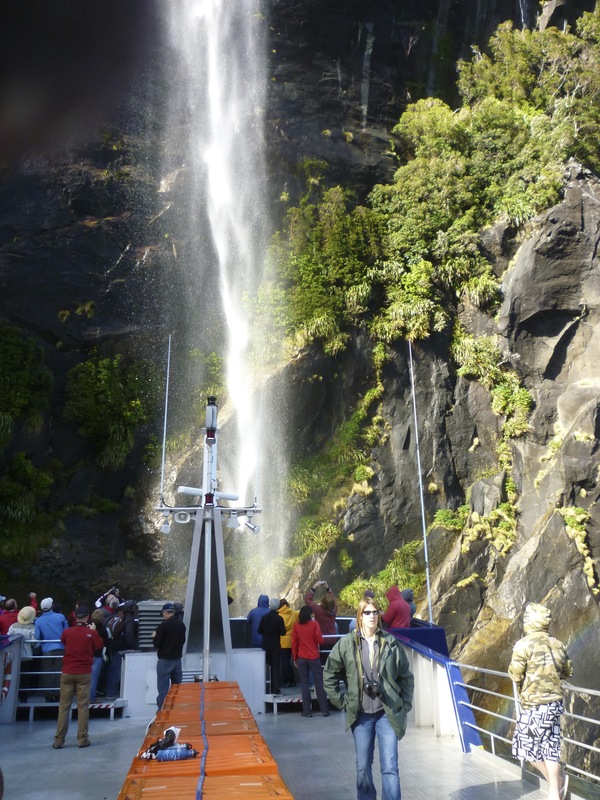 Because the fiord is extremely deep, even very large cruise ships can approach the cliffs without fear of running aground. 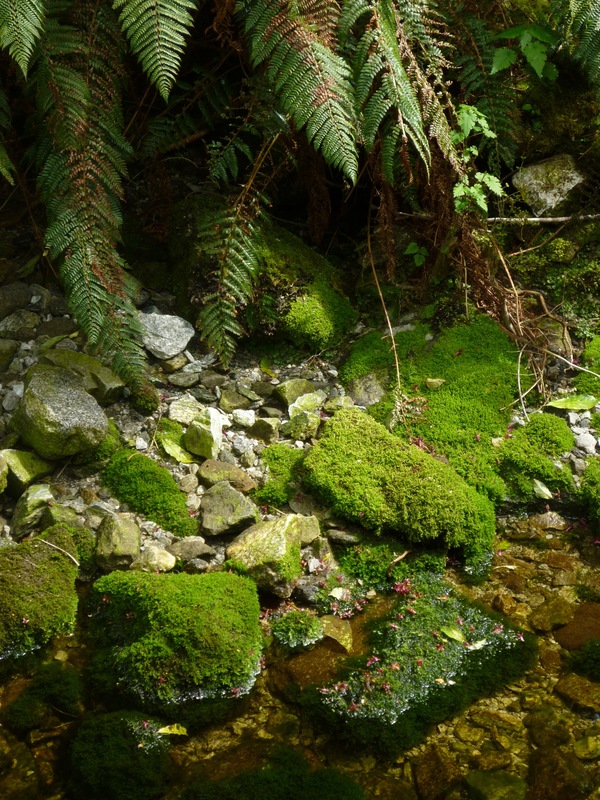 Steep green thickly-forested mountain sides. One of the few stony beaches near the mouth of the fiord. 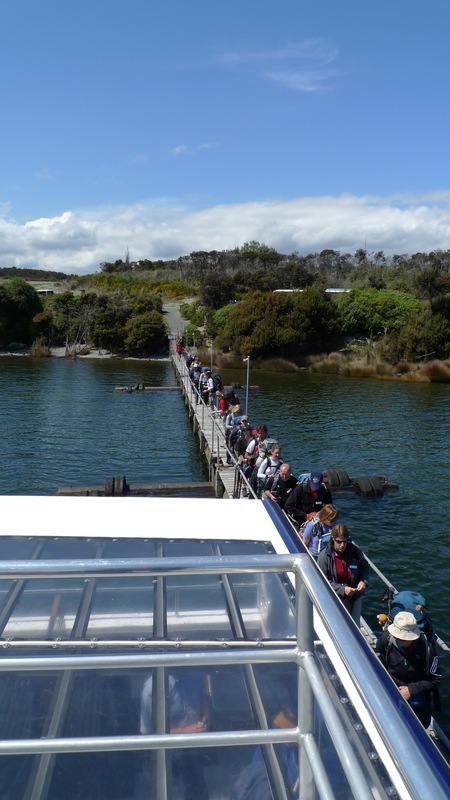 Another way to see the sights – if you have time! There used to be a sealing colony along the coast that was set up in the 1790’s. A sailor on good ole Capt’n Cook’s ship came back because he remembered there were so many seals here when they called by. It ran for 30 years until they ran out of seals to slaughter. 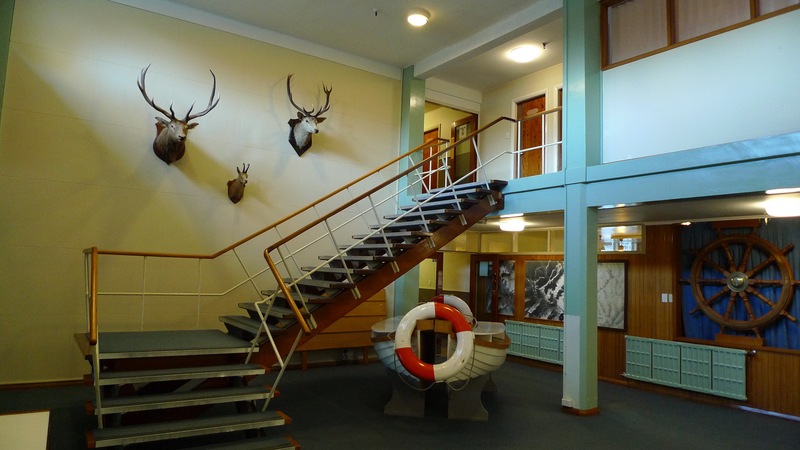 So they turned it into a whaling station and repeated the story. 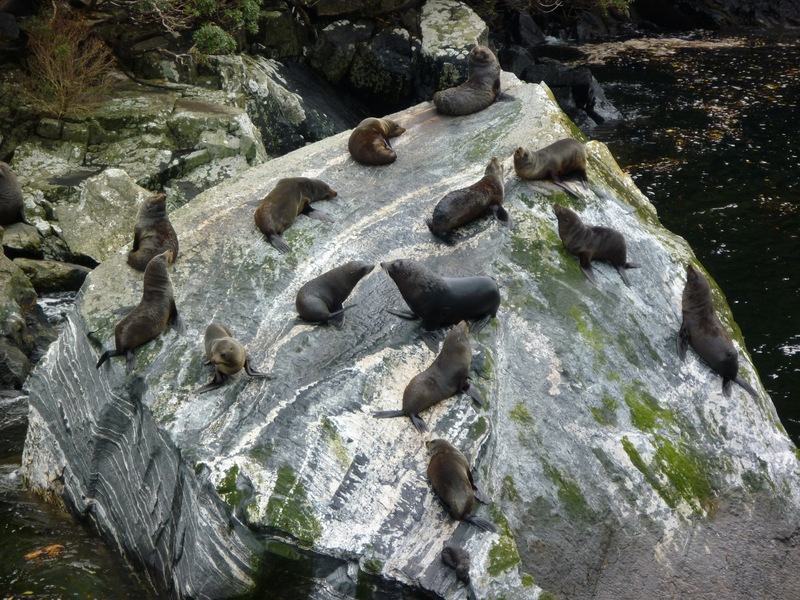 These guys just have to watch out for the occasional orca pod (aka killer whales)! 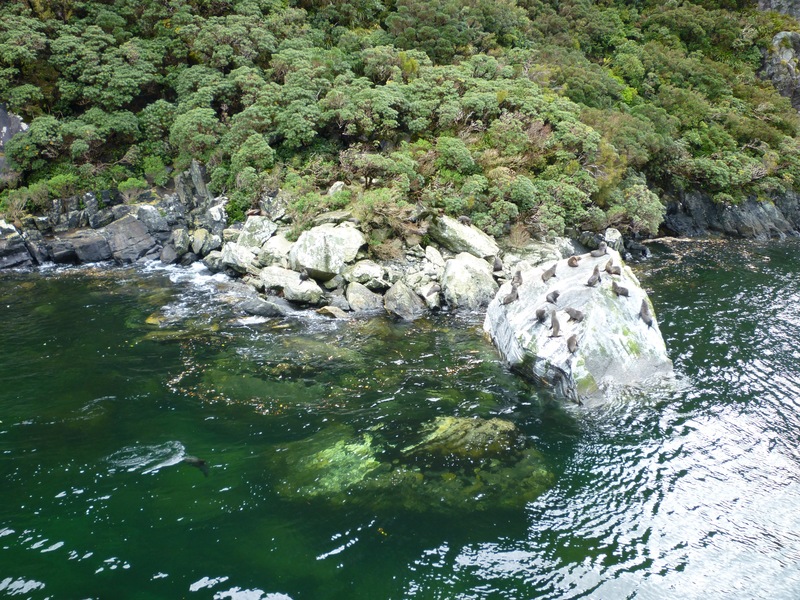 Not only did we see seals (that’s almost guaranteed), but we were lucky enough to see a small pod of bottlenose dolphins and two rare New Zealand Crested Penguins! The dolphins were interested in feeding, not playing, so weren’t interested in interacting with us. 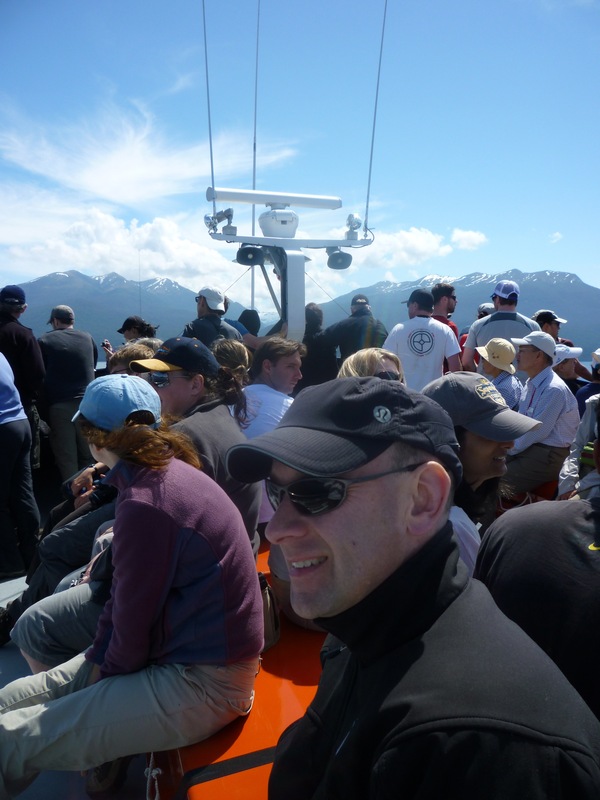 I was keeping my eyes peeled for whales – orca or otherwise – which are not common, but not unheard of visitors, but no luck this time. 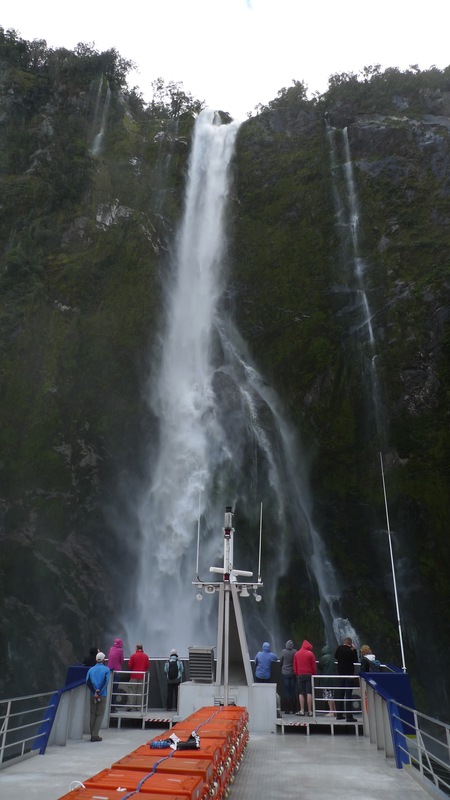 The wind created by the falling water and the impact of the water itself create a shattered glass effect on the fiord. We didn’t have time to stop at the underwater observatory today, but I have been before and it’s definitely a worthwhile stop. Although I enjoyed the cruise, one thing I noted was an absence of commentary from the captain/crew/someone about what we were seeing. A few years prior I had booked the cruise through Real Journeys (we were also on a Real Journeys boat on this trip), and the commentary along the way was very informative. After the cruise we were back on the bus for the long ride back to Queenstown. I was pleased that Stephen would get to see the Homer Tunnel – I’d been mentioning it quite a lot in the lead up to the trip. It’s about 1km long, straight through a mountain – a great engineering feat in my opinion. Done mostly by hand and dynamite, it took a while to complete as work was interrupted by WWII. They dug it from both sides at the same time and met in the middle – and were out by less than a foot! Can you imagine trying to work that out? It’s a phenomenal achievement! 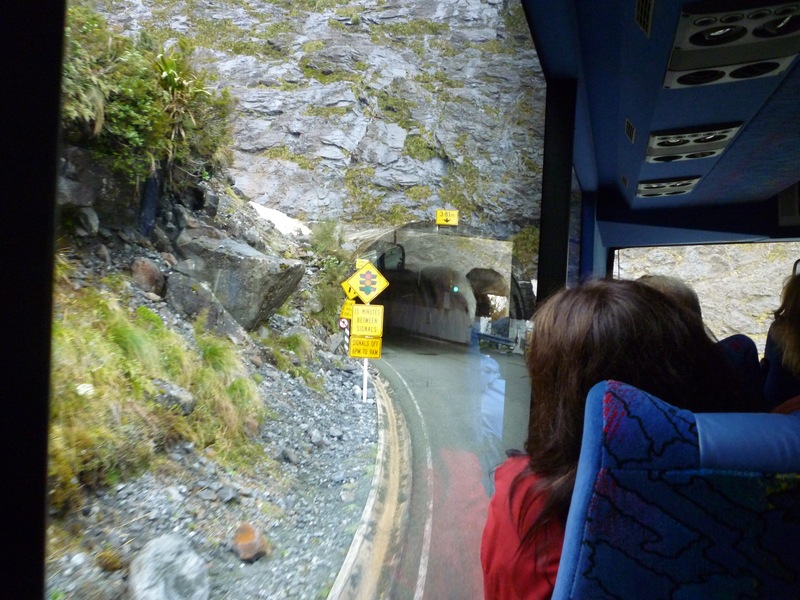 Entering the Homer Tunnel, Milford Sound side. Looking back the Homer Tunnel exit, so small in the mountain side. You can appreciate why avalanches and landslips close this road so often. The mountains here are just so steep and massive. Driving down the valley; it looks harsher than the Clinton Valley. 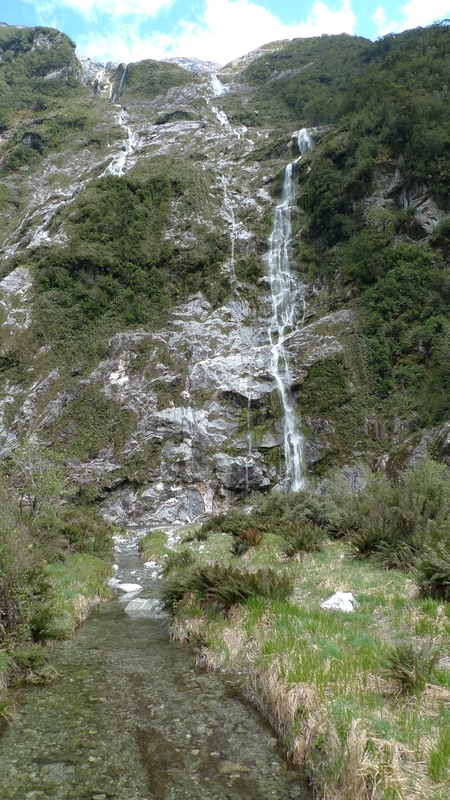 A waterfall we passed right on the side of the road – you can pull over here if you’re in a car and heading towards Milford Sound. I just can’t get over the water. It calls to me. Despite the scenery, we were too tired to stay awake for the whole trip back. 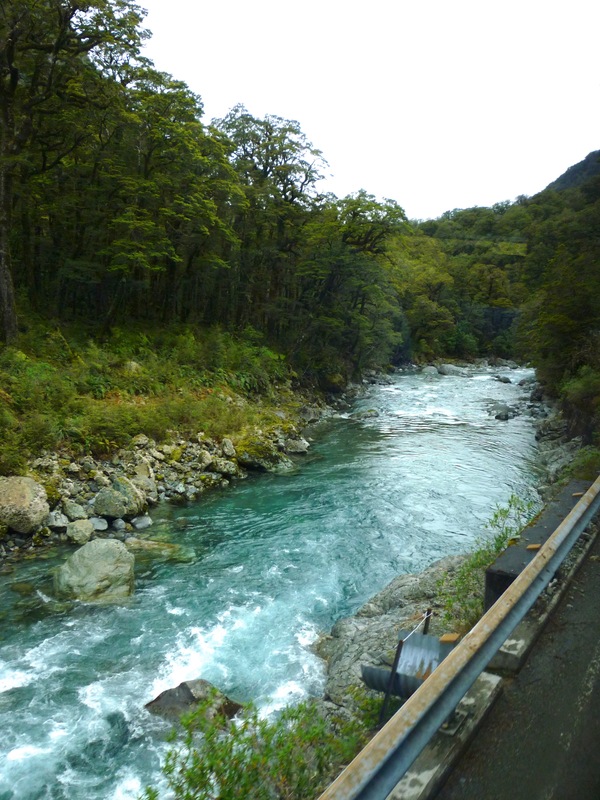 If you’re ever in the area and you have a chance to drive the road from Te Anau to Milford Sound – do it!! It’s a beautiful drive, and there are a few very worthwhile stops along the way that you just don’t get to do with a group. Definitely a case of enjoying the journey, not just the destination. Oh, but remember – if you have to stop at the Homer Tunnel entrance, don’t leave your car unguarded to possible Kea attack! Don’t let me give you the impression that I have any regrets though! 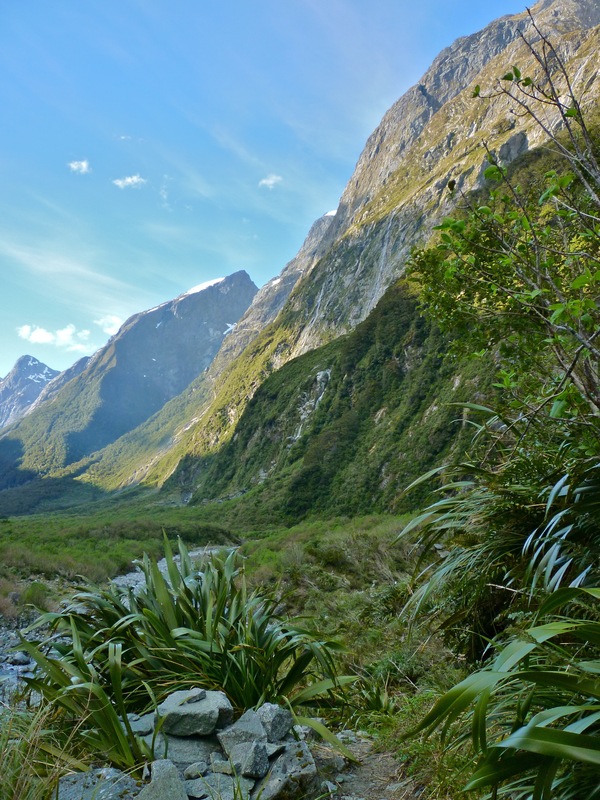 I don’t think we would do this as independent hikers, so Ultimate Hikes has allowed us – and so many others – to see a real jewel in New Zealand’s crown. I would recommend it to anyone who’s up for it! We didn’t have a dinner reservation that night, but ended up at Wai on the waterfront. Top notch. 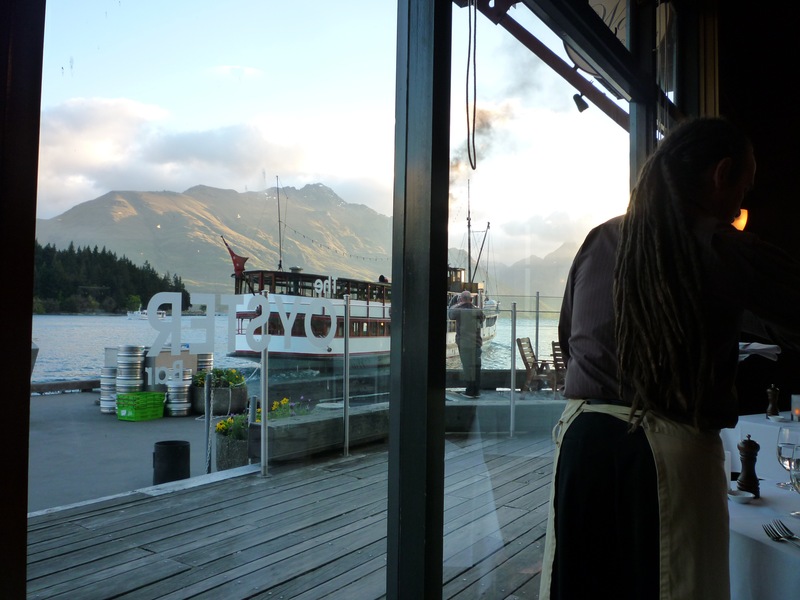 Dinner on the pier at Wai, Queenstown. The TS Ernslaw is setting off for it’s evening cruise. 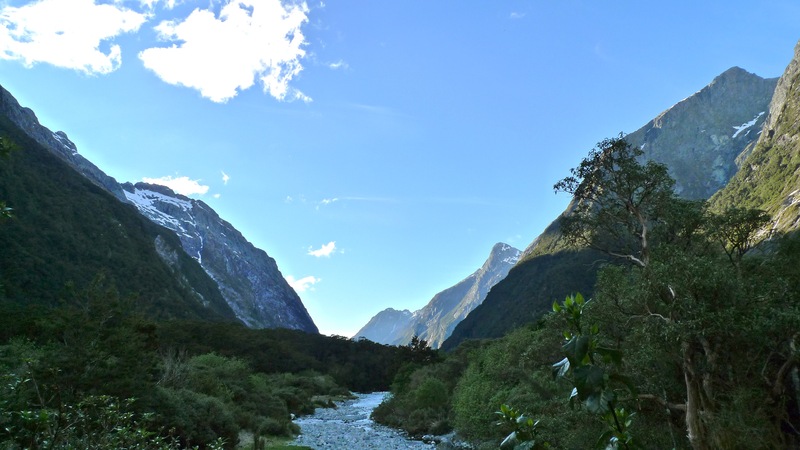 Categories: Holiday, New Zealand | Tags: Fiordland, Homer Tunnel, Lady Bowen Falls, Milford Cruise, Milford Sound, Milford Track, Mitre Peak, New Zealand, New Zealand Crested Penguin, Ultimate Hikes, waterfalls | Permalink. Another early start for our last day of walking! Today we had a long (13 miles; 21 km), if relatively flat, way to go to get to the ferry at Sandfly Point. Pretty flat compared to Day 3! Piece of cake…right? Just like yesterday the lights came on at 6.15am. The first ferry would leave at 3.15pm, the second at 4.00pm. If there were still straglers, the boat would do an extra trip at 4.45pm. Sounded easy enough – 3km/hr would get you to there in time for the first ferry which also allowed for 45min of stops along the way… even so it felt like we had to walk at a pace just as fast as the previous day. Thus it was with a few minor aches in our hips (thanks to the steep Emergency Track yesterday) that we set off, but as Stephen said, they either fixed themselves or got too numb to feel after a while! 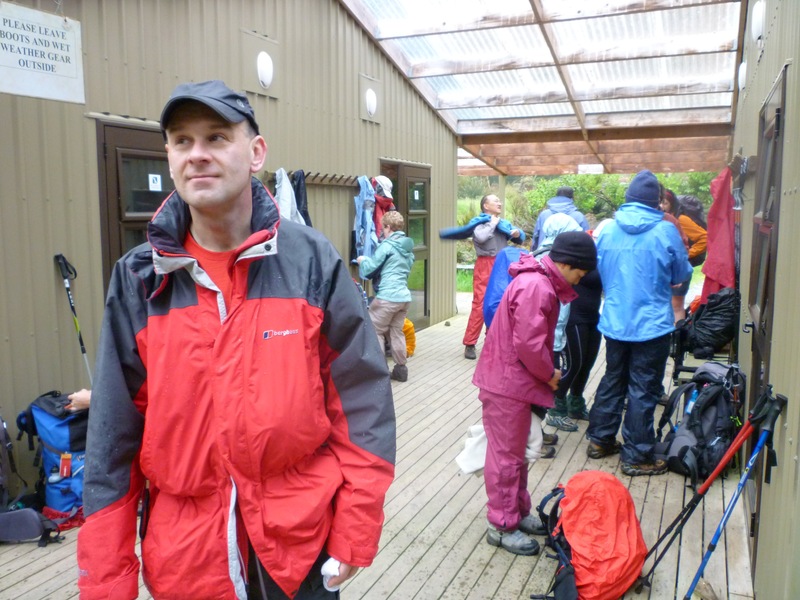 Ready for our last walking day – still dry here, but not for long! 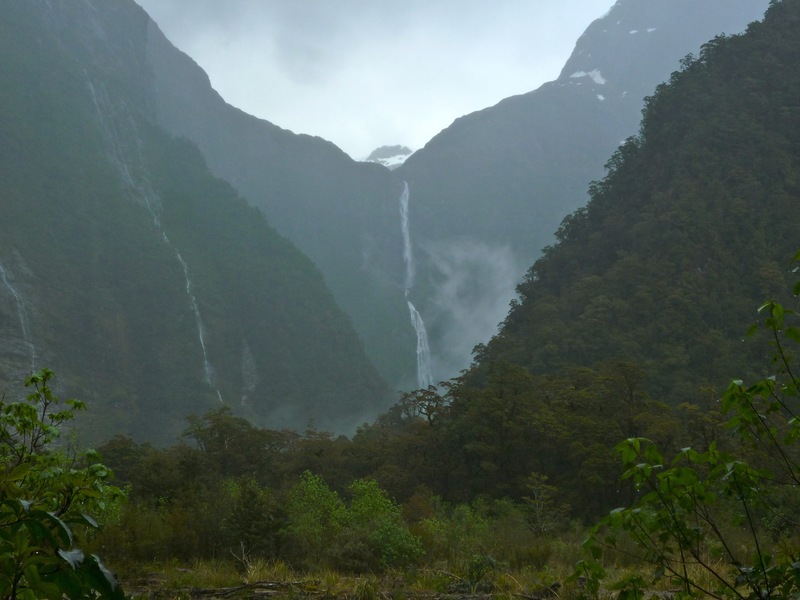 Although we’d had wonderful weather so far, today was a more typical day in Fiordland; it was wet. The rain was falling steadily – more than a light rain, but not a downpour (which is not uncommon) – which continued until about mid afternoon when we finished walking. It was a hard day on our cameras. Despite being in a soft case in a pocket with a water tight zip, my camera got pretty wet. In the period when the rain slacked off a bit I’d carry it in my hand to help it dry out! Stephen’s wasn’t fairing much better, as the few splotches on some of our photos will attest. 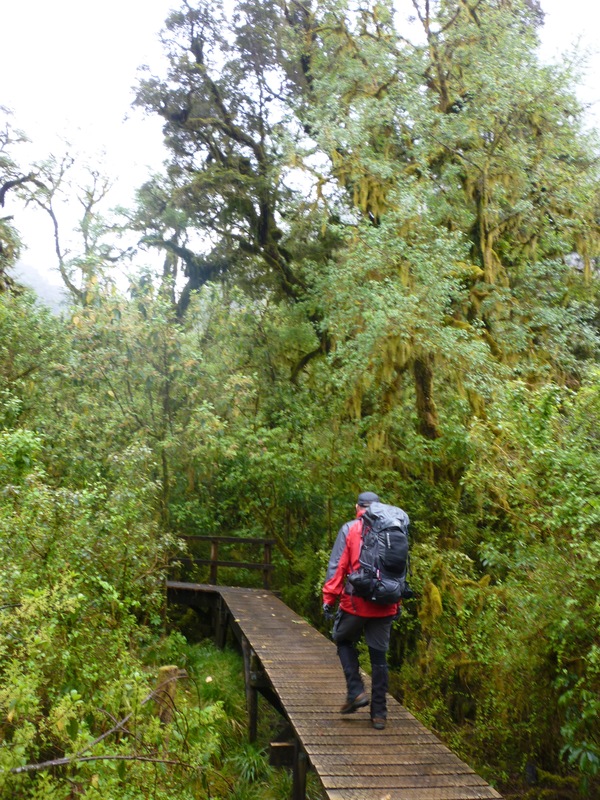 While the views were not as stunning as the previous two days, the clouds hiding and revealing the mountains and waterfalls, and the lush forest bordering the track were sights to savour none the less. We pushed ourselves again today; we weren’t the first out the door (we were hoping not the be the last ones actually!) so had ground to make up if we wanted to catch the first ferry. In this weather a comfort stop requires a bit more effort. Here we’re at the third DOC Hut – Dumpling Hut – and fortunately under cover. 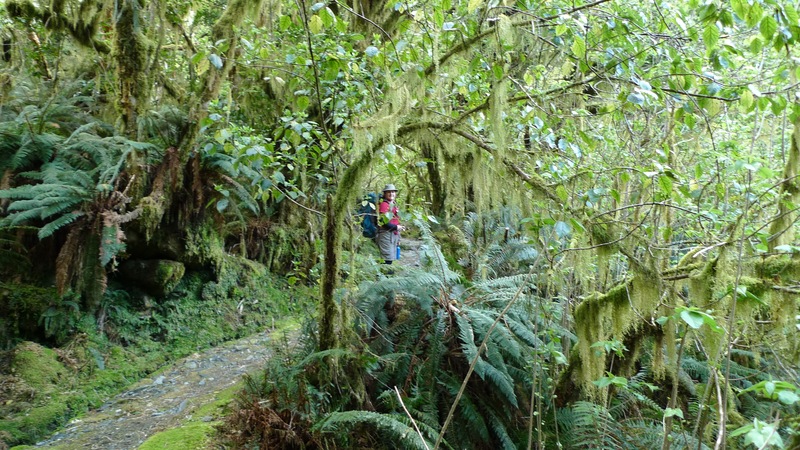 Lovely big mossy trees and lots of ferns. My water resistant (not water proof) pants were soaked after the first hour or so, and although I was wearing gaiters, the water eventually crept down into my boots, making the last half of the day’s walk rather damp (didn’t get squelchy, though if we’d had to wade many streams they would have). It was 8.8km from Quintin Lodge to our morning tea stop at the Boatshed – which felt like it should have been a lunch stop. Lunch was still a further 7.2km down the track yet. The thing I remember most about this stop was the number of sandflies around the entrance. 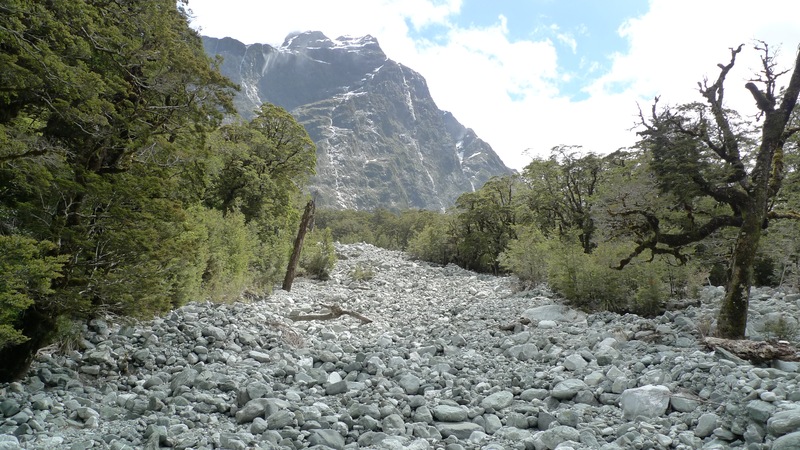 There were so many sandflies today – whether they were out in increased numbers due to the rain, or maybe there are always more along the river in this valley – they are bloody annoying! The shed doesn’t look like much on the outside but it’s not there to be glamorous. 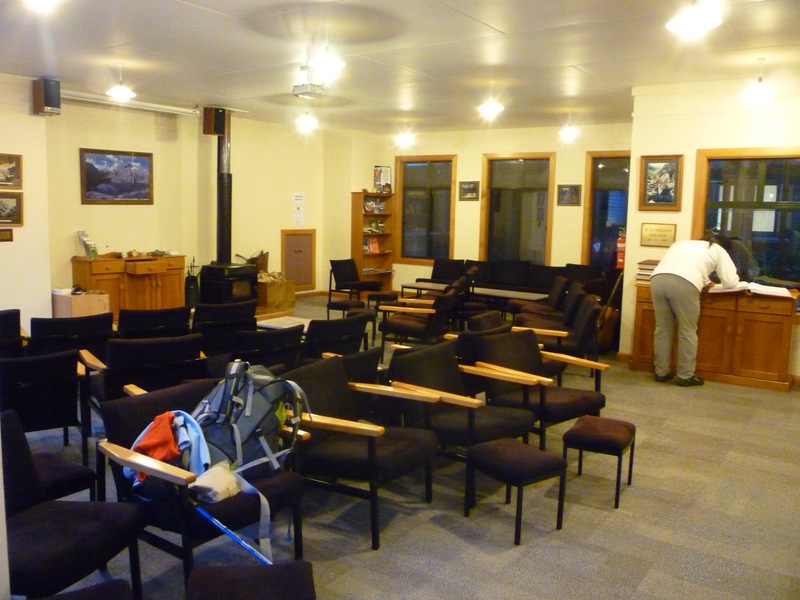 The inside is clean and a chance to take a seat and have a hot drink is most welcome at this point. There were fewer sandflies inside, fortunately, but the only way to keep them off is to keep on walking. 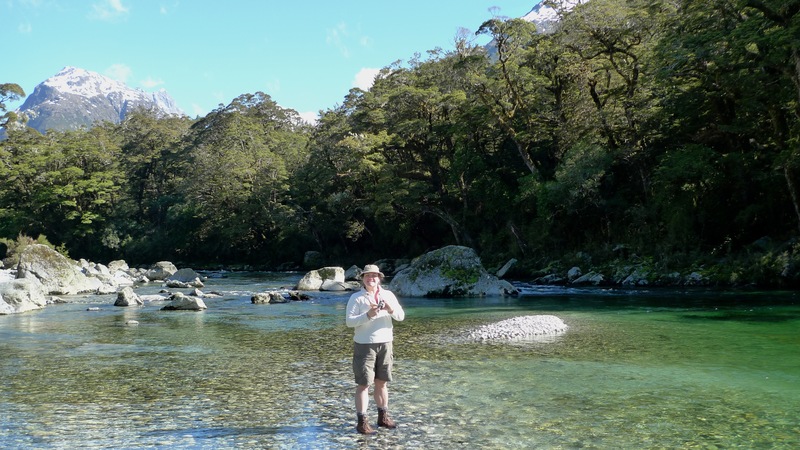 Stephen crossing the Arthur River. I just love the colour of the water! It’s so clear! This raised section must indicate the water can get pretty high through here. 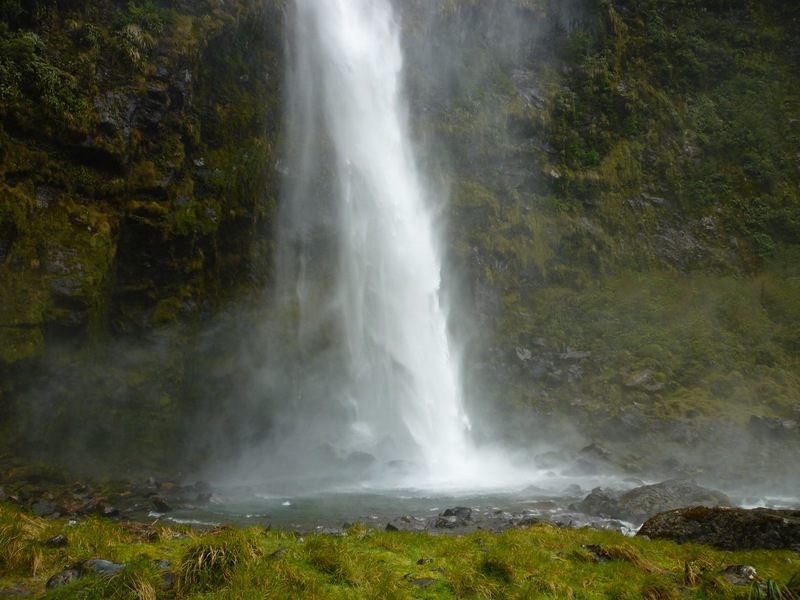 When Donald Sutherland and John McKay were prospecting in the area, back around the 1880’s, they came across this beautiful waterfall. 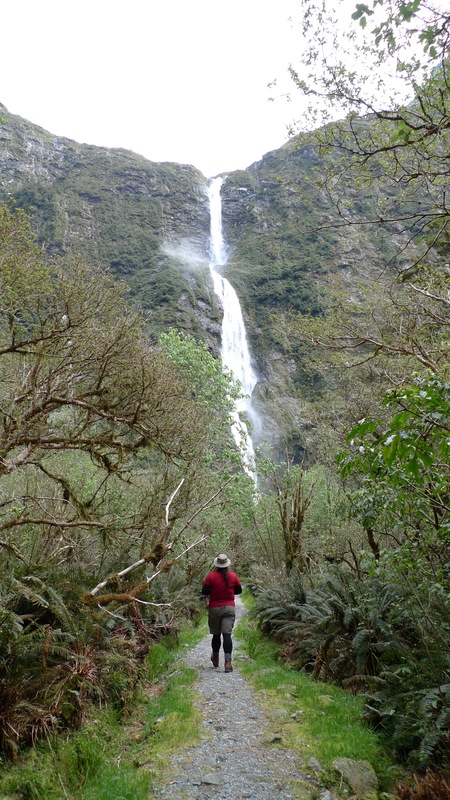 I think the story that the guides told us went that McKay was keen to have these most beautiful falls named after him, and Sutherland acquiesced. 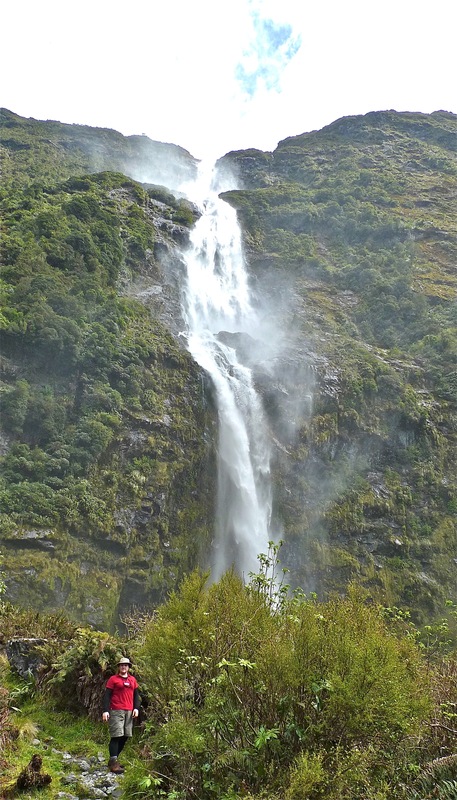 Not too long afterwards, they were astounded by the giant falls which, they thought must be the highest in the world! Taking turns, as is only fair, were duly named after Sutherland. Later they were measured and found to be the 5th tallest in the world at 580m. 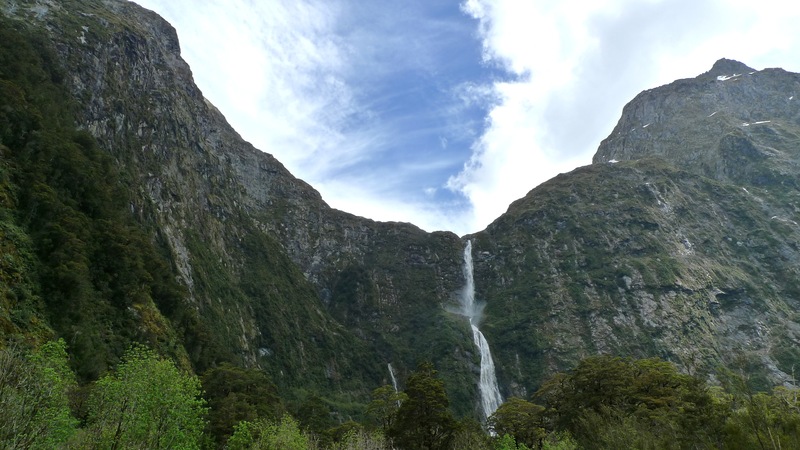 Looking up at one of the many waterfalls fiordland is famous for. 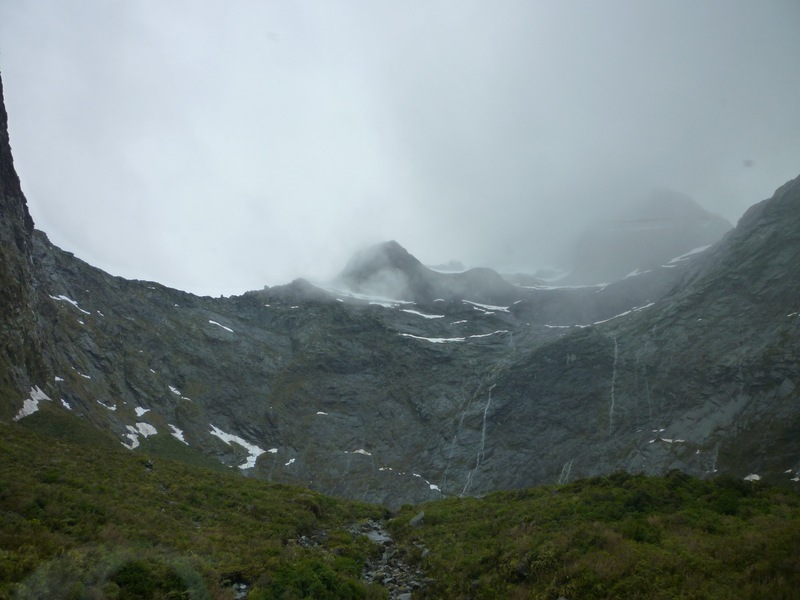 They get an annual average of 9m of rain on this side of the pass. The track starts getting increasingly uneven and rocky. Oh look, another waterfall. That’s a surprise. Steep and just a bit slippery; it wasn’t a just short section either. This section of track, completed in 1898, was carved out of the rocky cliff with pick axe and dynamite. It wasn’t a short section; I’m not sure now how long it took, but it would have been back-breaking work. We guessed that if a walker doesn’t reach a certain point by a cut off time, the guides know they aren’t going to make it and call in the chopper (it’s not something they like to mention). That’s why you don’t walk without travel insurance! I don’t know how much it would cost you if you didn’t have it… hundreds at least. The guides were pushing the option of a helicopter ride back to Queenstown instead of going by coach after the cruise on the last day. Sounded good, but you need to have at least 4 people willing to go for $500+ EACH (I think it was closer to $600pp). At first we thought they meant the total cost was ~$500 – when we realised it was per person – ah no, thank you. Spectacular as the flight must be, we’re not independently wealthy. 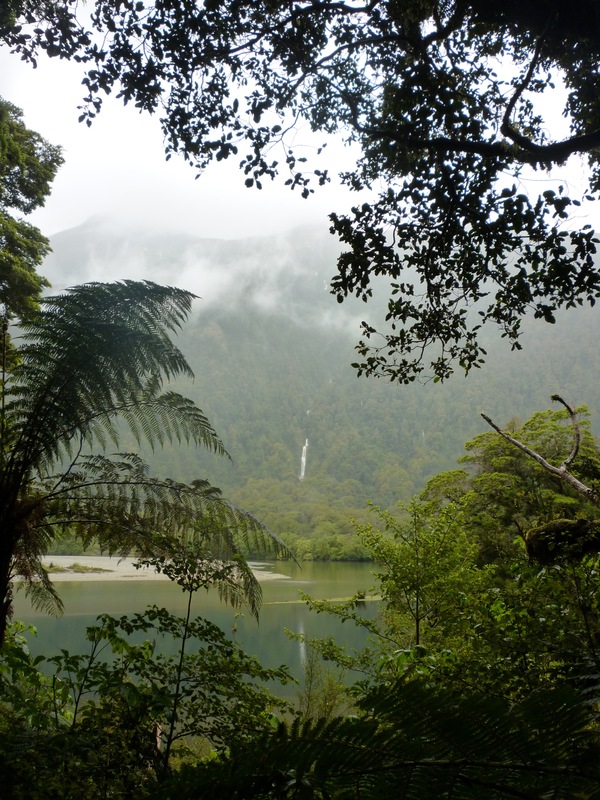 I mentioned in an earlier post that feral animals are a huge problem in New Zealand. Their native vertebrate wildlife consists mainly of birds who have diversified to exploit all the niches that mammals would usually occupy. A number of these species are extinct thanks to humans; the introduction of european and Australian feral species has also had a devastating impact on native animal populations. 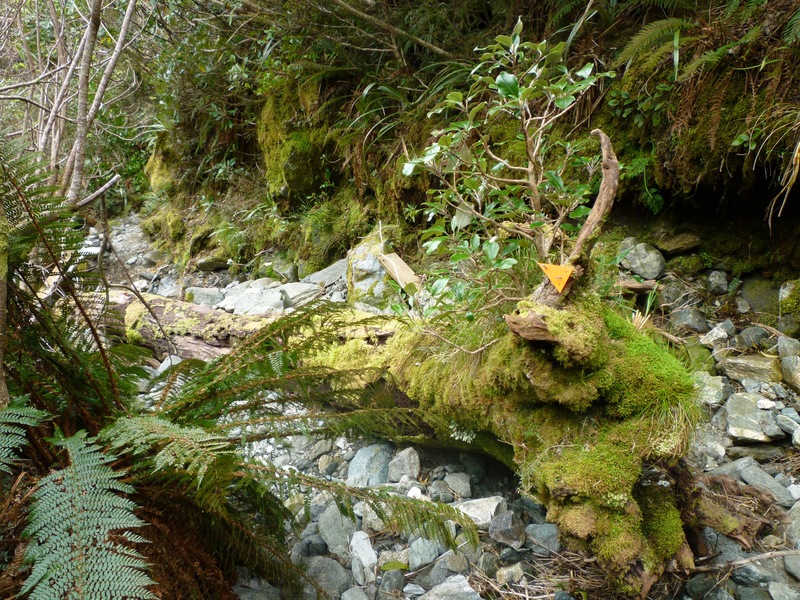 Trapping of feral predator species, such as ferrets and stoats, in fiordland is done to help endangered populations of native species such as the Whio, among others. 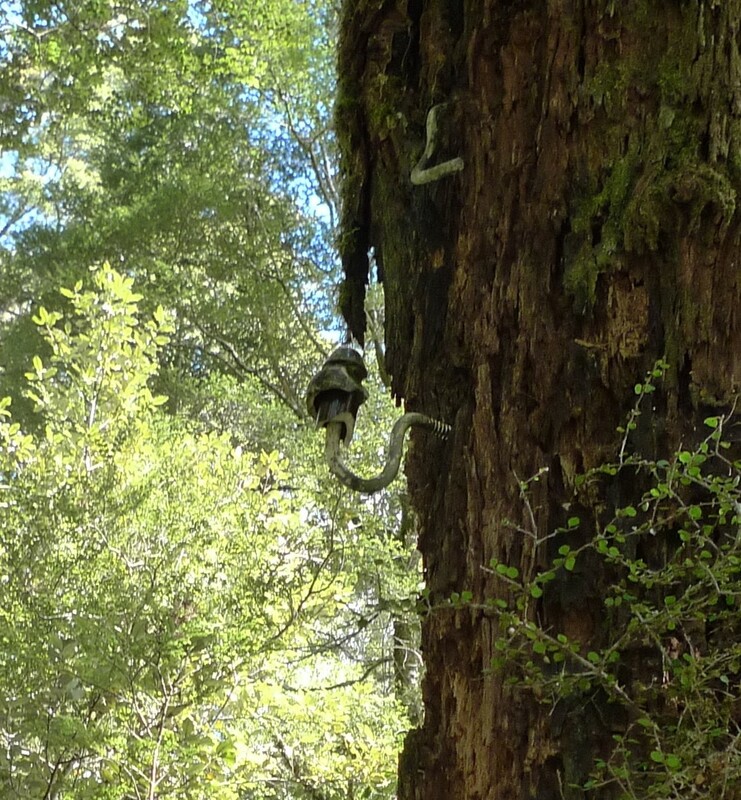 This trap is probably good for a smallish possum, too; another major feral pest. Beautiful as it is, we were just looking forward to getting to our lunch stop. Our lunch stop at Giant’s Gate. Raining again. Unfortunately still 1h 45m from Sandfly Point. It’s a lovely stop that I think we would have enjoyed more on a sunny day and if we weren’t being ceaselessly attacked by sandflies. 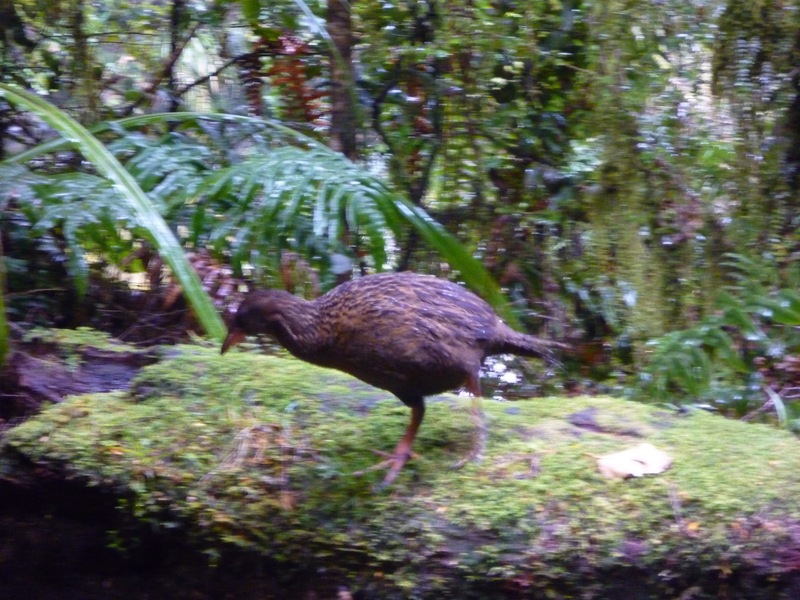 The best photo I managed to get of a Weka. 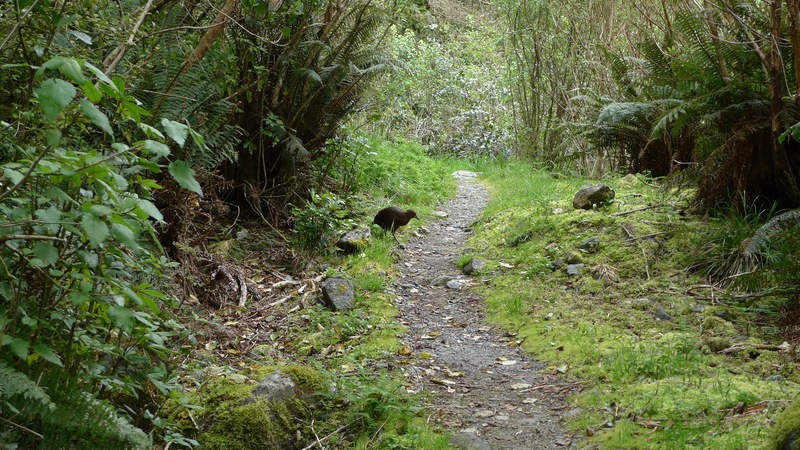 Weka are often mistaken by excited tourists for Kiwi, however unless you go to a birdpark where kiwi are kept, you are extremely unlikely to stumble upon one in the wild. 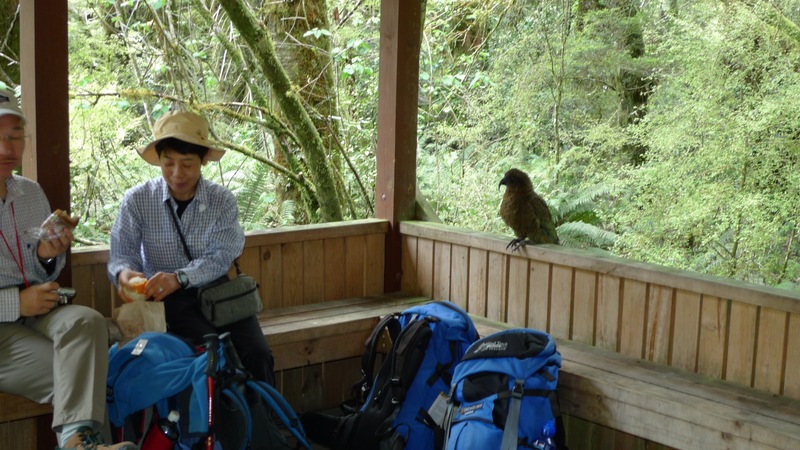 For starters, Kiwi are nocturnal and notoriously shy. 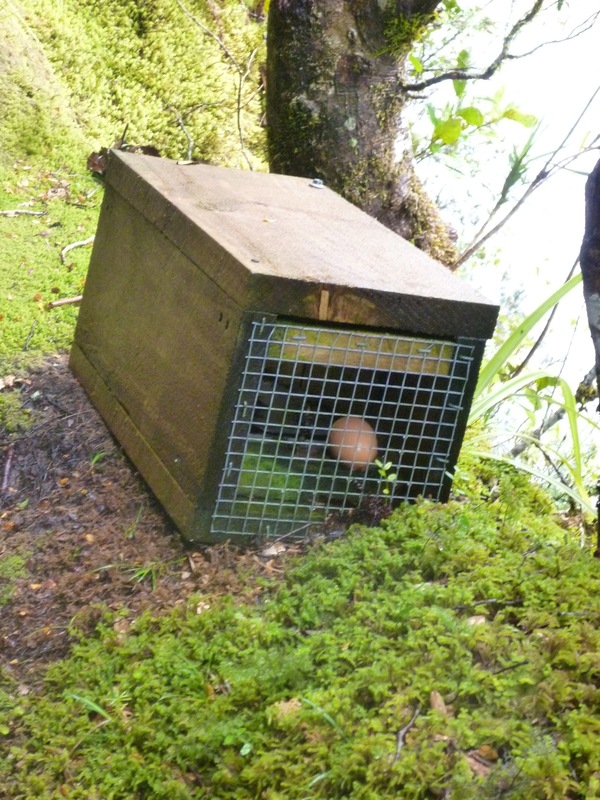 Weka are also not as cheeky or destructive as Kea are! This Weka was happy to ignore us as it went about its business while we ate lunch, coming to within 1m or so of the tables. The last 5.6km seemed the longest, but we got to Sandfly Point at about 3pm. 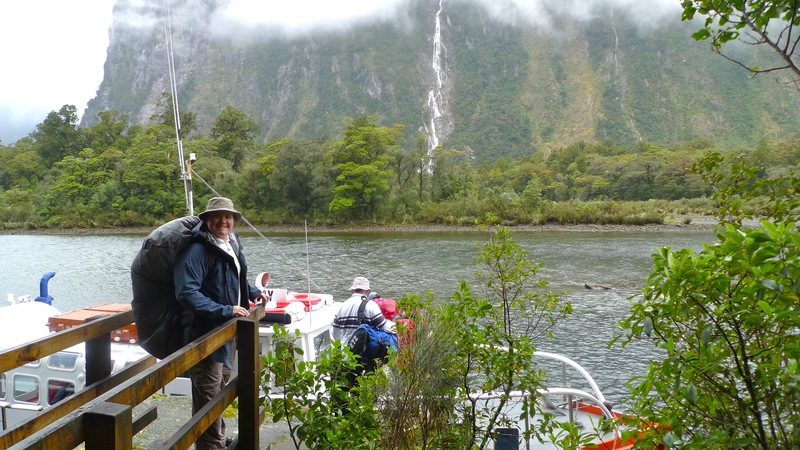 I couldn’t wait to strip off my wet clothes; fortunately the DOC hut was empty so I used that to change into dry clothing for the ferry ride to the Milford Sound wharf. Again the difference between the DOC and Ultimate Hikes facilities were noticeable. No screens to help keep out sandflies on the DOC huts, for instance. I was changed in just enough before we had to leave to get to the ferry. There was a photographer from Magic Moments at the 33.5 mile finish sign to take a photo of everyone who made it. Photo packs were available for purchase later that afternoon – which include a CD of photos of the track incase you didn’t come away with any good ones of your own, possibly, due to weather or choice. Can you tell we prefer to take our own? 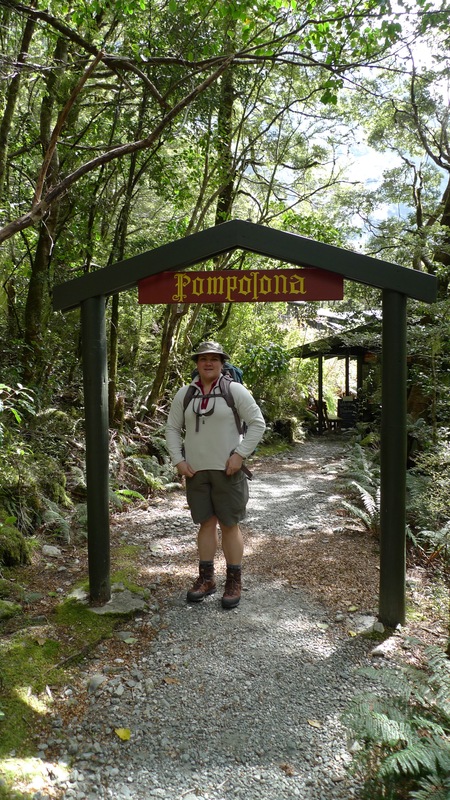 Our official Magic Moment photo at the end of the Milford Track, and my name tag. The final sign post is large and decorated with discarded boots. One girl had bought an old, comfortable pair of boots – she had worn them at home to test them, and they were fine… until the first or second day of the track. By the end her soles were only barely held on with tape and spare shoe laces. I don’t think she left them on the sign because they were all she had! It was a short if somewhat unexpected walk to the ferry, and a pleasant if cold 20 or so minute ride to the wharf. At that point I was extra glad I changed out of wet clothes! Stephen was frozen. Changed into dry clothes and feeling good! 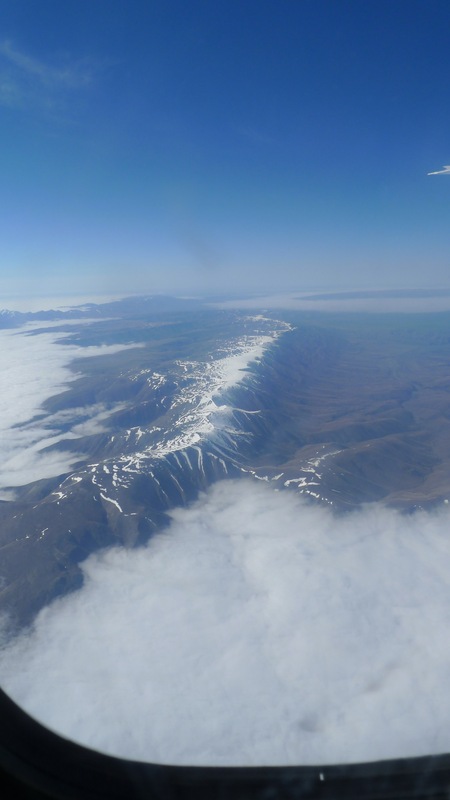 New Zealand is also known as the Land of the Long White Cloud – here’s one looking like cotton wool. 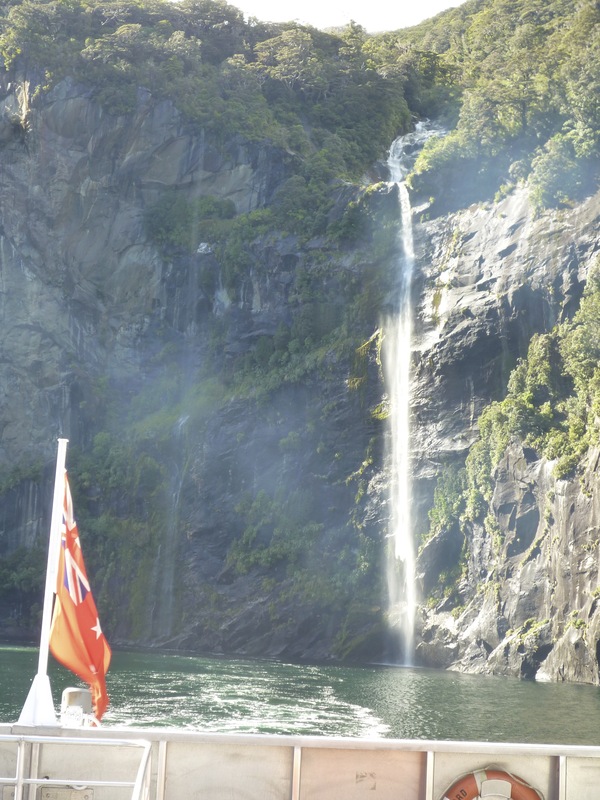 Approaching Milford Sound – those small buildings to the right of the falls. That small white boat there is actually quite large one. 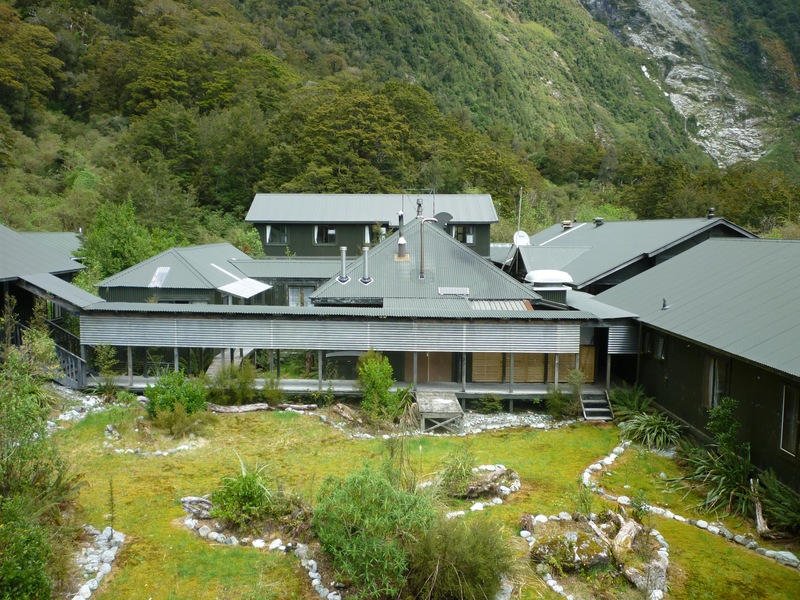 Mitre Peak Lodge currently operates mainly for Ultimate Hikes groups, although there are a few rooms for other people. It’s a nice place – Stephen says it feels like a nice kind of 60’s-70’s style university science facility. Doesn’t mean much to you? Plain but comfortable and nice. And you certainly can’t say the view isn’t any good. 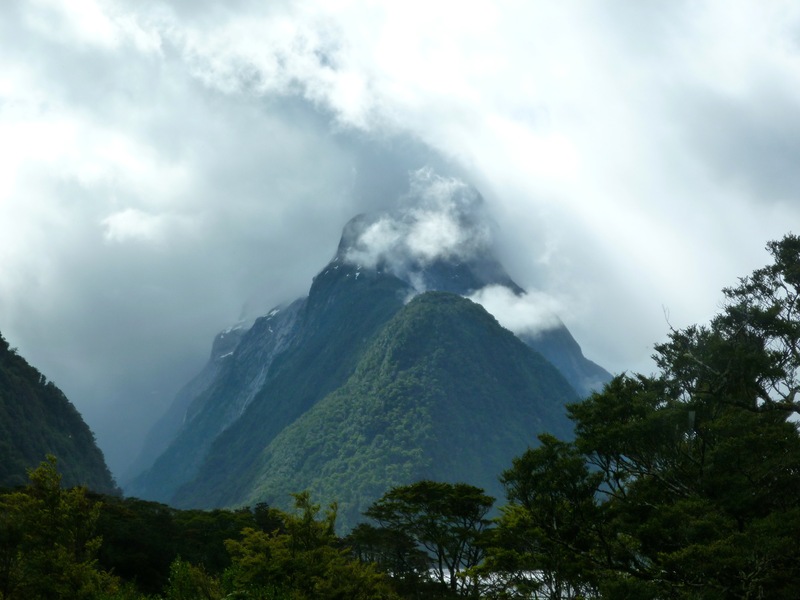 Mitre Peak rising out of the water straight out the front, either mysterious in the mist and clouds drifting like smoke, or standing proud and magnificent in the clear skies. Amazing. 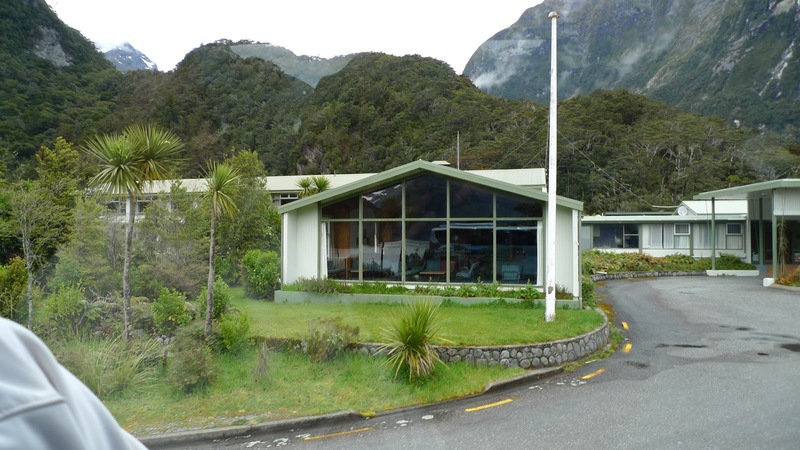 Arriving at Mitre Peak Lodge – about a 2 min bus ride from the Milford Sound pier. 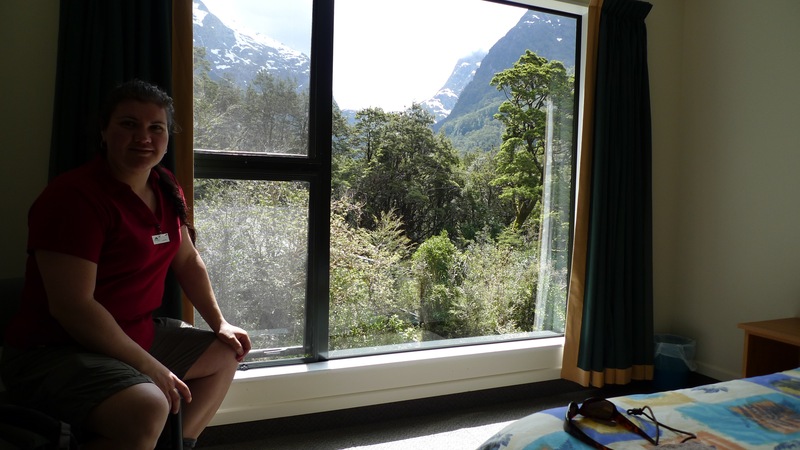 Inside the entrance of Mitre Peak lodge. Rooms above, drying room and gift shop below. 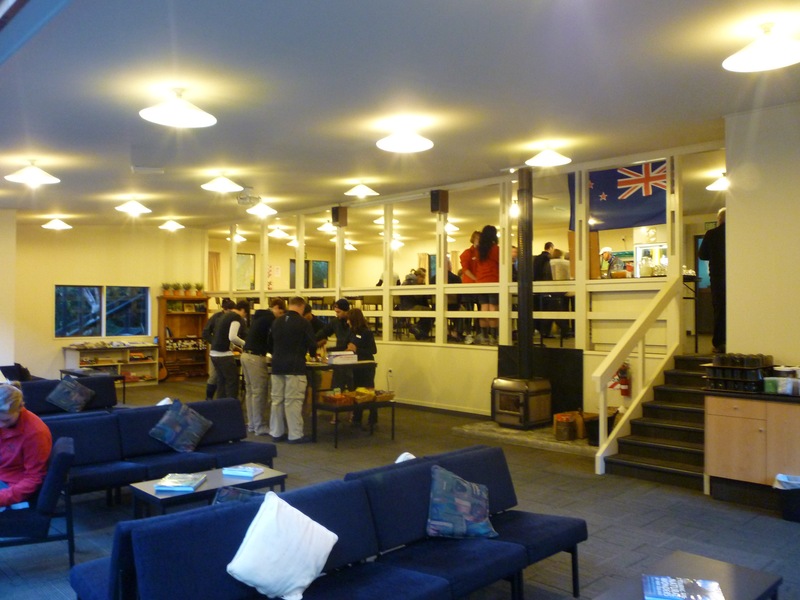 Lounge and bar area of Mitre Peak Lodge. The fireplace is made of greenstone – pounamou. These days (assuming you even had access to some) that would cost an absolute fortune! There was just one person who beat us there – the lady who was flown out. I felt sorry for her in a way – she had seen most of it and given it a go, but was it by choice that she was flown out? 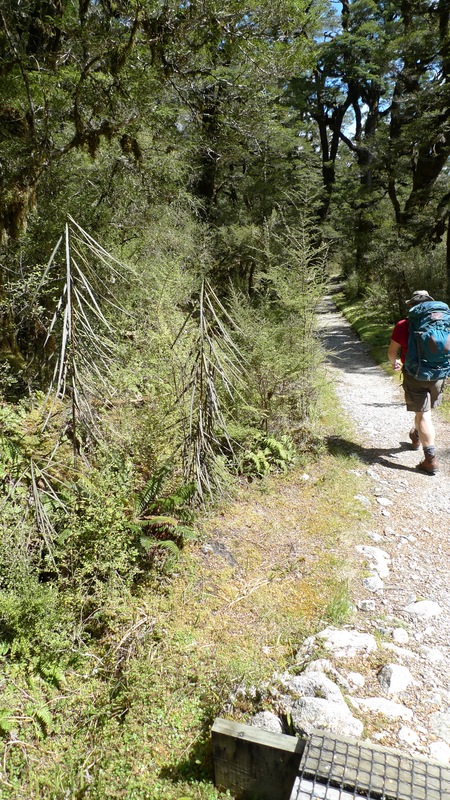 Should Ultimate Hikes be more strict about who they let start the walk? Again, I guess that’s what travel insurance is for. You set yourself a challenge and give it your best. And find out if you’re really prepared as what you hope you are! 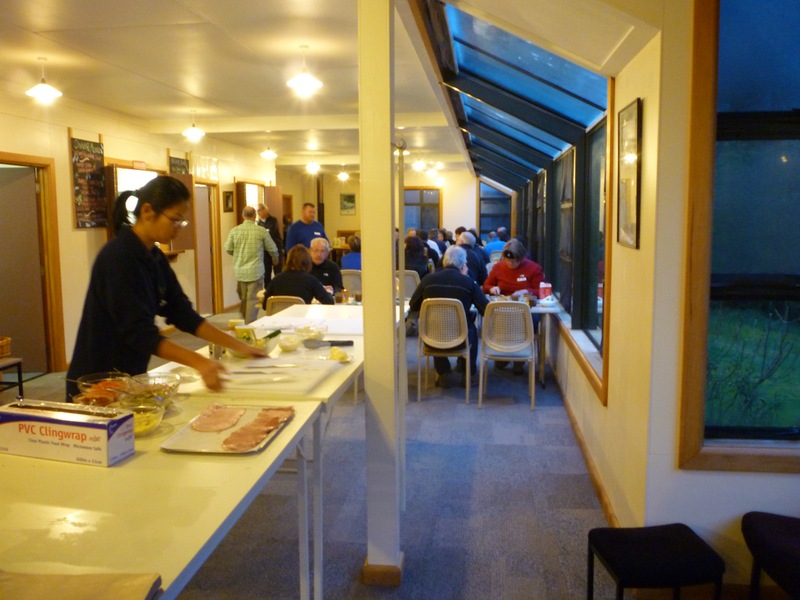 Once everyone had had the chance to hang up wet clothes and relax in the lounge with drinks, bread and dips, we were presented with certificates to say we’d completed the Milford Track. 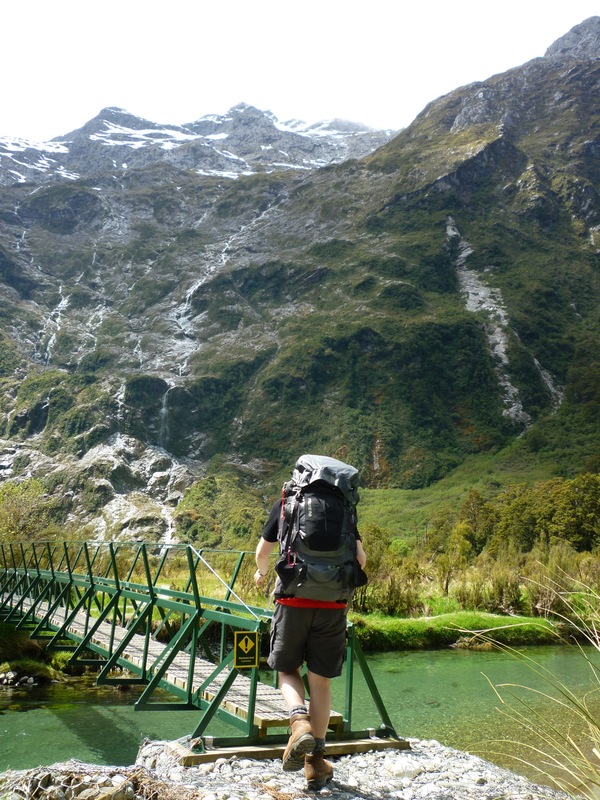 Just a quick note if you’re planning to walk the Milford Track, there is a really informative booklet that you can buy that has notes about points of interest, shown on a progressive map where you flip over each page as you walk along the whole length of the track. We purchased our copy after we completed the walk. It’s more-or-less pocket-sized. 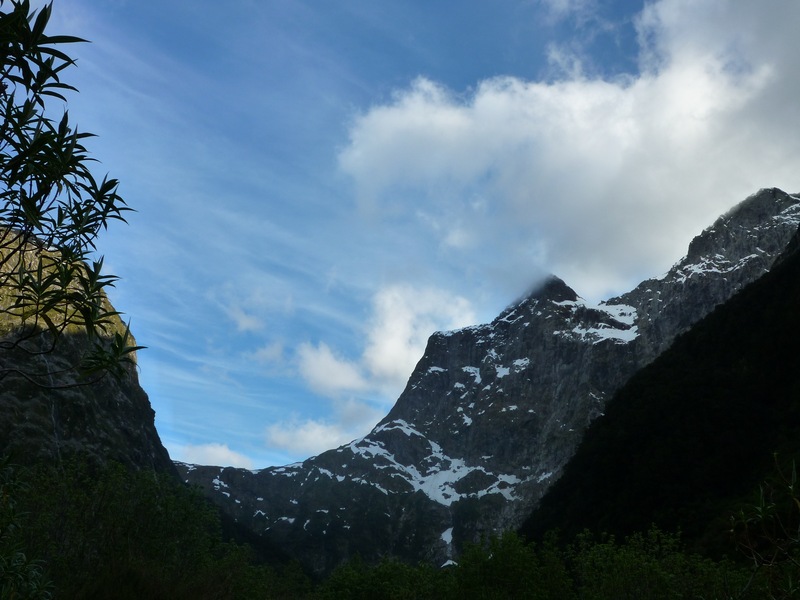 We had finished walking the Milford Track, but the Ultimate Hikes Milford Track experience doesn’t end there: read Milford Track Day 5 to see photos from our cruise of Milford Sound. 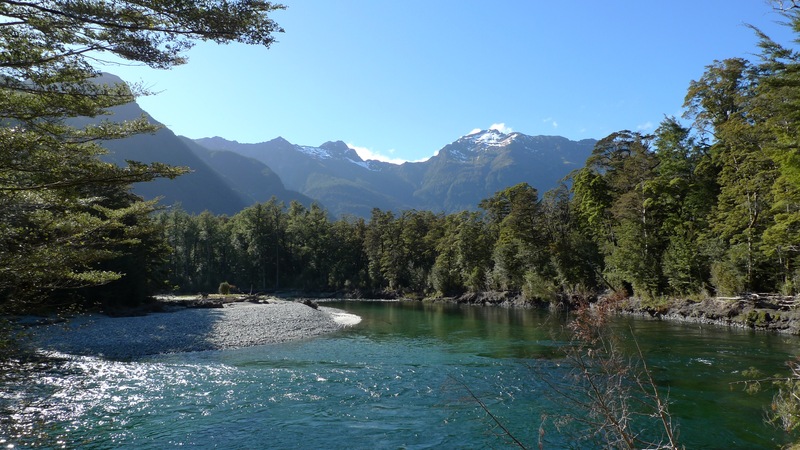 Categories: Holiday, New Zealand | Tags: Arthur River, Department of Conservation, DOC, Fiordland, Giants Gate Falls, Hiking, McKay Falls, Milford Sound, Milford Track, Mitre Peak, Mitre Peak Lodge, New Zealand, Quintin Lodge, Sutherland Falls, Tramping, waterfalls, Weka | Permalink. 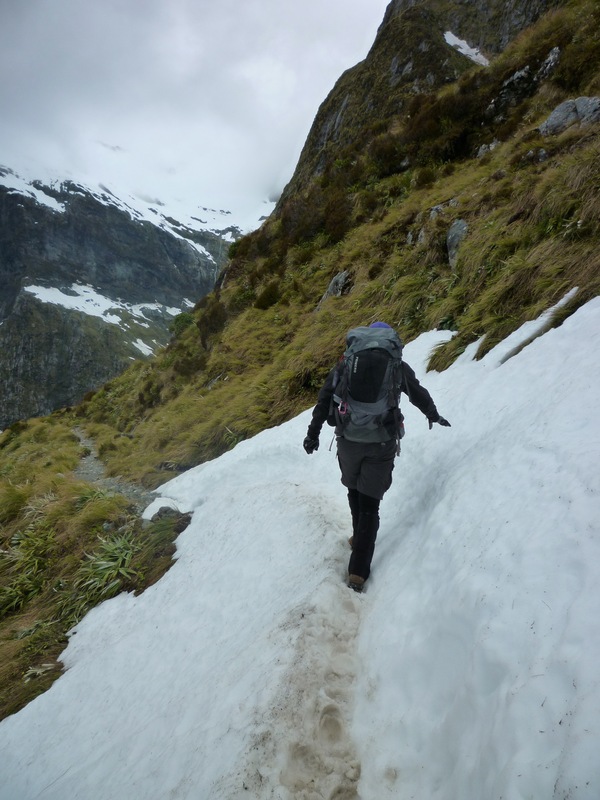 Crossing Mackinnon Pass is definitely the most spectacular day of the Milford Track… and the day that I (and probably everyone else) was most worried about surviving in reasonable shape! From Pompolona Lodge we would walk to the end of the valley, up over the pass, and down the other side to Quintin Lodge. Officially an 11 mile (17-18km) day, but again our GPS reading was a little different at 15km – there was, however, a good reason for the discrepancy (more about that later). 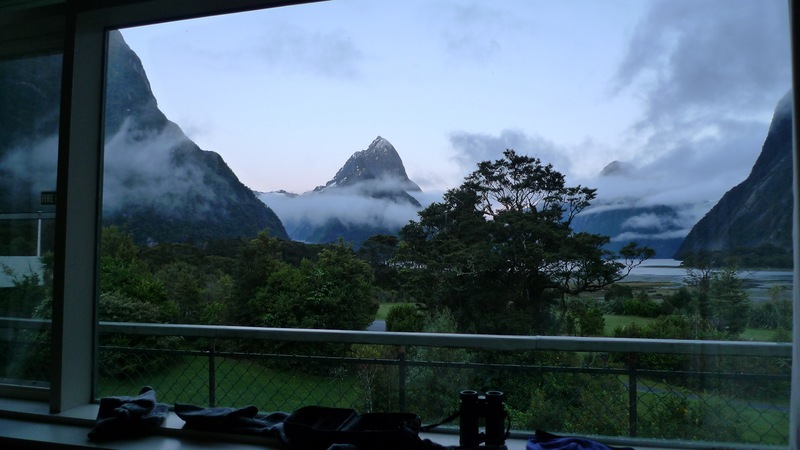 Mackinnon Pass from Pompolona Lodge, early in the morning. Mt Balloon is on the right of the pass. Such is the apprehension felt by most prospective hikers when contemplating this section of the track that Ultimate Hikes has a devoted a whole page to what to expect on this day. As it turned out it wasn’t nearly as challenging as I’d feared. Because it is expected to be a long, tough day, we we woken by the lights coming on even earlier that morning – 6:15am! – and we were to be on the track between 7:30-8:00am. Stephen and I had intended to be ready by 7:30am, but didn’t manage to get underway until 7:45am. We started out at a good pace, determined to make up a bit of time. 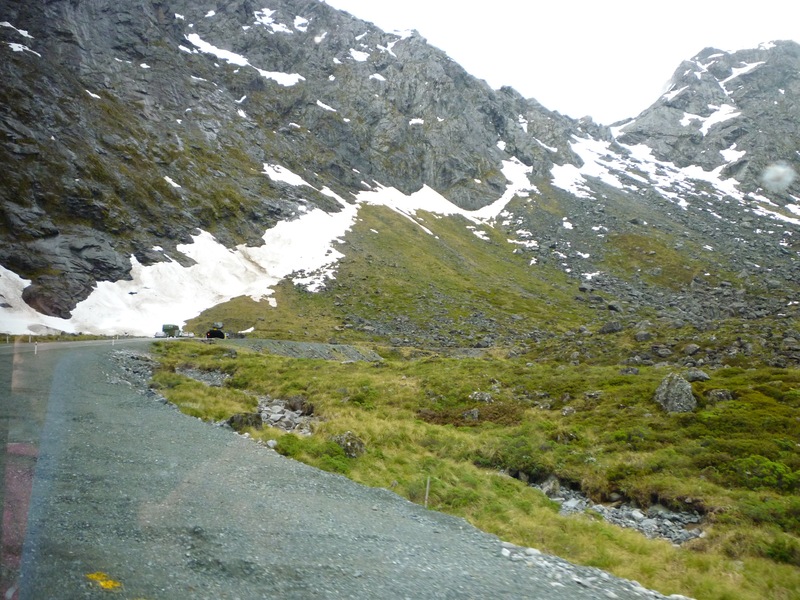 I was hoping to encounter snow/ice patches as we crossed the Pass. 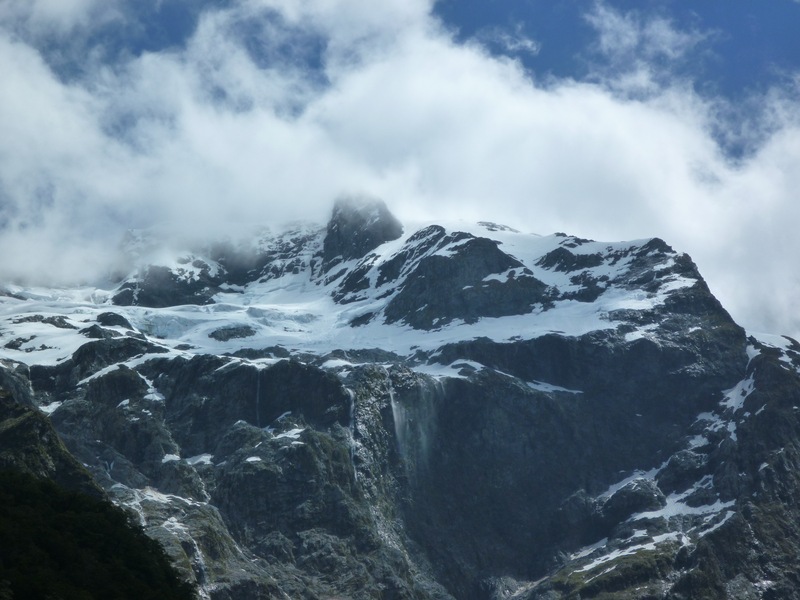 Even if we weren’t to be that lucky we knew it would very likely be cold up there, despite the fine start to the morning, as weather in alpine environments is notorious for changing extremely quickly. With those thoughts in mind we added long thermals underneath the shorts and t-shirts ensemble we wore yesterday – quite a fashion statement, I know, but not only does it work in keeping you warm, but out on the track no one cares what you look like (too much). Our jackets were also handy at the tops of our packs. 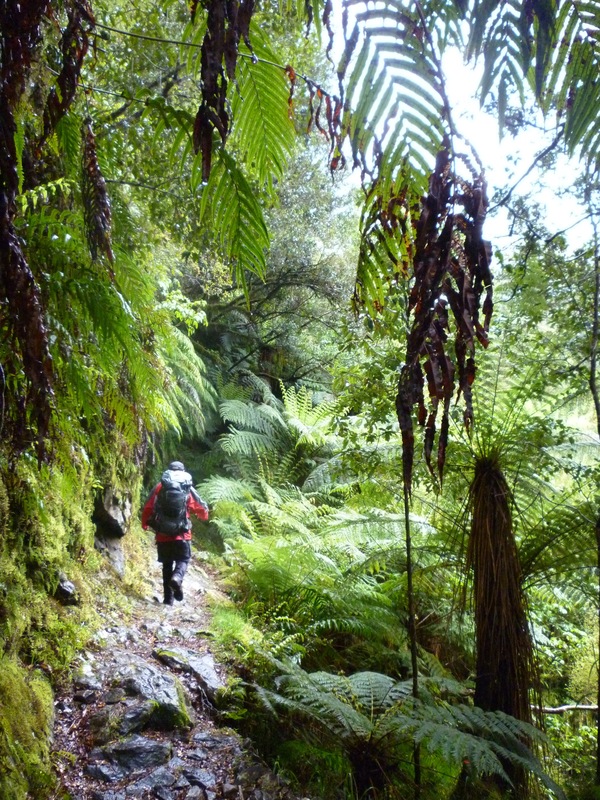 It wasn’t far to the next DOC hut where we stopped for morning tea, but we didn’t linger. It took a while to get to the start of the proper climb up and the 11 switchbacks. 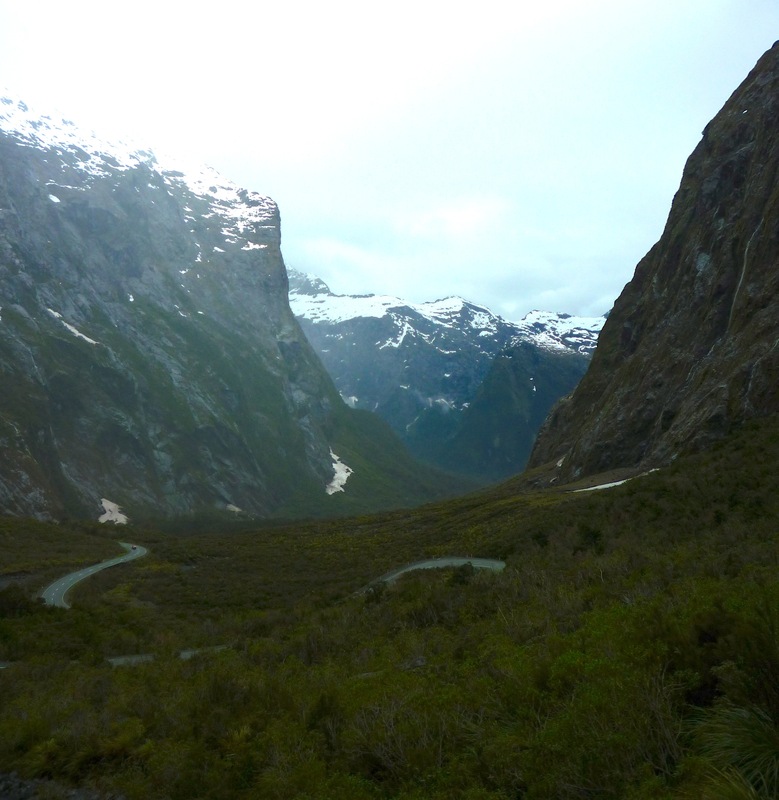 I’m afraid I don’t have photos of what it was like on the switchbacks to share with you, incredible as that sounds. 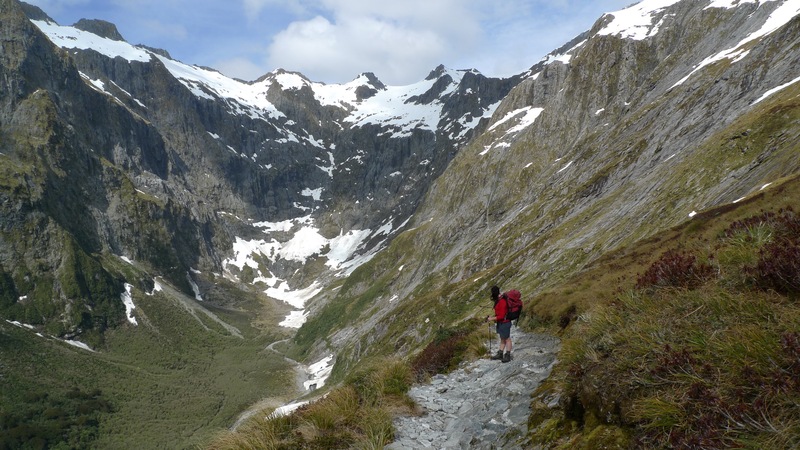 In our minds this was the challenge of the trip – the part that everyone talks about – the huge climb up to Mackinnon Pass. The part of the track that can turn into a waterfall when it rains heavily. When it came to it, it wasn’t too hard… I think the start of Mt Warning (northern NSW, Australia) with all the steps is harder. Still, it was eyes down (due to the uneven surface) and legs moving as we kept up a steady pace (you might say a quick march!) and so caught up and passed a number of others (all labouring whilst trying to use their walking sticks in loose rocks!). I find keeping a steady pace is the key… too much stopping and starting is more wearying than staying in your rhythm and pushing on. Everyone’s different though – and the guides do stress that it is not a race. We weren’t far from the top when we caught up with the second guide who walked with us to the top. There were a couple of patches of snow before the top, but nothing much. Still, for a Queenslander, snow is snow! My wish had been granted. 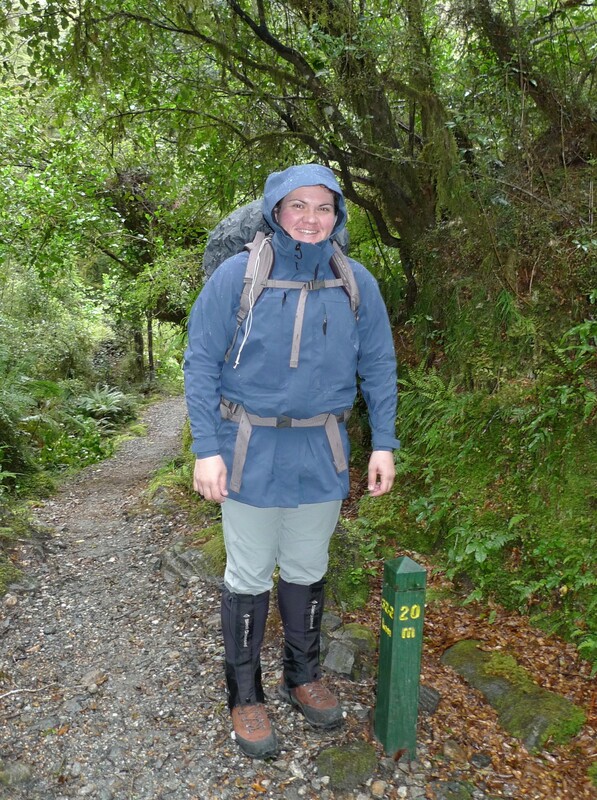 Stephen had his gaiters on, but I didn’t bother with mine, wanting maximum ventilation instead! Woohoo! Snow! A wee bit, anyway. Mt Balloon rising up in the background. There were a maybe half a dozen people there at Mackinnon’s monument before us. 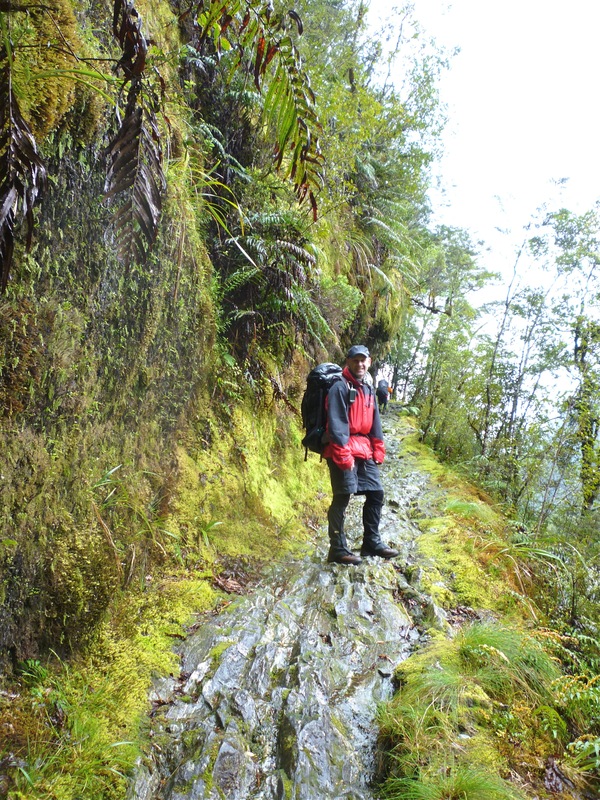 Claude (senior guide) pointed out the 12 second drop on the other side of the pass – the short (and terminal!) 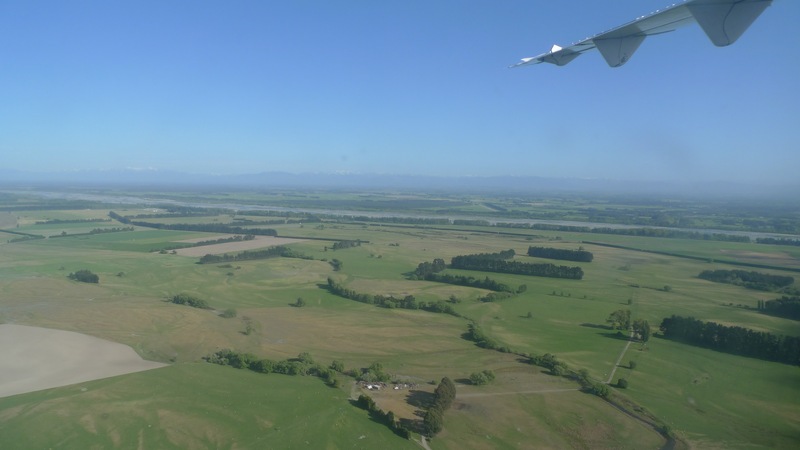 way down – from where we could also see our hut for the night (Quintin Lodge) and the old grass runway. Now that everything’s chopper’d in I don’t think it’s used anymore. 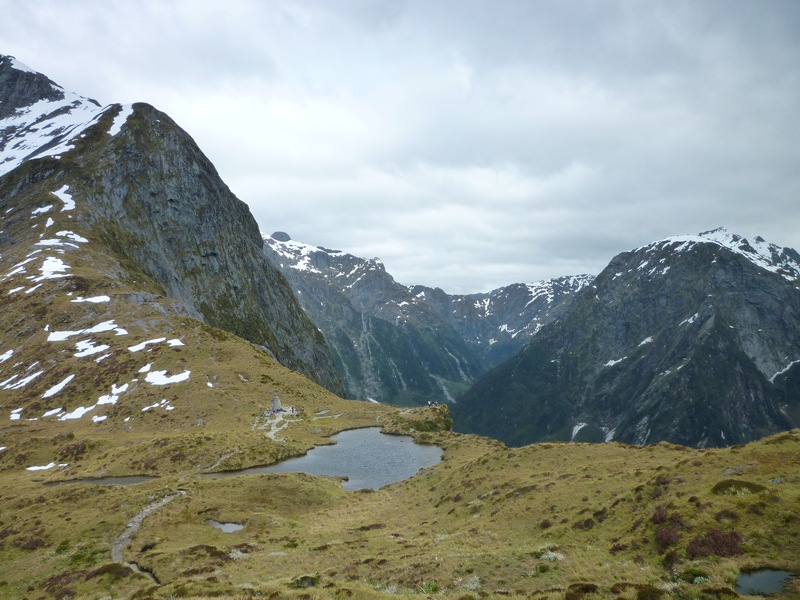 Standing at the 12 second drop, looking down the other side of Mackinnon Pass to Quintin Lodge – this was taken with my standard (non-interchangeable) camera lens, not a fisheye or anything fancy. 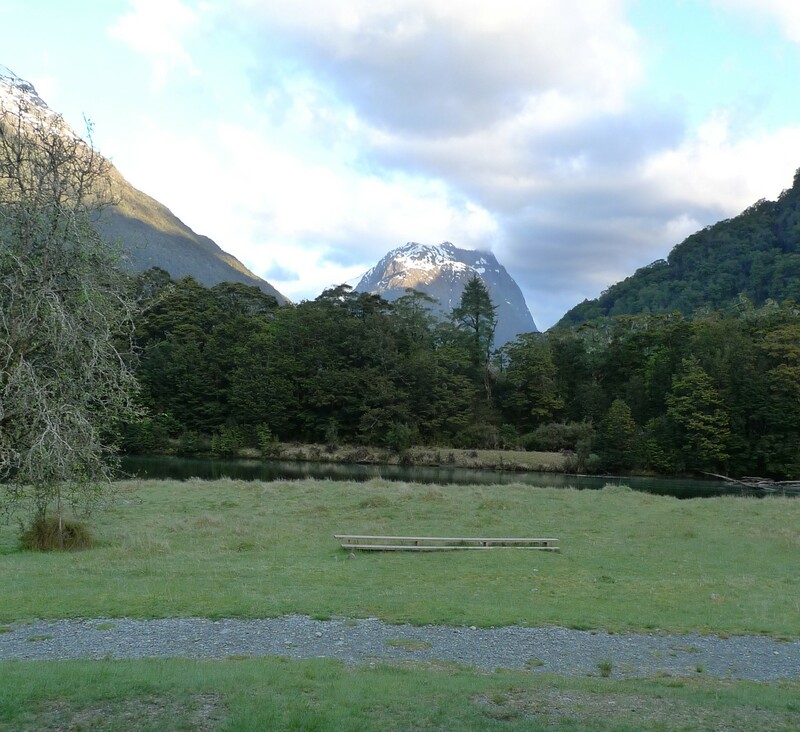 The airstrip points the way to Milford Sound. Looking to the right from the 12sec drop, the track passes below Mt Balloon and down the gully (if you can call it that) between the mountains. Pass Hut was still a short walk away, over a small hill that marks the highest point of the track. The weather was starting to close in from the west, but the view back down the valley were magnificent. They say the toilet there has the best view in the world, and I can vouch that, on a good day, they’re not far wrong! Continuing on to the highest point of the pass. Mt Balloon rises before us. Looking back to the Memorial and 12 sec drop lookout. Mt Hart to the left. 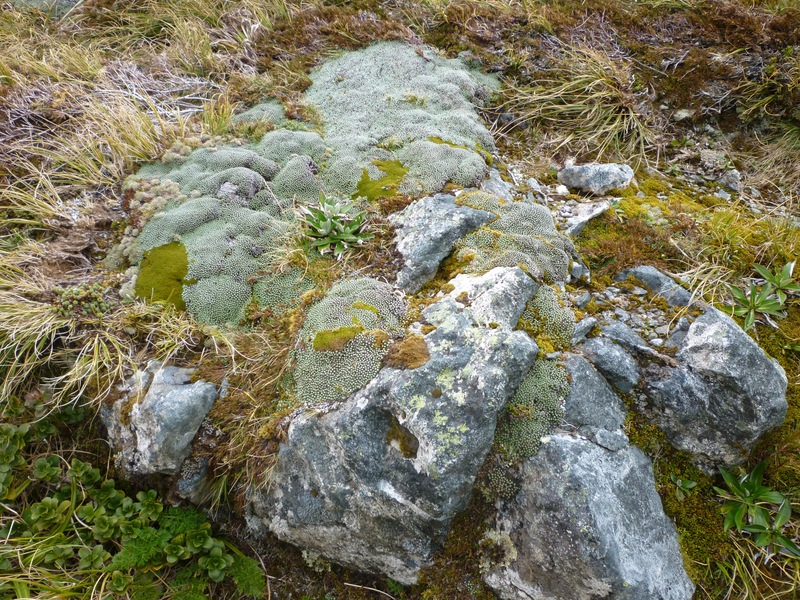 The landscape is BIG and can dwarf everything we do and achieve just by existing. We made it!! Looking back down the Clinton Valley – the way we’d come. Pass Hut is designed just provide shelter from the weather during your lunch stop, not for camping in. 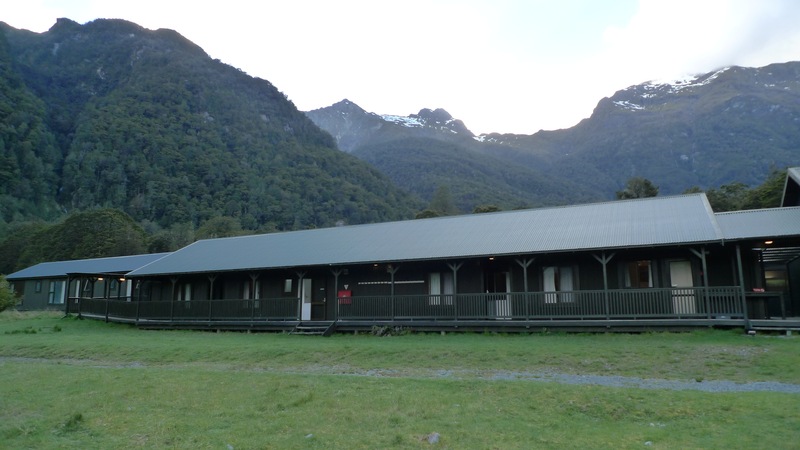 It’s a long rectangular building divided in two: one side for independent walkers to use, the other side for the Ultimate Hikes group. Our side had a small kitchenette so that the guides can offer us a hot cup of soup or hot chocolate when we walked in. I don’t believe the other side had such luxuries. 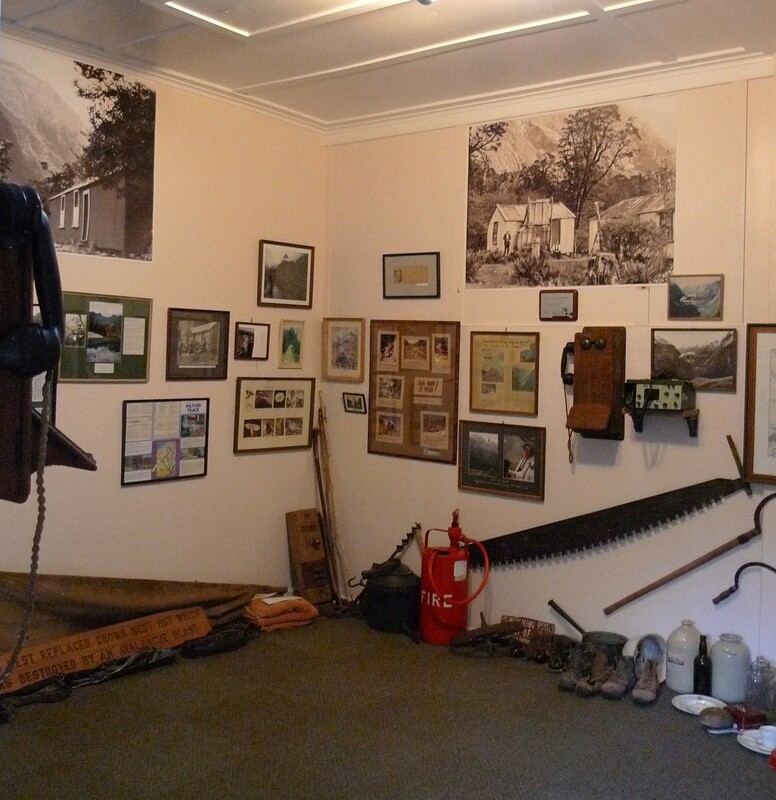 There are benches around the walls for everyone to park their rears – packs (and walking sticks) get dumped in the middle of the room. 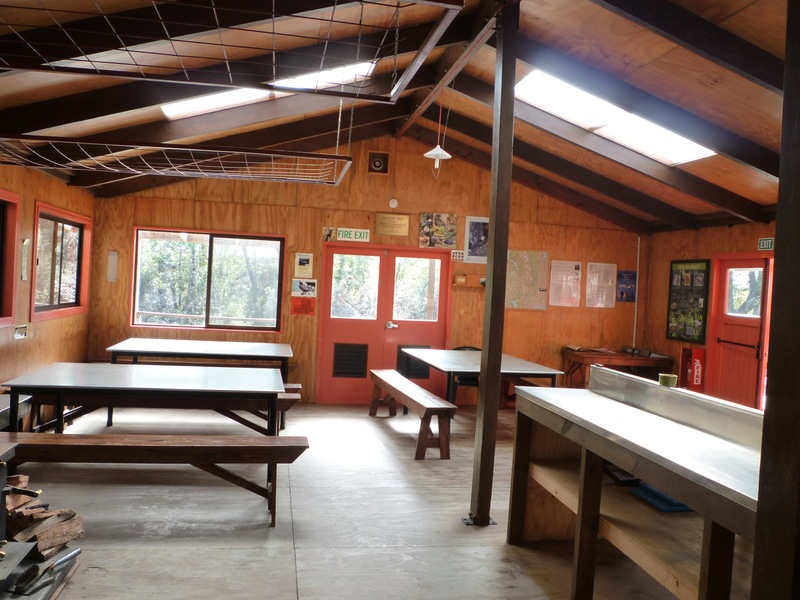 Inside the hut; benches along the sides, and double entrance to keep out the weather. And two very nice DOC workers seeking a hot cuppa. Despite the numerous steaming bodies at lunch quickly fogging up the windows, once we stopped walking it didn’t take too long to start feeling how cold it actually was. 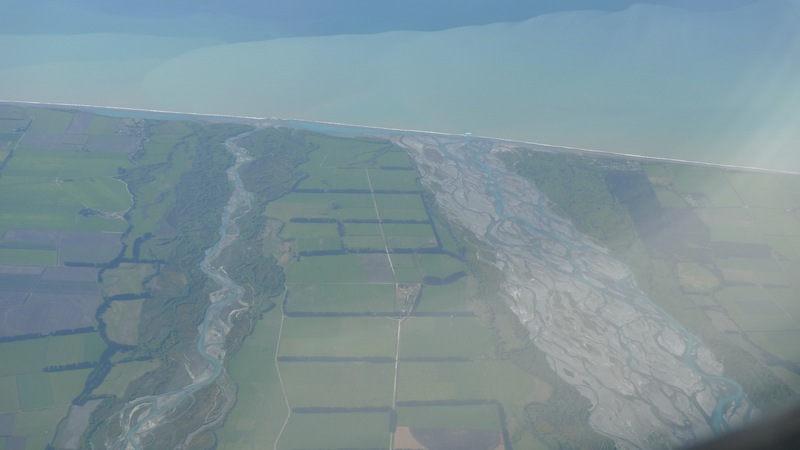 Close-up of Tutahuna. 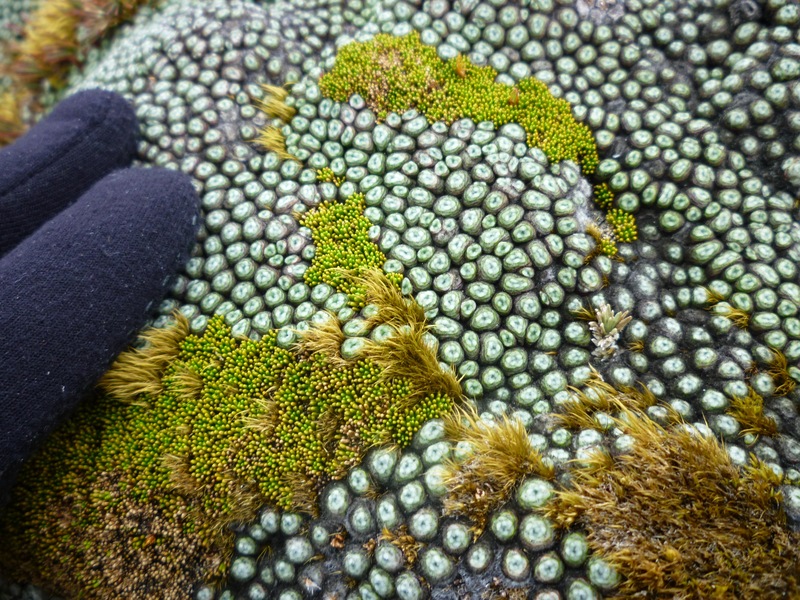 Looks a little bit like coral to me. 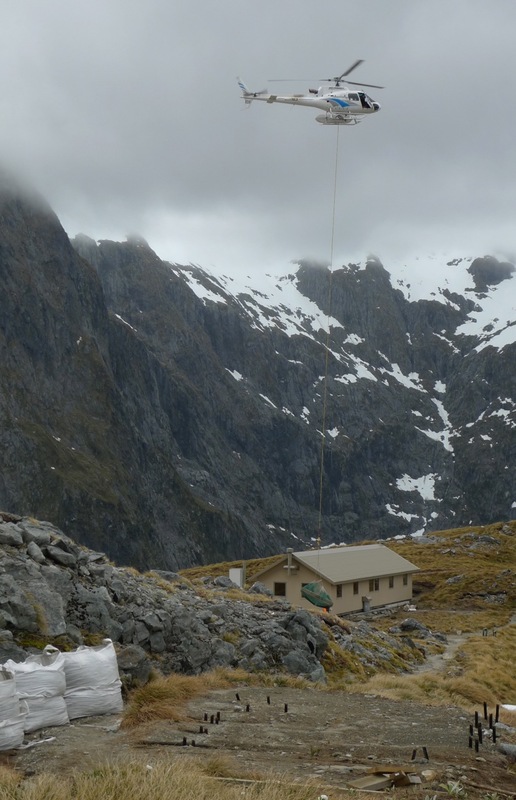 We weren’t far from the hut when a chopper carrying a load at the end of a cable came up the valley in front of us and almost right over our heads! Seeing that load swinging pretty low in our direction was a bit frightening. It was possibly not as close as it felt, but we’d have been in trouble had the cable broken. It was bringing supplies packed in barrels to the two DOC workers who were working at the hut. 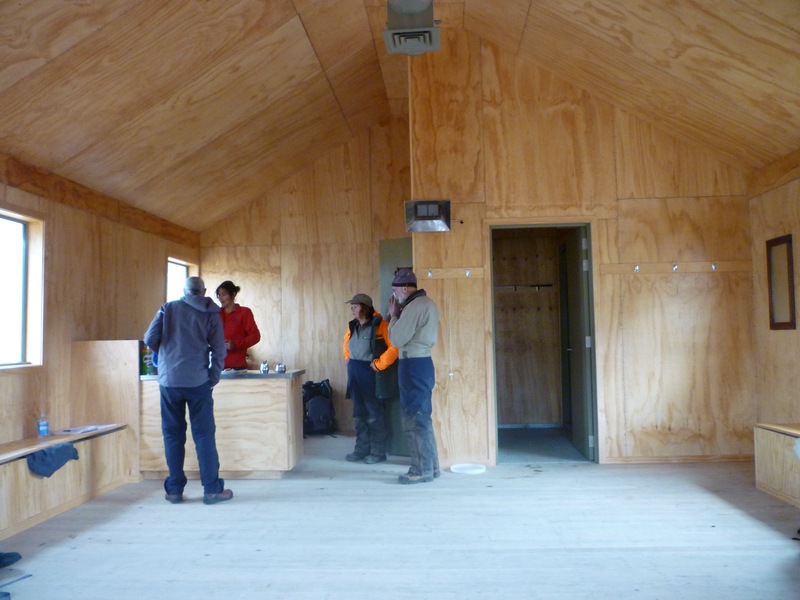 The hut is brand new and they were finishing off the paths and garden area around the hut. 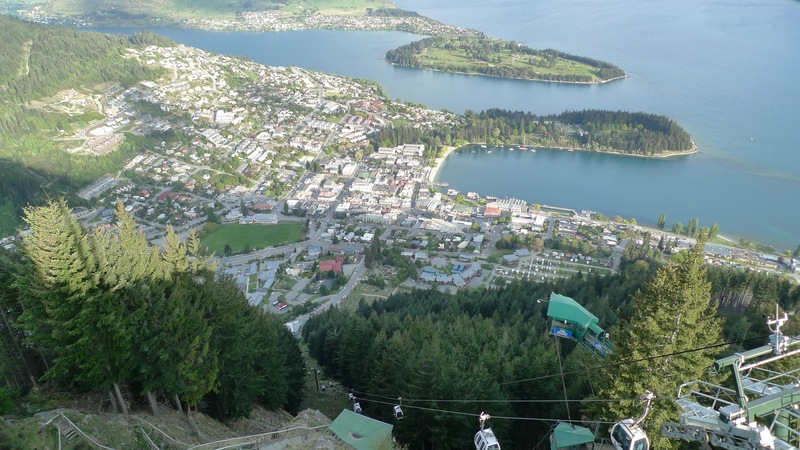 We continued on and down – a long way down. From the pass it’s 900m down to Quintin Lodge. If you ever have walked down the stairs of a high-rise building during a fire drill and thought that was a long walk and a bit hard on the knees, try multiplying it by however many times to get to 900m, take out the handrails, add in rain, backpacks and slippery stones and you’re nearly there. But the view on the track is infinitely better! A section near the top of the main track was closed due to avalanche danger from a nearby glacier, so we had to take the Emergency Track which leaves the main track after the 16 Mile post and meets up with it again before the 18 Mile post. Stephen managed to take a photo of every mile post on the way except for number 17, and the last one at the 33.5 mile mark at Sandfly Point which had a professional photographer there. Main Track closed – instead of continuing across the hill, the Emergency Track heads pretty much straight down for a bit. Great use of a wheelbarrow. The Emergency Track is steep and rough compared to the Main Track. 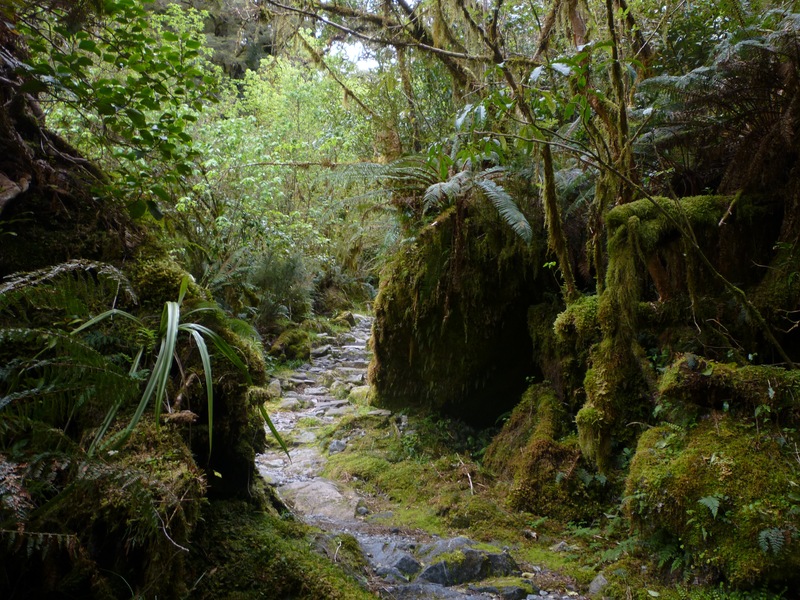 Reminds me of a few tracks around Cradle Mountain. Creative location for track indicator – but hey, it works! 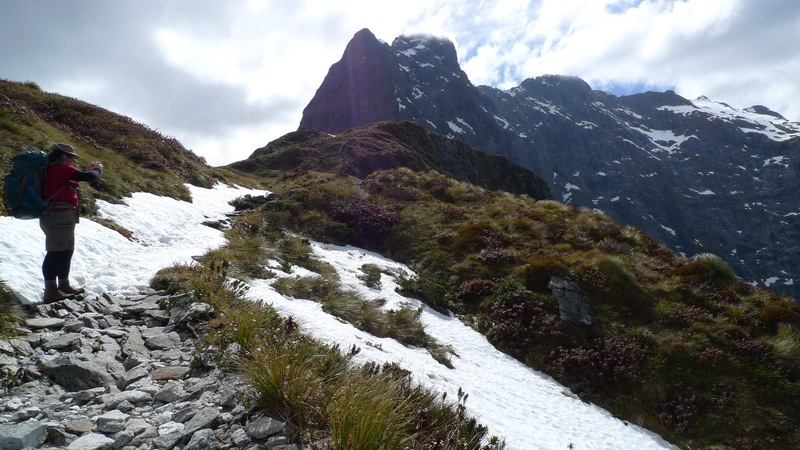 Looking back up to Mackinnon Pass – probably about half way down in altitude but definitely not in kilometres (miles) to the lodge. The descent wasn’t too hard, though I concede by the end even I was starting to feel my knees and hips – just a little. We didn’t dwadle, but took the time to be careful all the same. 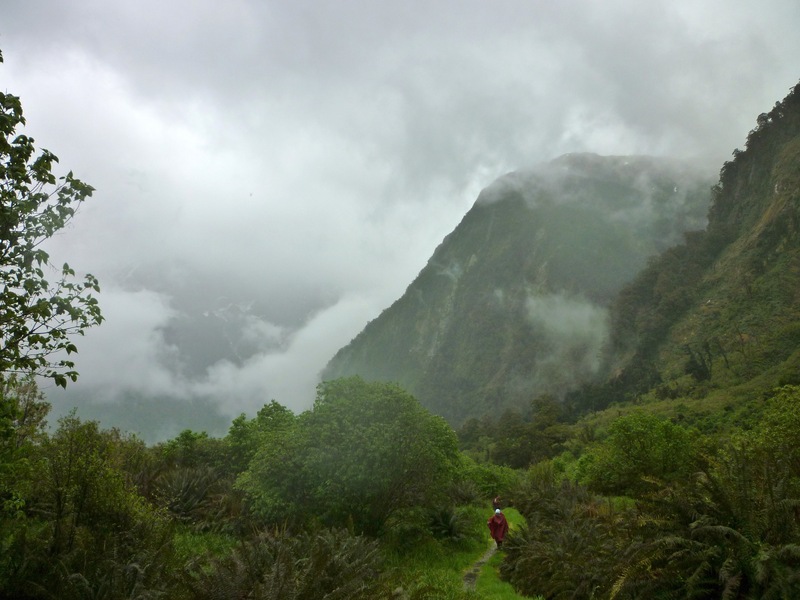 It had clouded over, and there were intermittent showers – we were lucky there wasn’t heavier rain. There were a couple of sections of boardwalk with plastic or chickenwire attached for grip – the guides had warned us that these sections can still be slippery and most accidents happen there because people subconsciously relax when walking on boards. I’m not sure why there were so few leaves on the the trees at the top of the forest. 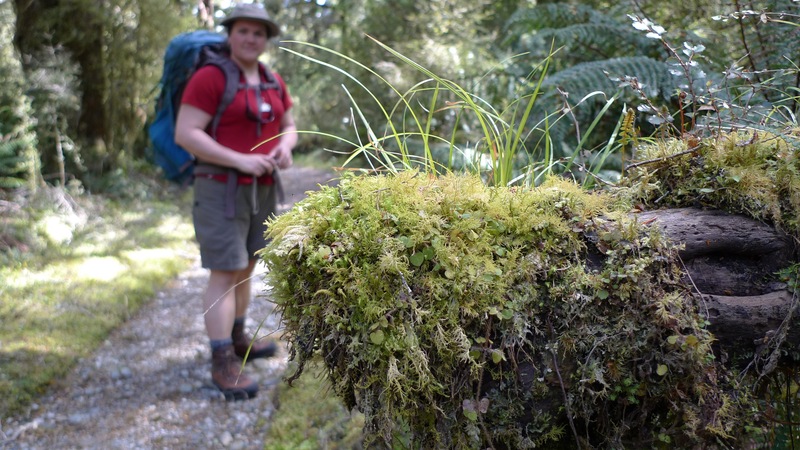 There was plenty of moss and ferns. 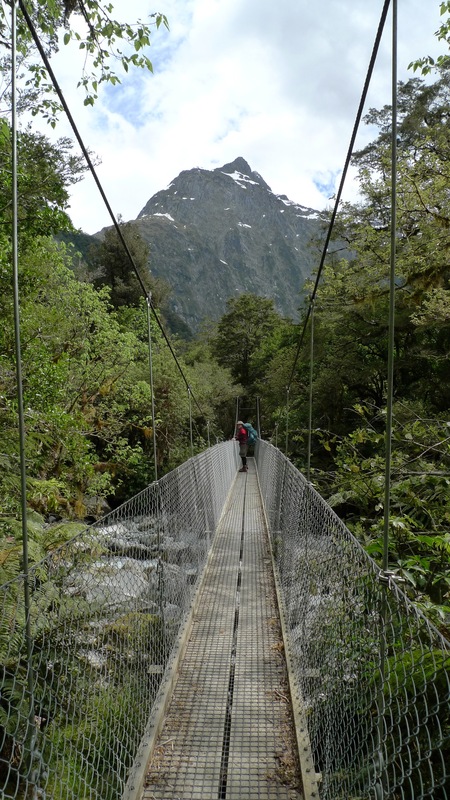 Crossed a few suspension bridges. Mt Hart in the background. 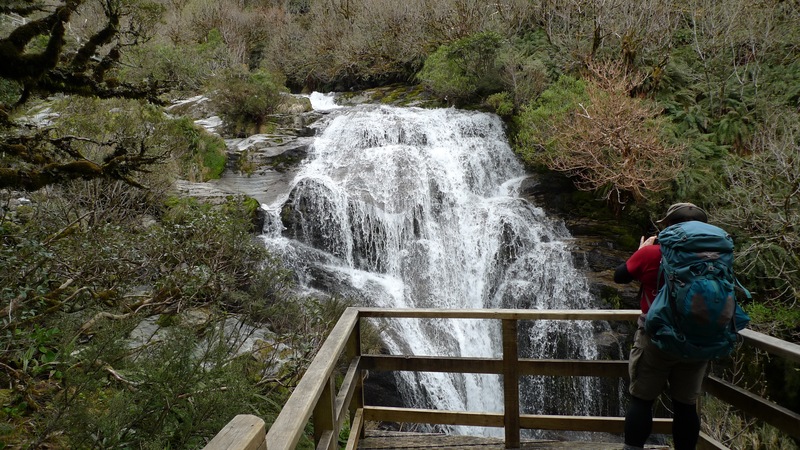 Lindsay Falls – possibly the lovliest we saw that day. We were about half way or so down when we came to pass an older couple of independent walkers, who kindly moved to the side for us. I made a little slip just as we passed – I didn’t fall or anything – and made a comment that it doesn’t pay to be complacent. Just as we passed, the lady who was in front, demonstrated exactly why walking sticks can be hazardous. Seeing her next step could be tricky, she put her sticks on the smooth rock, took a step, the sticks slipped, and she was on her backside. Stephen helped her up and she was ok. 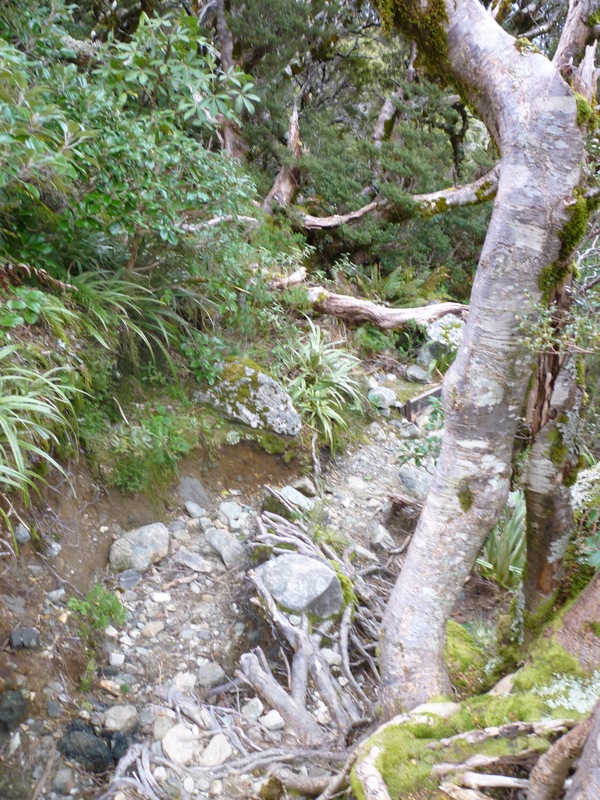 It could have been worse – fortunately wasn’t – but walking sticks with metal points aren’t made for rocks. I wonder how many people in our group found that out in the same way. 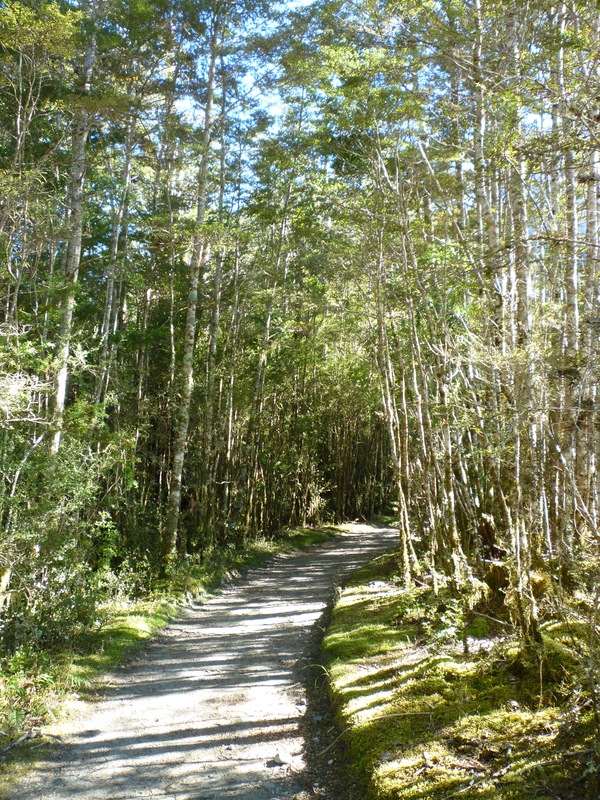 The track and bush around the last few km’s or so of the walk to the lodge felt very similar to Lamington National Park (Gold Coast hinterlands, Australia) – a well graded track of dirt and rocks with lush forest on either side. 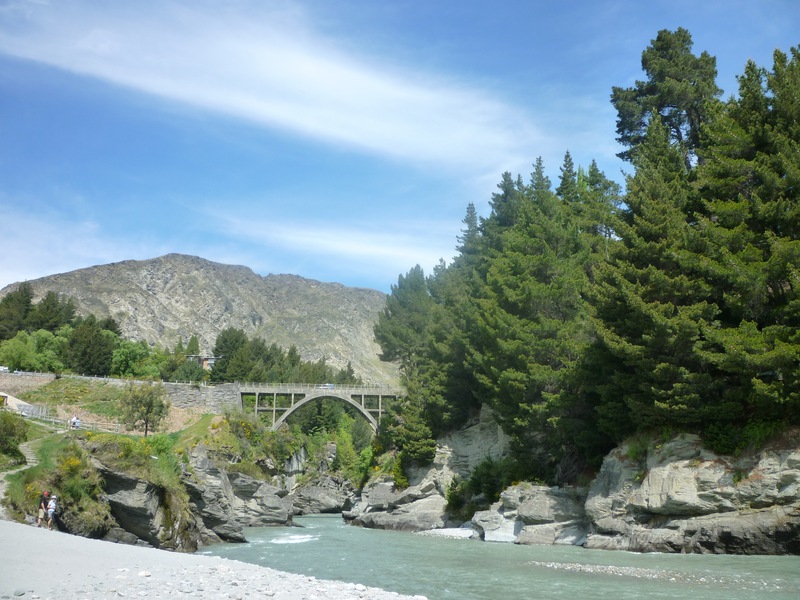 It was there that we heard the chopper flying in low again, and hurried over the last bridge to find ourselves at the end of the path and Quintin Lodge – finally! We were in time to get a few pics and see it fly off again. We were excited; I’m sure the staff were wondering what on earth for – hadn’t we seen helicopters before? Keep in mind they get flown to work in one – they really are a fly-in, fly-out work force! The buildings that make up the Quintin Lodge complex are arranged in a square. Our room was again very nice, with a view overlooking the yard between the buildings with the mountains rising behind. 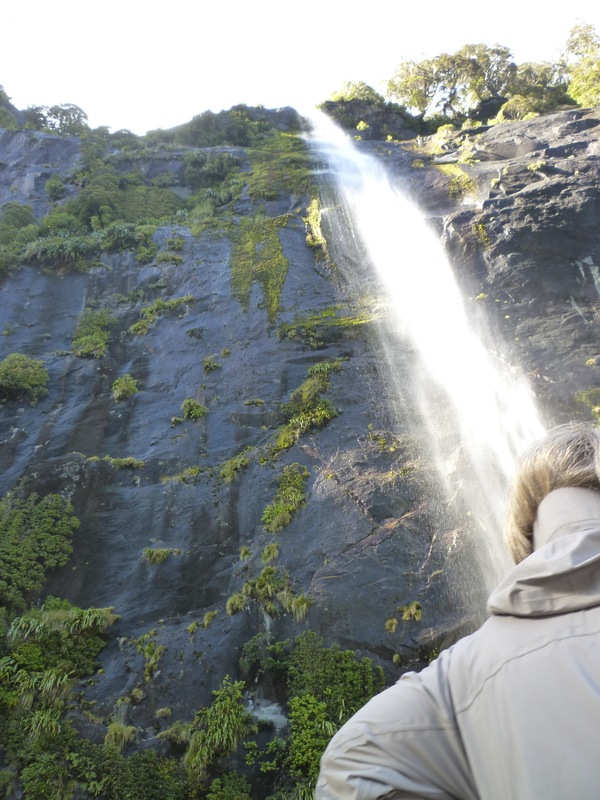 Because today’s walk wasn’t nearly as long or hard as expected, we decided to do the optional side trip to Sutherland Falls which are the highest falls in New Zealand. 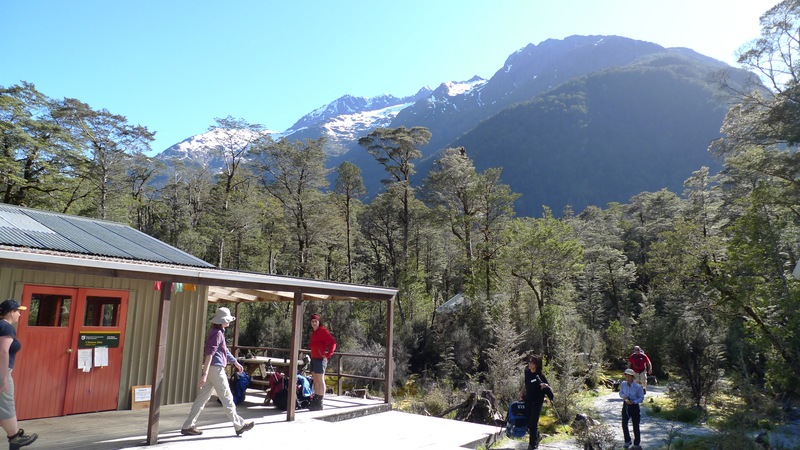 The guides said that anyone who wanted to go should leave Quintin Lodge no later than 4.30pm as the walk takes ~1.5hrs (return). We had aimed to be at the lodge by 3pm, so would be back by the cut off time to start walking. We ran in (our entrance would have been at a more seemly pace if not for the chopper – although this isn’t our only walk that has ended at a run) to Quintin Lodge just after 2:30pm, which I guess means we more than made up for leaving 15min later than hoped that morning. 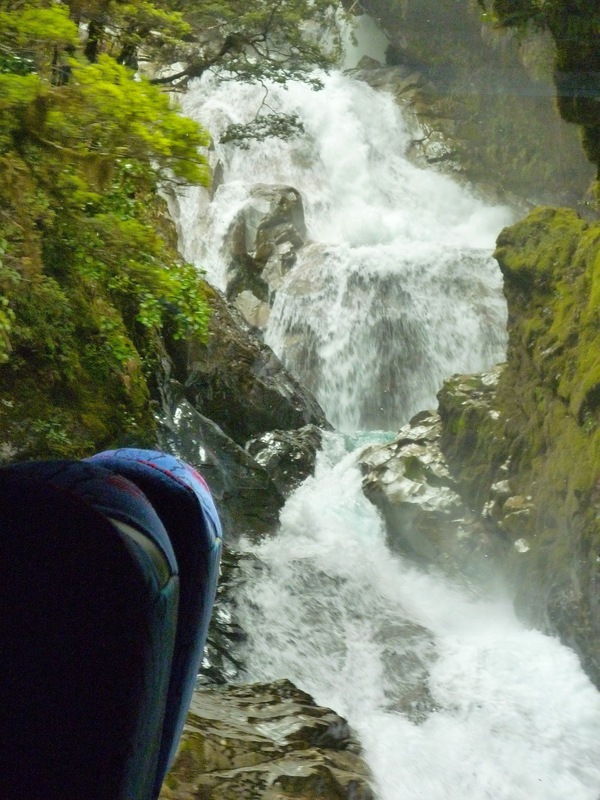 We dumped our packs and took only cameras, hats, and a water bottle and set off for the falls at about 2.45pm. We had been told to take rain coats/jackets too, but it had turned into a nice sunny afternoon and it didn’t look like it was going to rain. I figured it we got a bit of spray we’d dry out alright. We passed a few independents on their way back from the falls (they had a head start on our group this morning, but the DOC hut where they would stay the night was still a good few km’s further down the main track still); we were too focused on getting there to say more than ‘Hi’ as we passed – they probably wondered what the hell we were running from! We started to wonder… how long could 580m be? We had slowed our pace from a jog to a brisk walk and were joking that maybe we had to climb 580m in elevation to get there when we came to an avalanche warning sign that said no stopping for 360m – we crossed that in minutes and by then it was rather obvious that 580m wasn’t how long the path was to the falls. 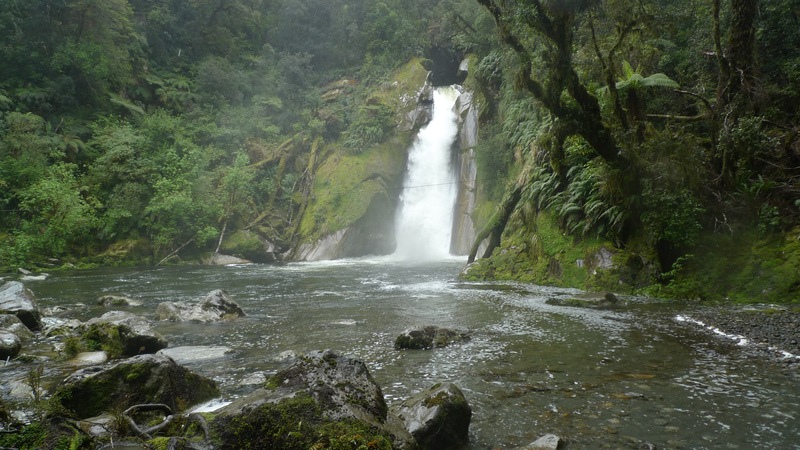 A few minutes on we saw one of our party coming back along the track and he said we have about as far to go as the falls are high – and then we saw the sign saying exactly that; we were now 580m from the base of the falls – the same distance that they are high!! Important lesson that one – when you’re tired, you don’t think straight. We weren’t in any danger of getting lost on such a clear track and with a number of people around, but I see how easy it can be to get into trouble. 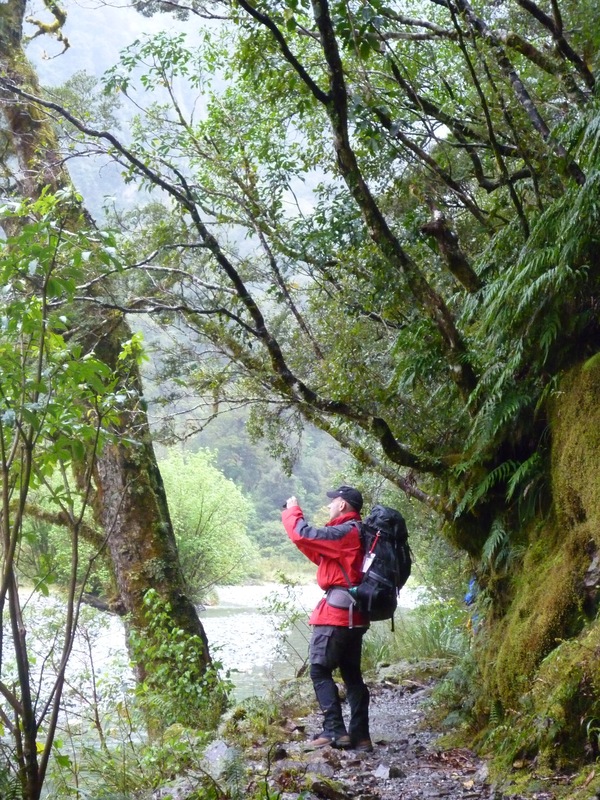 Stephen spotted a Weka! 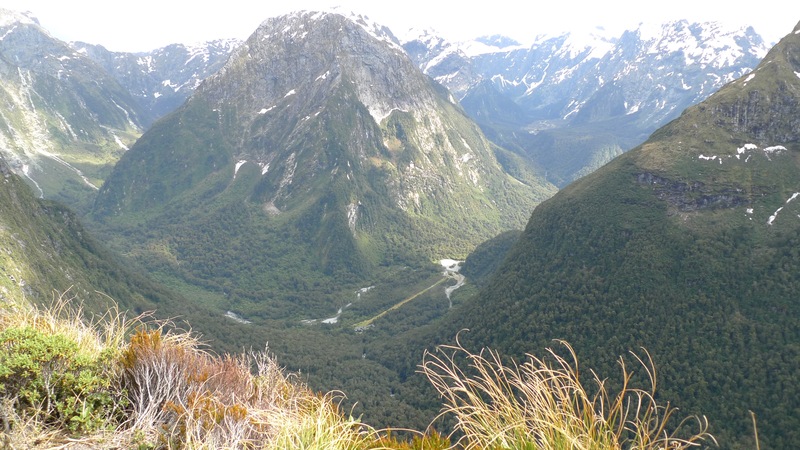 Our second for the day – there was one up on Mackinnon Pass, too. 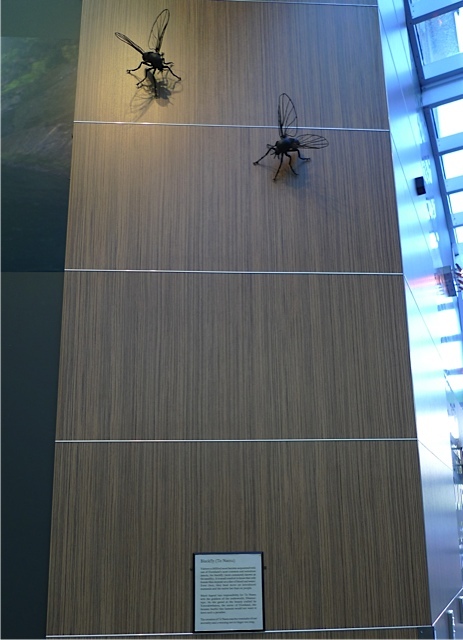 They can fly but are predominantly terrestrial. 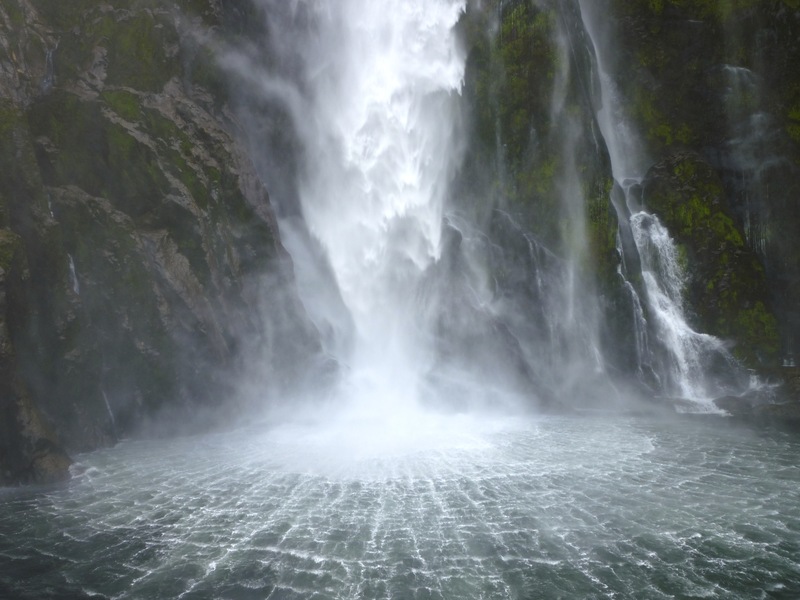 The falls are very impressive, and the wind that the falling water creates at the base clearly explains the need for a raincoat. Despite a lot of spray we managed to take a few photos then turned back to return to the lodge. Damn it was good to finally take our boots off that night! Most people got to the lodge in time to take the walk to the falls. A few didn’t. 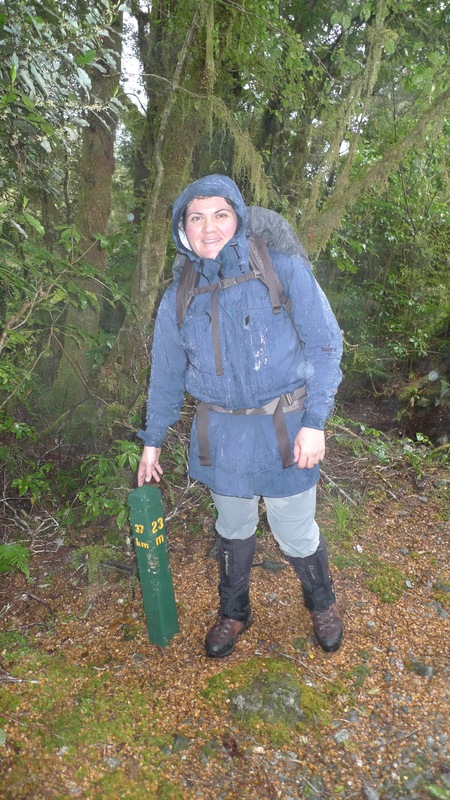 One lady who was not a strong walker (around the hut she was fine, but as soon as she was on the track – sticks in hand – she walked like an invalid; very, very slowly and carefully, thinking about each step she took) didn’t get in until about 7pm – almost 12hours on the track. Just after lunch she’d fallen into a hole in the ice and had to wait 15min before the last guide came along to help her out! But she made it eventually. 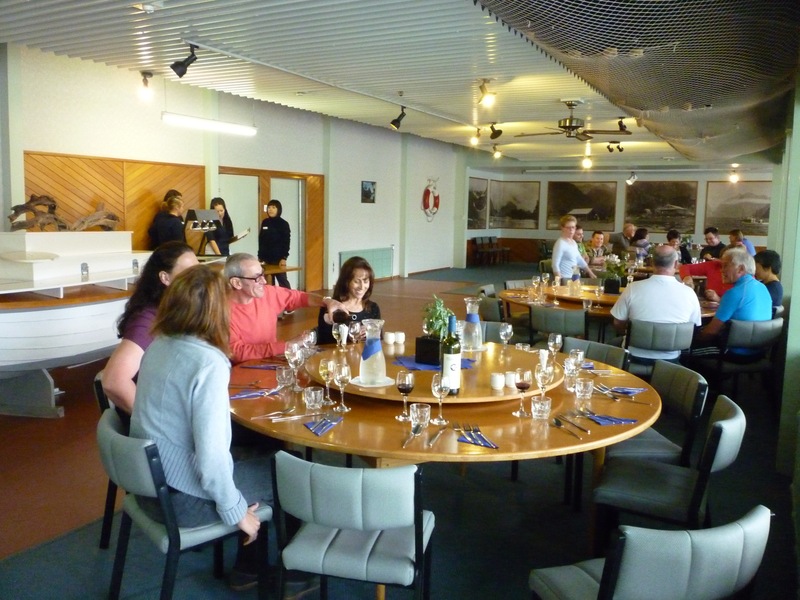 They do keep saying it’s not a race… On a previous trip a whole group didn’t make it to Quintin Lodge until 10.30pm! 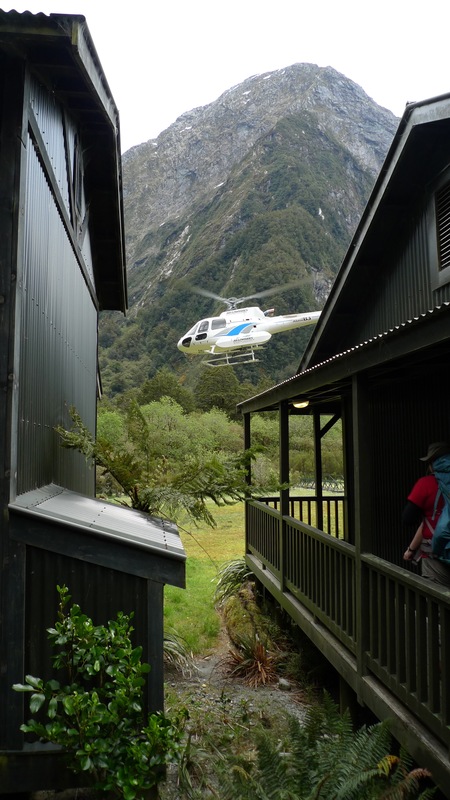 They were all flown to Mitre Peak Lodge the next day, since I guess they were all knackered and a group can’t stay more than one night in each hut – there’s up to another 50 guests a day behind ready to crash! While that lady was probably in the worst shape of all of our group, she wasn’t the only one feeling relived today was over. Despite hiking boots being on the list of essential items, there was a couple on their honeymoon who were only wearing sneakers – and their feet were definitely talking to them! Most of the group were complaining about sore knees/legs/ankles. It really does pay to have good (broken-in) gear and to do some preparation before any hike of some length. 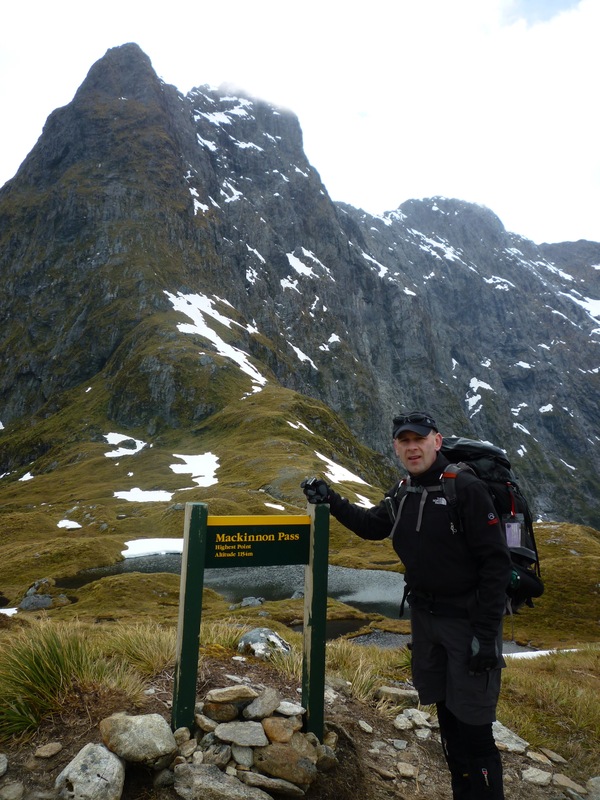 Our nightly powerpoint presentation reminded us that although Mackinnon Pass has been conquered, there was still a lot still to see (and walk!) 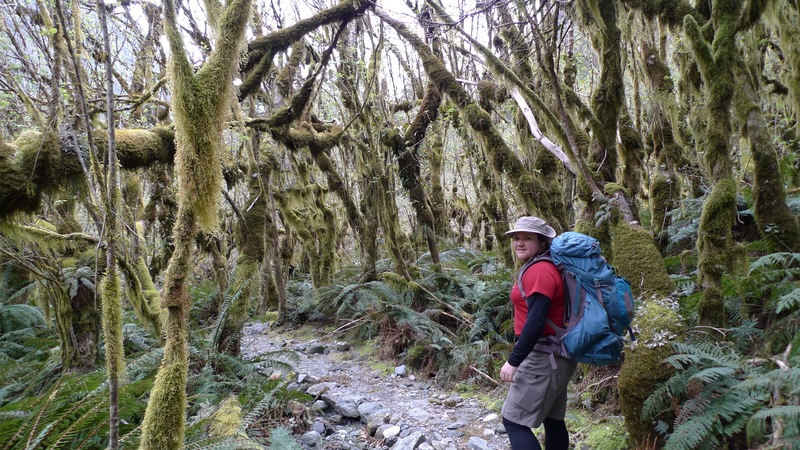 on Day 4 on our way to Sandfly Point (the end of the Milford Track) and on to Mitre Peak Lodge. 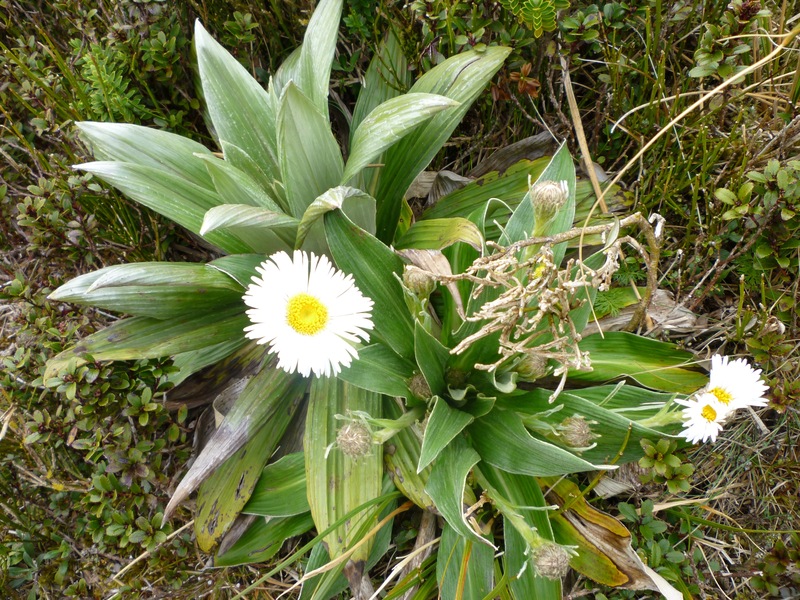 Categories: Holiday, New Zealand | Tags: Department of Conservation, DOC, Dracophyllum, Fiordland, Fiordland Mountain Daisy, Hiking, Mackinnon Pass, Milford Track, Mt Balloon, Mt Cook Lilly, Mt Hart, NewZealand, Quintin Lodge, Quintin Mackinnon, Sutherland Falls, Tramping, Tutahuna, Ultimate Hikes, Vegetable Sheep | Permalink. 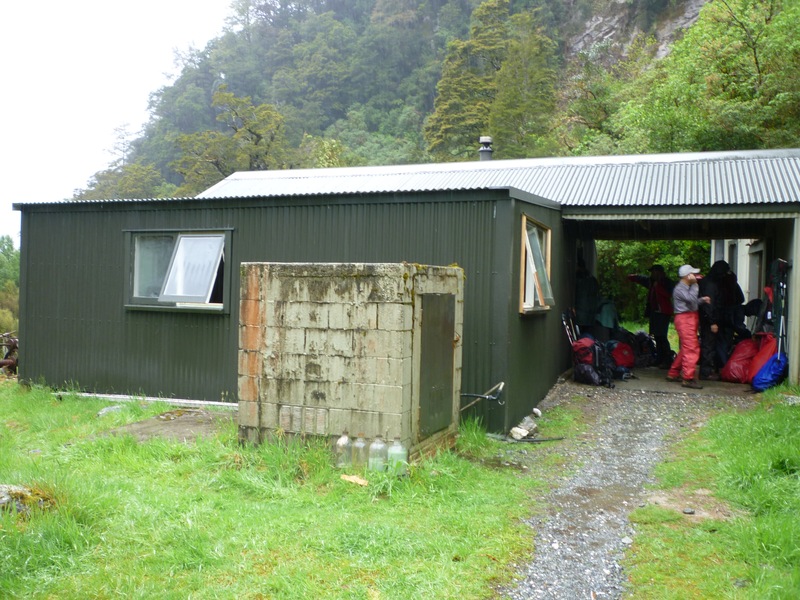 The generator fired up and the lights came on at Glade House; our first full day of walking the Milford Track had arrived! Morning light coming into Clinton Valley near Glade House. Officially we had 10 miles (16km) to walk today (at the end our GPS recorded 14.5km (~9 miles), mostly following the river up the valley. We could knock that off in a few hours – surely they could have let us have half an hour more to get our stuff together? But we didn’t grumble out loud (that I can remember). And if we did we weren’t the only ones. And we certainly were not (quite) the last ones to leave Glade House. Even so, there were a lot of eager people ready to go at 8.30am! 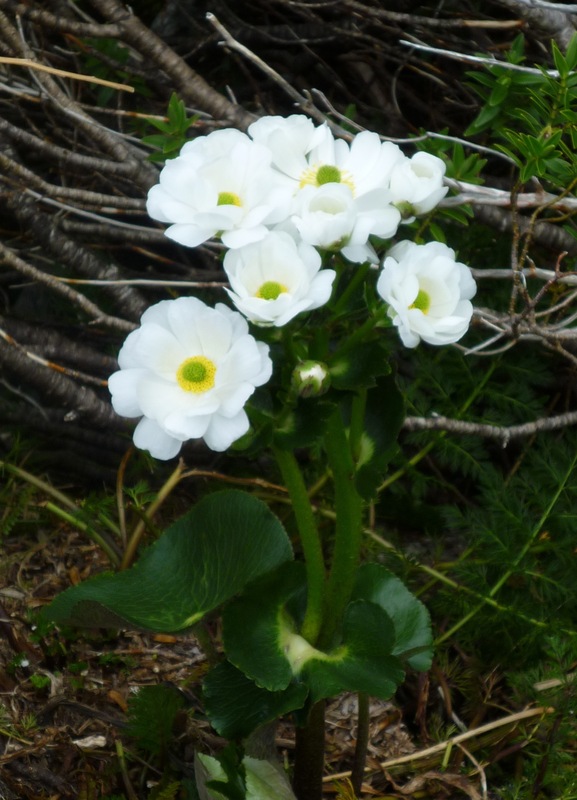 We saw them – an impatient group – as we were heading back from breakfast to finish packing. It wasn’t long before we were under way, an there was certainly a lot of scenery to appreciate. The Clinton River was mirror-like on this beautiful morning as we waved good-bye to Glade House. A perfect day for a hike! We passed Sentinel Peak then followed the river up the Clinton Valley which is to the west of the peak. 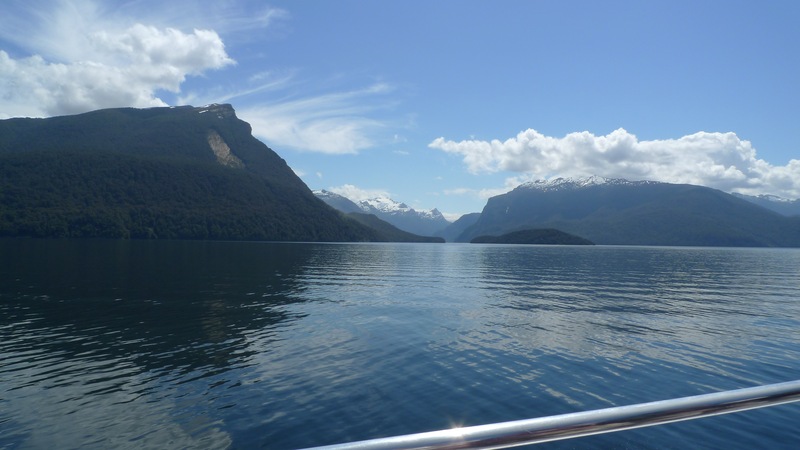 The mountains and the clear blue/green water were what drew our attention the most. Since it was such a large group, we didn’t spread out much for a while. When Claude, the head guide who was up the front, stopped to point something out only the people right up the front near her could hear. The other guides who were spaced out among the guests could have a guess what she was saying if it was a ‘usual’ stop, but sometimes had as little idea about what she was saying as we did. It was a bit frustrating because it wasn’t supposed to be a stop-start group walk, but that was the result of having been hurried out the door so we wouldn’t be left behind. It wasn’t until after the first stop for morning tea that we all spread out a bit more. 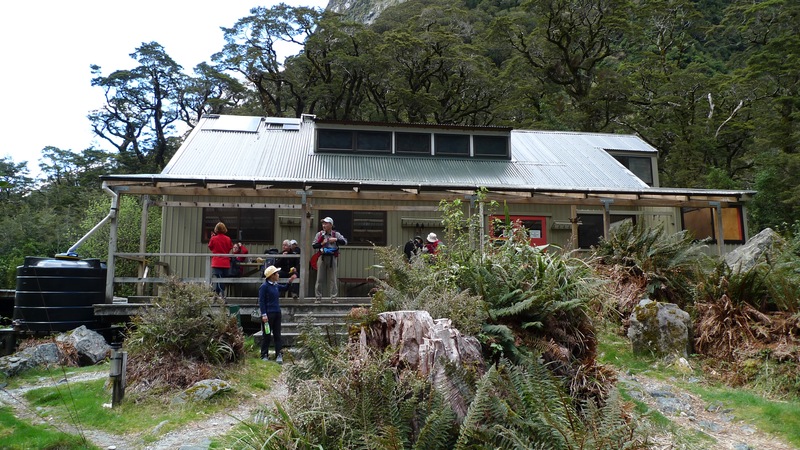 Morning tea at Clinton Hut – the first of four DOC huts on the Track for independent hikers. Pretty good compared with some public huts we’ve seen, but much more spartan than Glade House! I could stare at this all day – and wish I was there to jump in! The increased number of sandflies by the river keep your artistic shots to a minimum. The Track isn’t hard to follow. 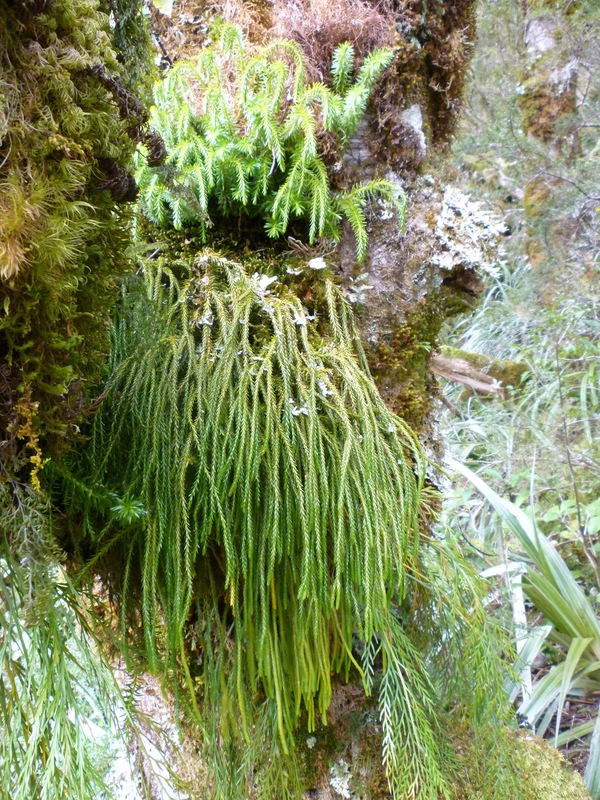 Some of the mosses and ferns that grow at ground level. There was a perfect spot to go for a swim at lunch, but as there were a couple of clouds around then it wasn’t warm enough to tempt me that much! Well, it was more the hassle of getting dry again afterwards and the prospect of walking in damp clothes. Someone was brave enough to try it, but I gather he wasn’t in for very long! 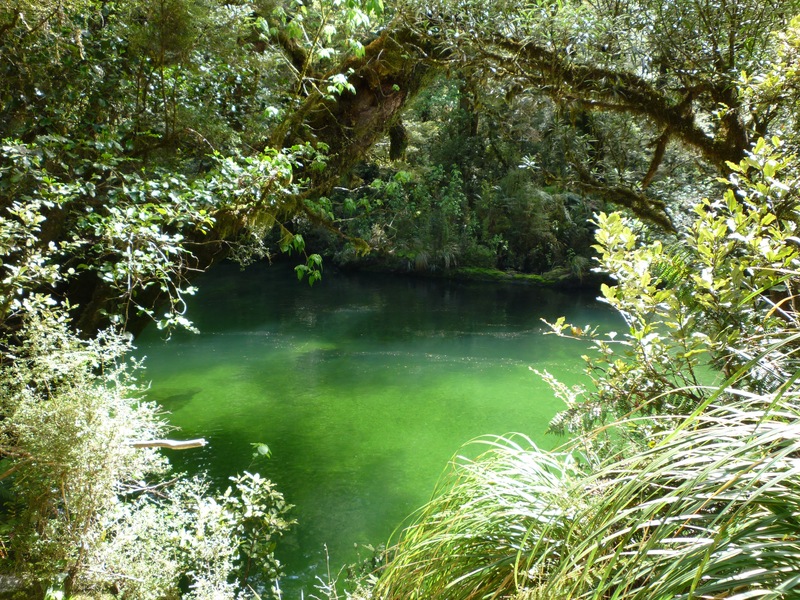 I was temped again by a clear green pool… no salt or chlorine here! Or leaches! We didn’t want to stop too long for lunch to avoid stiffening up, but it seemed most people were happy to sit around, and (in contrast to that morning) the guides didn’t seem to think it necessary to get people moving again. We were visited by a Kea who didn’t mind being the centre of attention, and we got some good close-up photos whilst keeping an eye out for our packs incase more Kea’s were sneaking up to attack them while our attention was diverted! 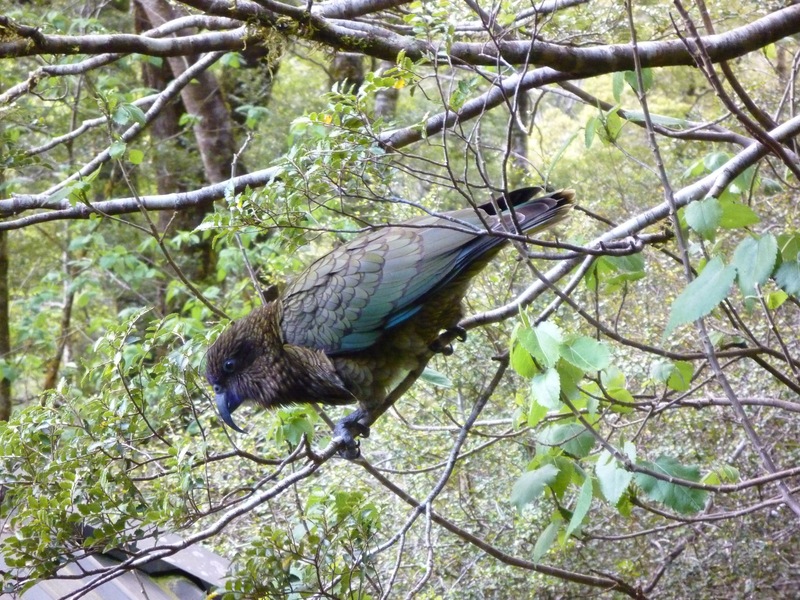 Kea’s are an inquisitive, alpine native parrot – check out the length of the top bill. 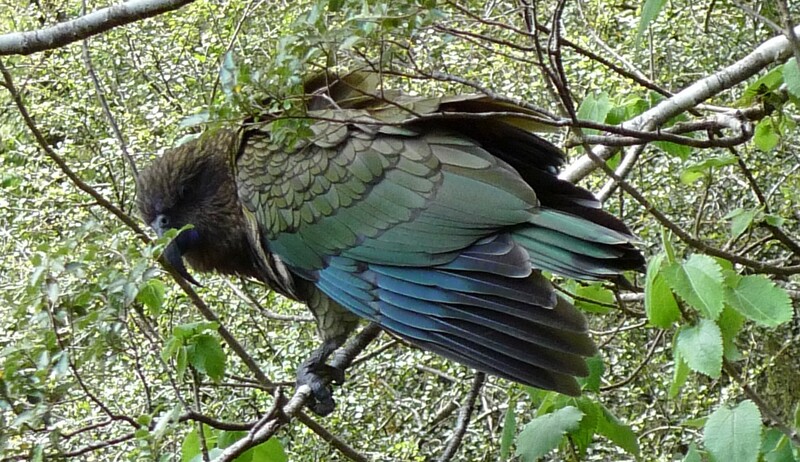 Interestingly, you can’t get insurance for Kea damage to your car. One guy there said that he was stopped at the Hommer Tunnel once, and in the time it took him to visit the loo, they’d pulled off the rubber around his windscreen and it had fallen out! 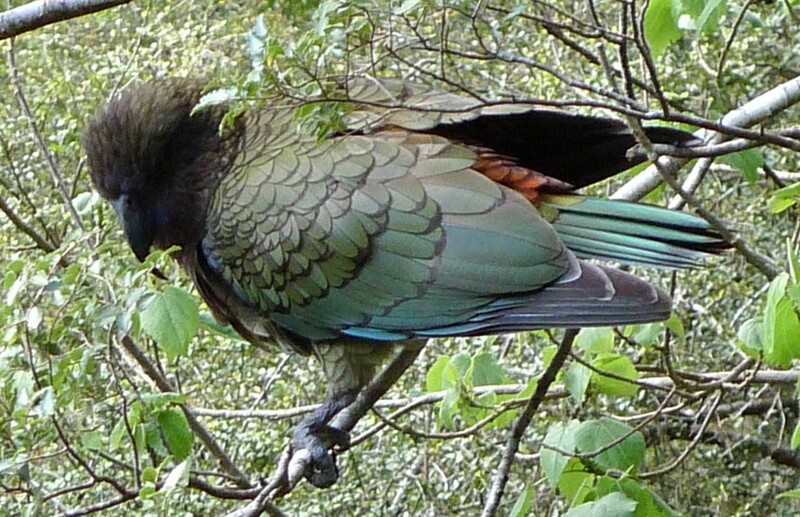 Cheeky Kea’s!! The track doesn’t keep to the bank of the Clinton River the whole way up the valley. 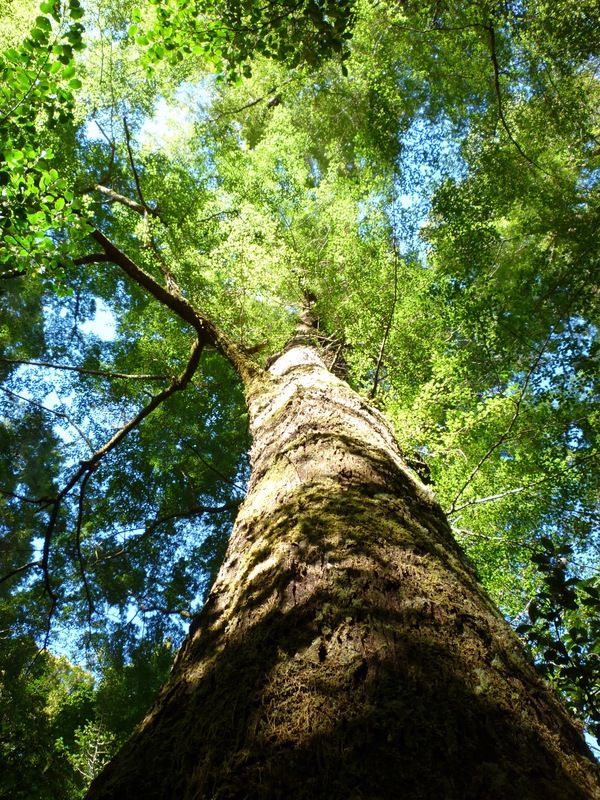 The beech forests are cool and green. Through here the track is pretty easy walking, but remember – it wasn’t always that way. 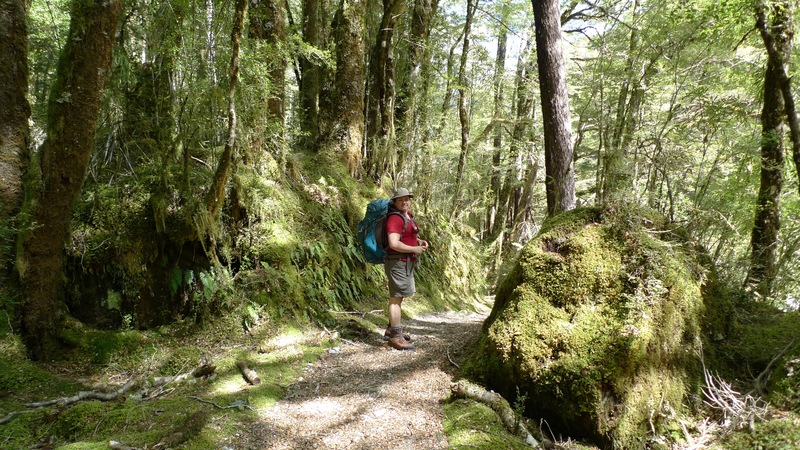 Qunintin Mackinnon would have found the way very difficult – just look at the forest on the side of the path. 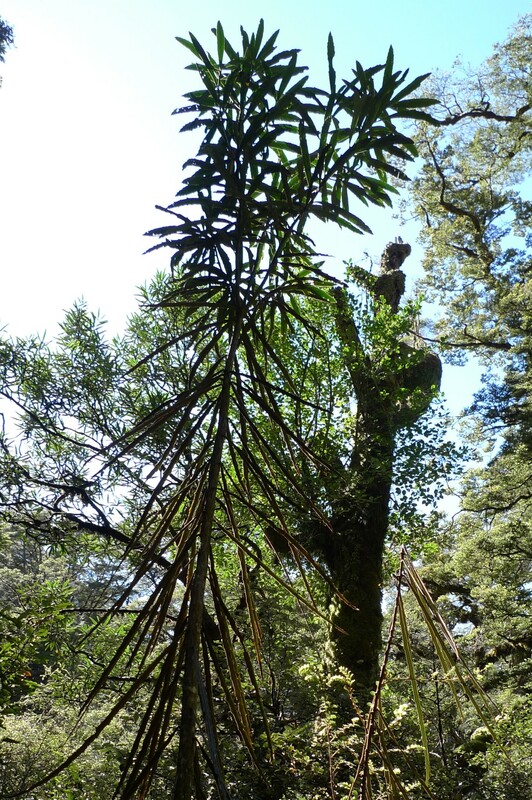 An iconic native New Zealand tree that is often passed along the Clinton Valley is the Lancewood. The adult tree looks like any ‘regular’ tree, but saplings look like a stick with long tough brown spiky-edged leaves dropping from it, with no top. Until the sapling reaches to 2.5m or so, it doesn’t begin to grow adult foliage. The theory is that this is an evolutionary trait to avoid being grazed on by Moa, extinct flightless birds of the same family as kiwis, emus and ostriches. We knew of these trees (but not their story) before this walk because Icebreaker uses the immature tree as a design print for one of their t-shirts Icebreaker Tech T – Lancewood. The track also passes through avalanche danger zones. 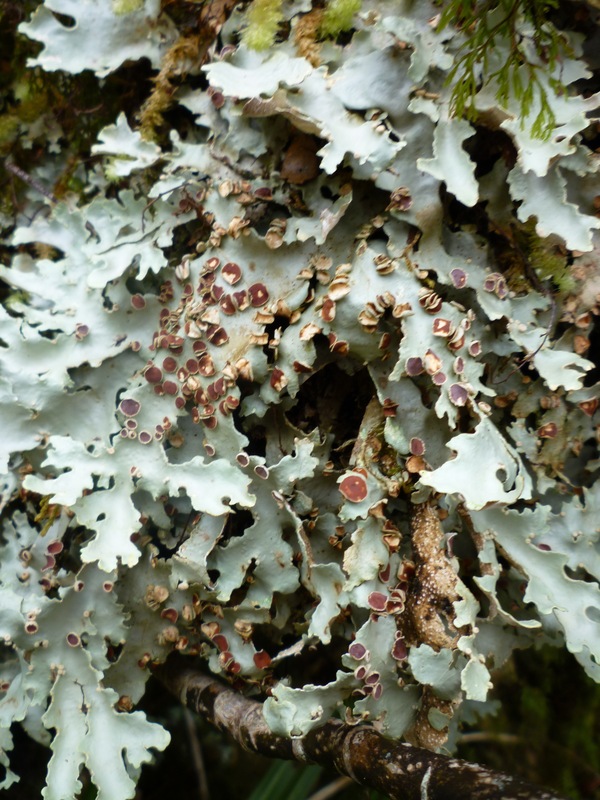 These areas are generally characterised by a lack of mature trees. The Department of Conservation (DOC) put up signs along the track saying not to stop until you get past the next sign saying it’s okay to do so. When big avalanches come down, the preceding winds can get up to 200-300km/hr, which is what flattens so much of the vegetation. Warning sign saying not to stop in high risk avalanche area – there will be another sign further on to indicate when you can stop again. The further up the valley we walked, the narrower the valley became. As you cross the more open and exposed sections, you can’t help but wonder what it would be like to be in this part of the valley during an avalanche – it’s so steep and close it would surely act as a funnel. A person would be smashed to pieces. And that is one very good reason why there is an open and closed season, and why DOC do so much to try to trigger avalanches before the walkers are allowed in! All hail DOC!! The other thing DOC (in conjunction with Ultimate Hikes?) does is fly in temporary bridges. We wouldn’t want to get wet feet, after all…. 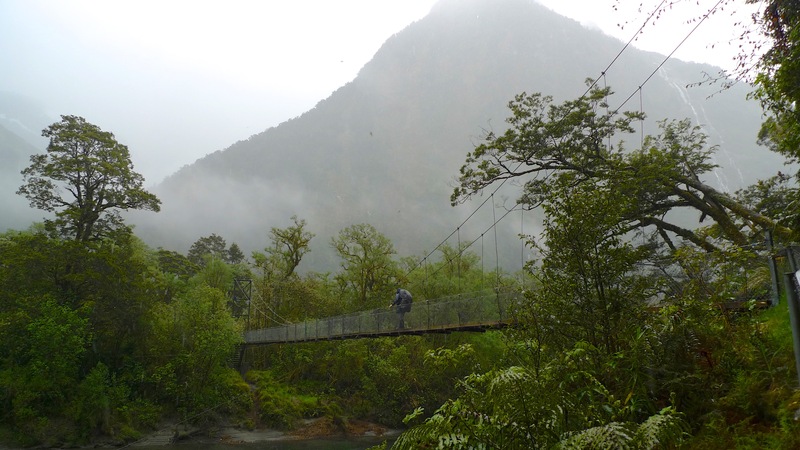 Examples of bridges that DOC fly in for the walking season. These are removed over winter. No, it’s not so we can keep our feet dry. The reasons for the bridges are so that we’re not damaging the banks of the river and because (as I have mentioned previously) they get 7-9 metres of rain per year! That is a hell of a lot of water by anyone’s standard’s, but when you think about it all running down the sides of those mountains, one pretty good shower is going to raise the level of the creek pretty damn fast. 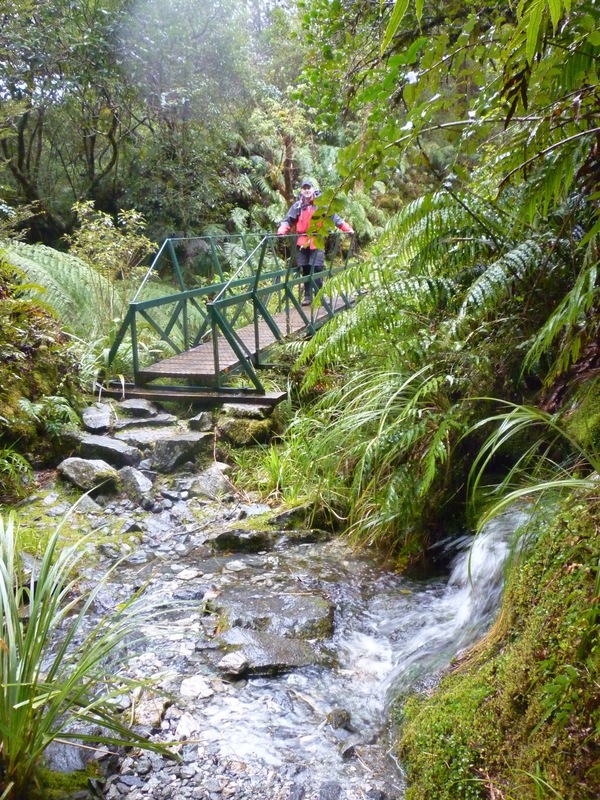 The bridges are so people CAN cross the lovely little streams that you see in our photos. When I took the photo below there wasn’t much water in sight and, to tell the truth, it was a little stinky to the right, a bit like a swamp. 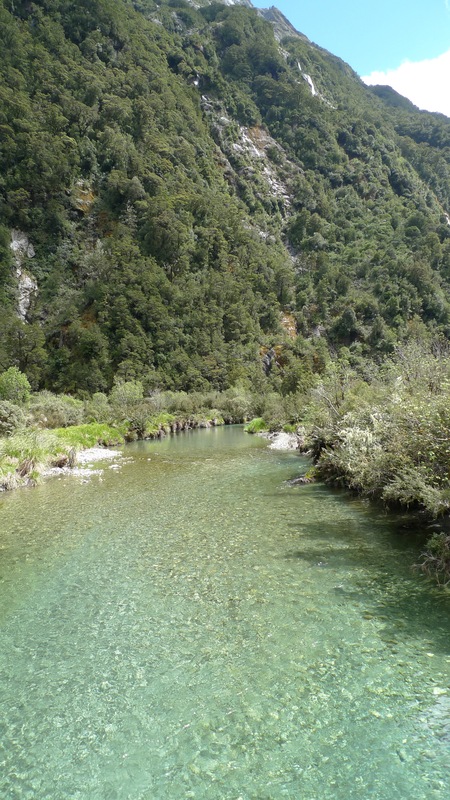 But we had seen a video of people wading through brown water up to their thighs along this section. 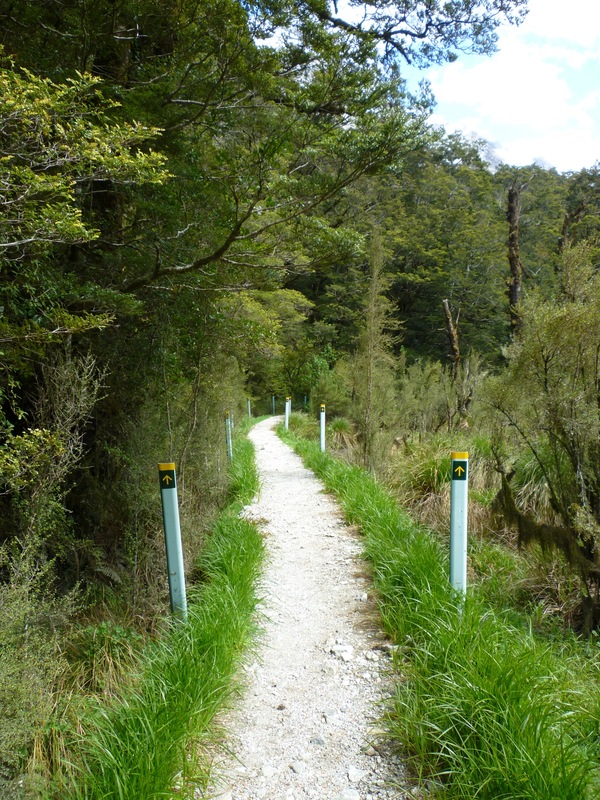 It didn’t look like they could see the path – just the very tops of the guide posts. Thank goodness the path is built so well it doesn’t wash away! Looking back down the valley on a nice, sunny day. Even when it hasn’t rained for a few days (that is like a drought to this region – the ecosystem here is adapted to coping with a lot of water, not the lack of it), there are still a multitude of ribbon waterfalls cascading down from the icy tops of the mountains, feeding the streams that become the Clinton River. 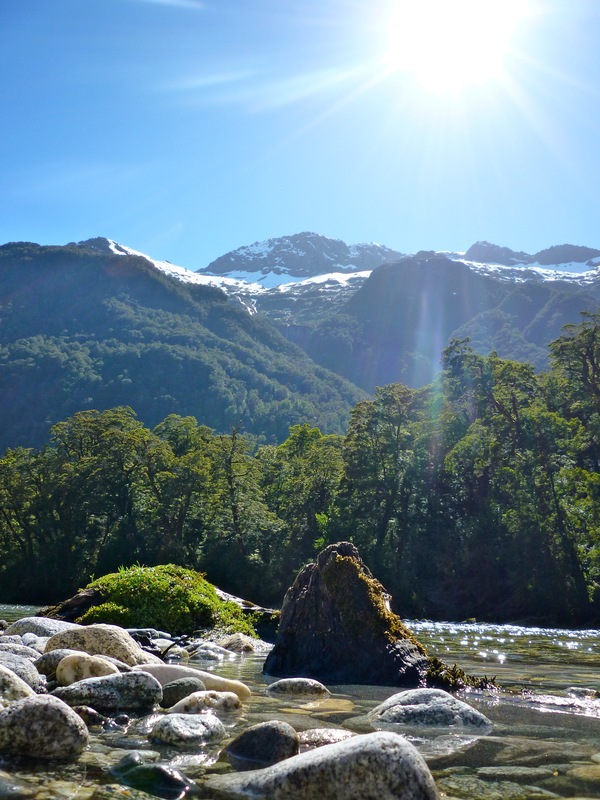 The melting ice from the tops of every mountain continually feed the river. It’s so pure you can drink it unfiltered. It was mid-afternoon by the time we reached the turn-off to our second night’s accommodation. We were glad to get there, and pleasantly surprised to be greeted with orange quarters which were very refreshing. The name ‘Pompolona’ came from a type of scone that Mackinnon made for his guests. He didn’t have butter, so he used the fat from wallabies (a feral pest in New Zealand). He called the scones pompolona’s. 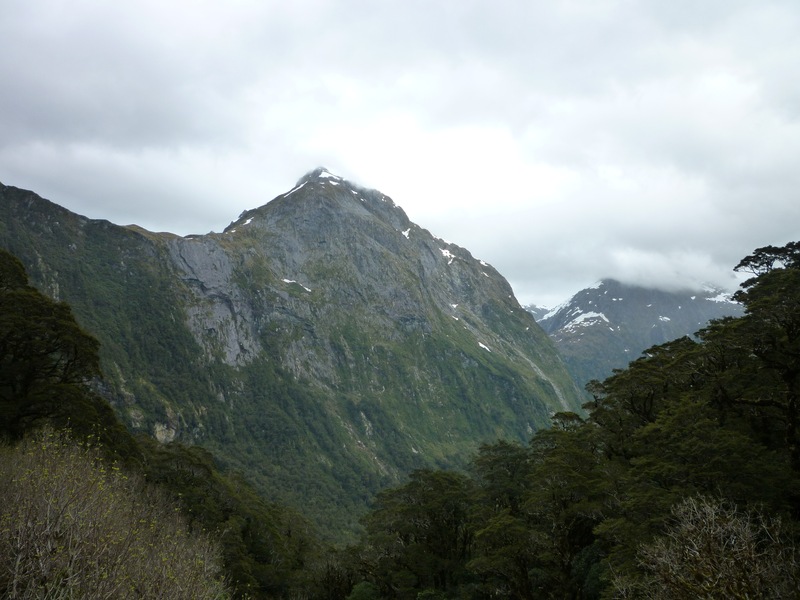 Our room had a really good view of the end of the valley and Mackinnon Pass that we’d cross the next day. 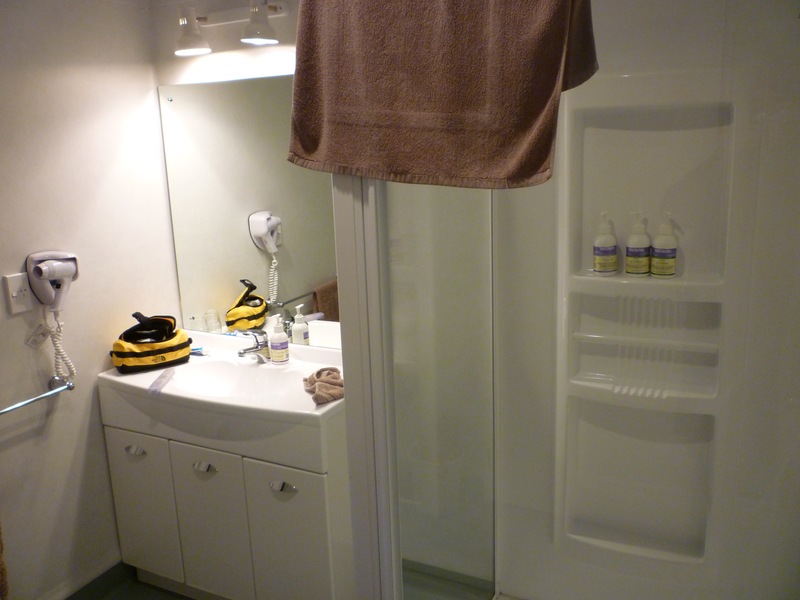 Each lodge has a laundry and drying facilities – although you’ve got to be quick to avoid a long queue and get first pick at where to hang your clothes. It was while we were waiting to wash some of our clothes we saw a rather large* avalanche! I’m glad it wasn’t any bigger, because it was on the mountain almost directly behind the hut! Not THE avalanche, but some snow falling off the side of the mountain not long after. With our first proper walking day done, it was time to relax and psych ourselves up for the challenge of crossing over Mackinnon Pass tomorrow! 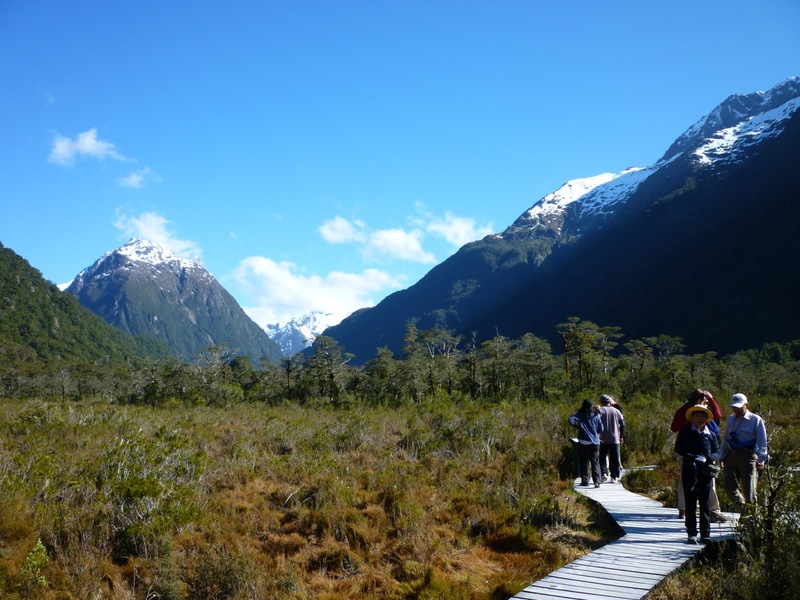 Categories: Holiday, New Zealand | Tags: "The Finest Walk in the World", Clinton River, Clinton Valley, Department of Conservation, DOC, Fiordland, Hiking, Kea, Mackinnon, McKinnon, Milford Track, NewZealand, Pompolona Lodge, Tramping | Permalink. The first day of every adventure is exciting. 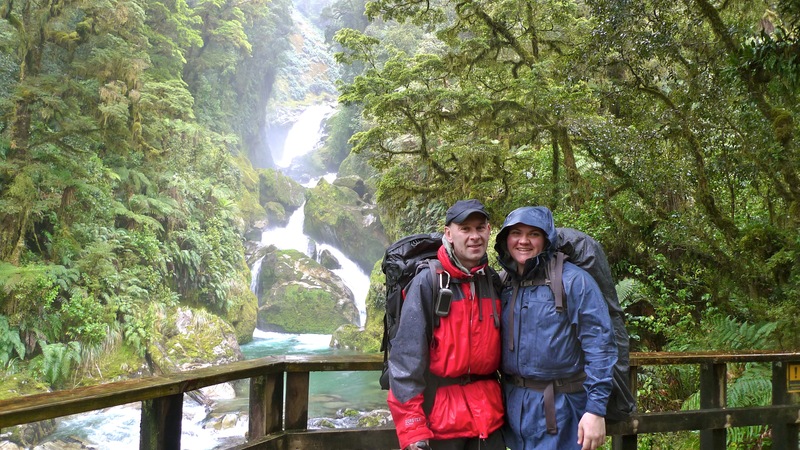 Day 1 of our turn to walk the world famous Milford Track had arrived and we were ready! 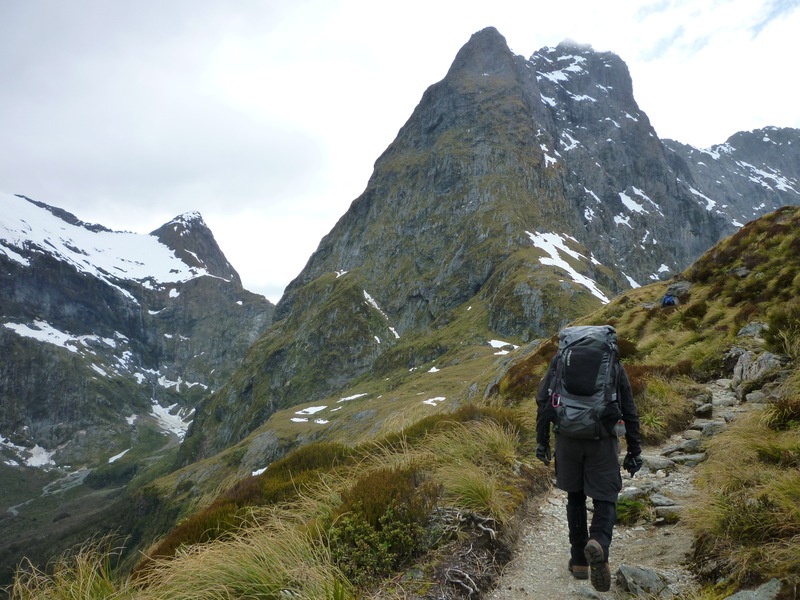 After a quick breakfast headed down to the Ultimate Hikes office with our backpacks and an extra bag each of clothes and gear that would be sent ahead to Mitre Peak Lodge for us. Browns very kindly allowed us to leave our luggage that we weren’t taking on the walk with them. 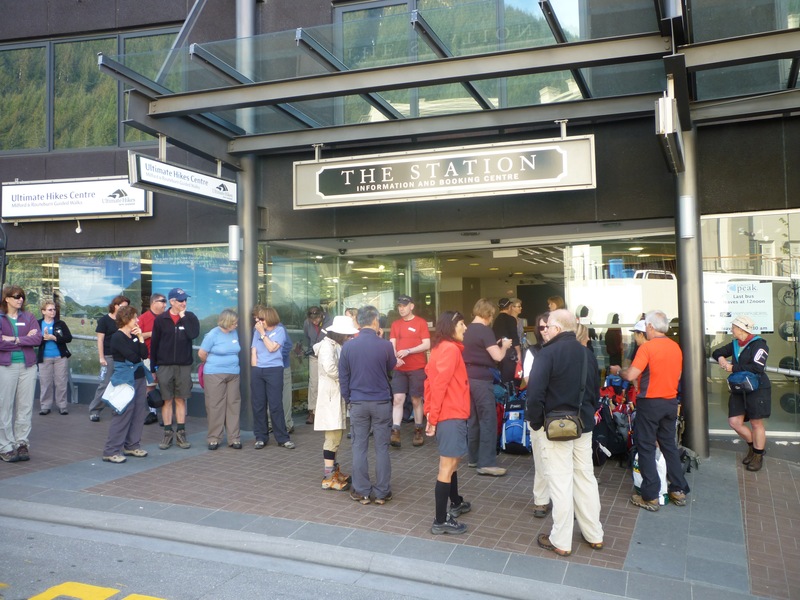 The maximum number of guests that Ultimate Hikes can accommodate in one group is 50, which makes for a lot of excited people milling around on the footpath waiting for the bus. We were going very early in the season and I think there were only about 38 guests in our group. Ready for adventure! You can see the broad spectrum of hikers this walk attracts. I’m sure we weren’t the only ones checking out the size of other people’s packs. 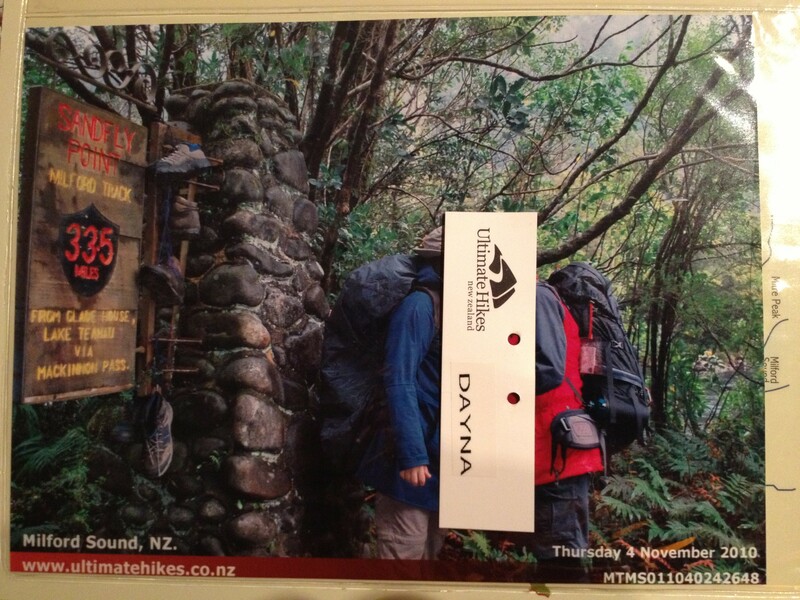 I do remember there was one guest – a lady, mind you – who fit all her gear in a 25L pack! We’d both chosen to bring our own 80L packs instead of borrowing a smaller one (40L) from Ultimate Hikes; mine weighed about 10-12kg and Stephen’s… well, let’s just say it was heavier. Sheep! 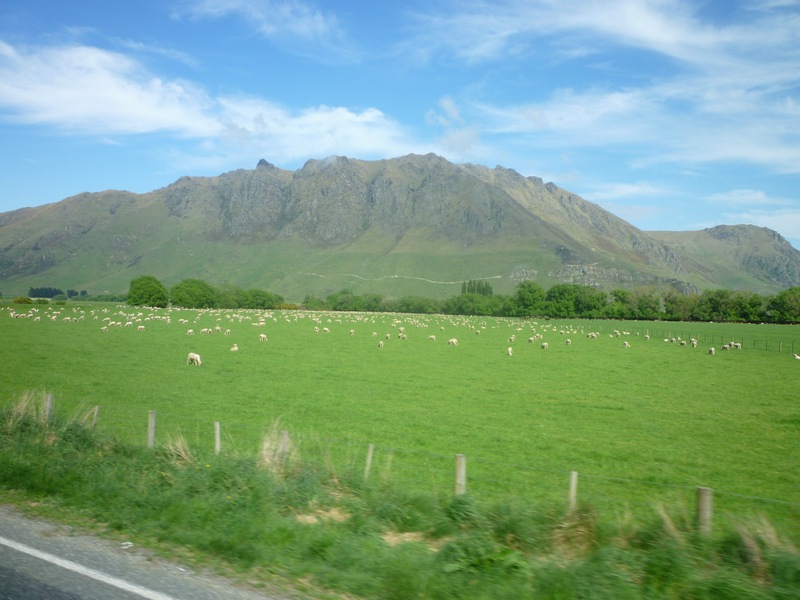 In New Zealand! Who’d have thought? 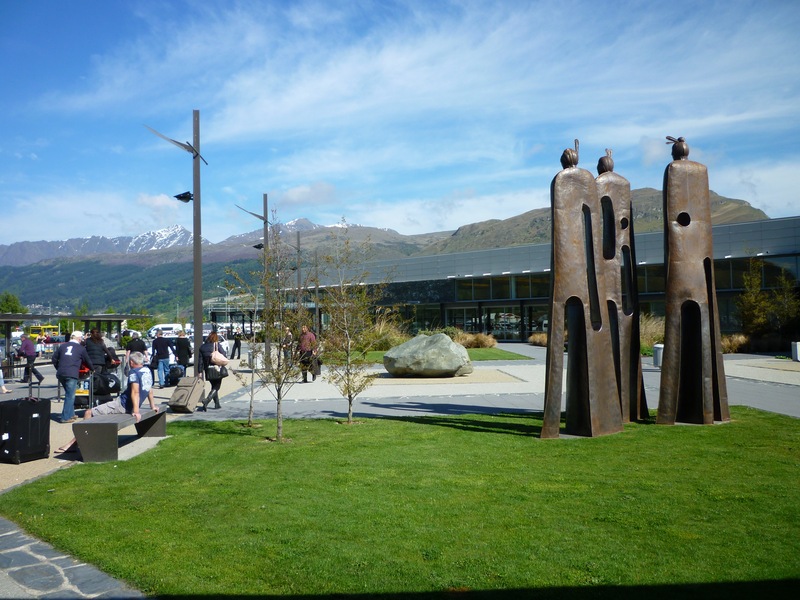 We had one stop at Mossburn for a comfort break and… icecream! There isn’t much to see or do there apart from those two things. It was overcast and not particularly warm, but just about everyone enjoyed a Tip Top icecream anyway. After all, why let the weather stop you? 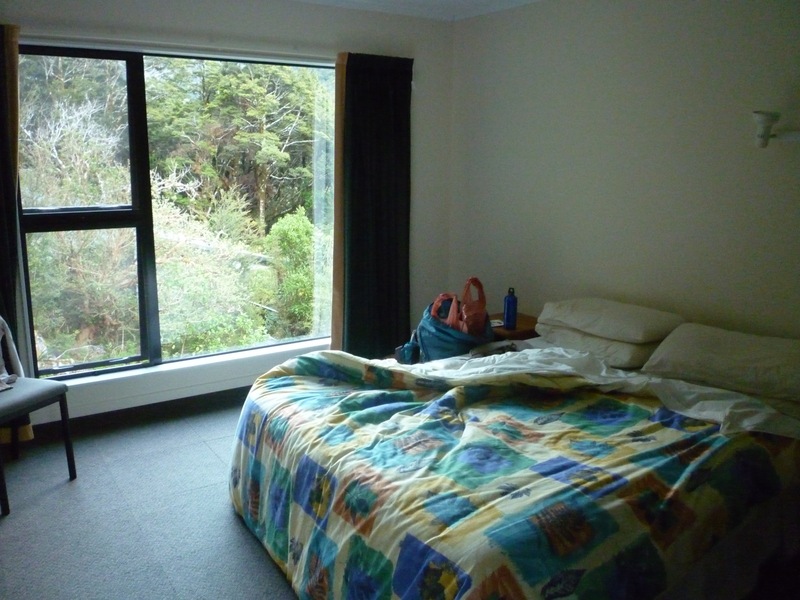 Lunch at Te Anau was very nice – Ultimate Hikes has an office attached to a hotel on the waterfront. 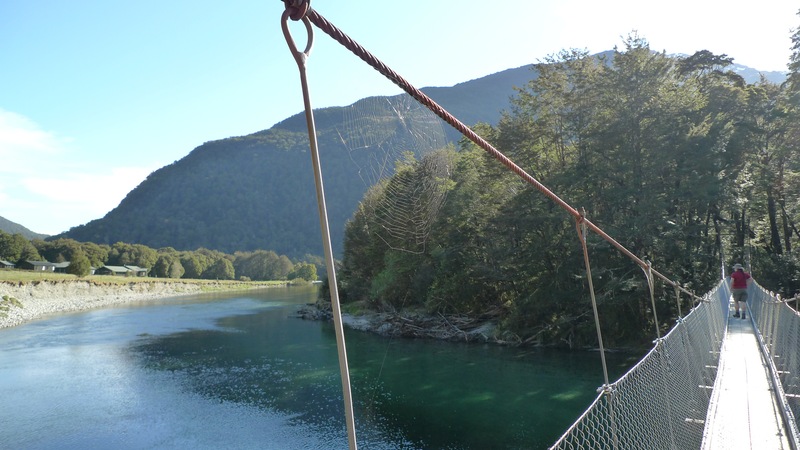 If you’re looking for somewhere to holiday that’s like Queenstown but quieter, Te Anau could be just the place for you. 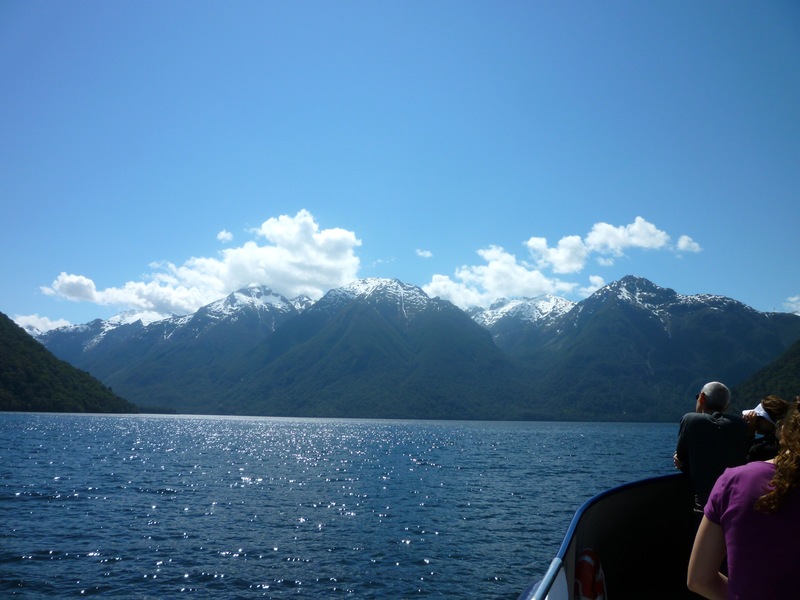 Lake Te Anau is New Zealand’s second largest fresh water lake by surface area, and Australasia’s largest freshwater lake by volume. 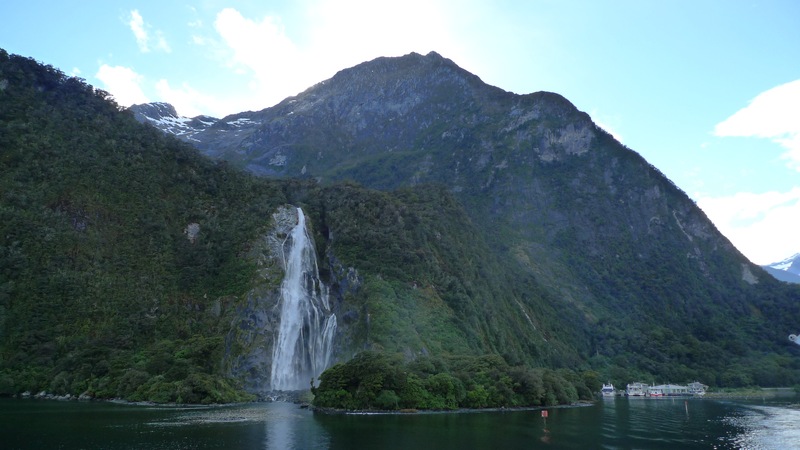 It even has three of it’s own fiords feeding into it! How’s that for impressive! On the side of the bus you’ll notice the quote ‘The Finest Walk in the World”, and you may think that it’s a fairly bold claim that a marketing company sold to them. Well, not quite. 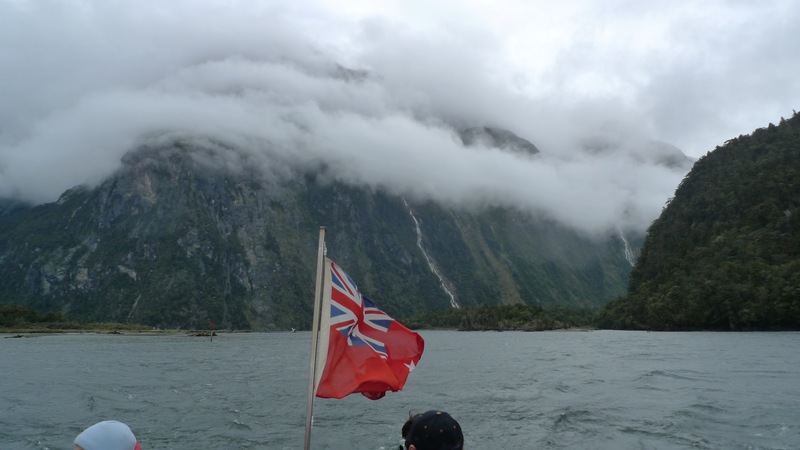 Just over 100 years ago, a journalist was invited to walk the track and it was the title of their review of the walk when they got back to England that lead to the world-wide fascination with Milford Sound. 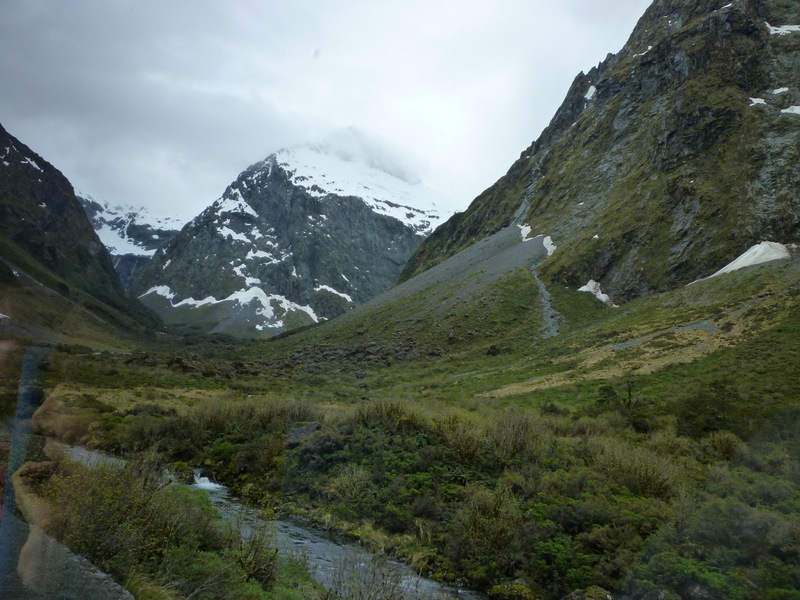 Of course, since the astounding Homer Tunnel was completed in 1954 thus enabling people to drive to Milford Sound, it’s certainly been faster and more convenient for the masses to get to the fiord without getting their feet dirty. From Te Anau it was a short bus ride to the boat at Te Anau Downs for the 1hr trip to the north end of the lake and the start of the Milford Track. 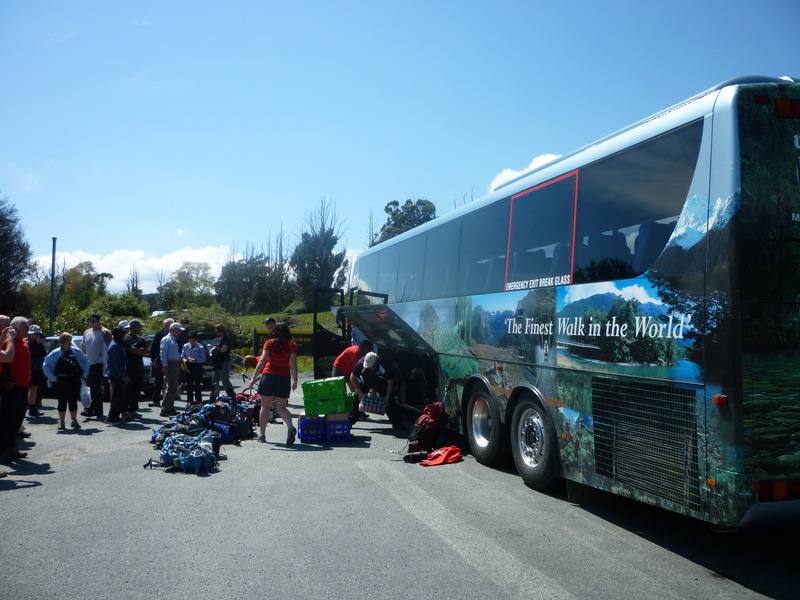 Unloading the bus at Te Anau Downs. 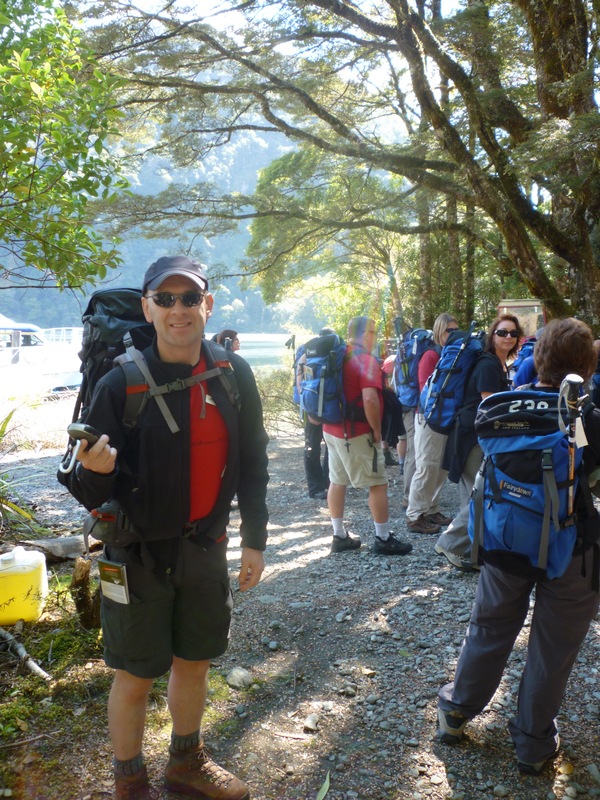 Our group plus a couple of independent walkers boarding the boat to the start of the Milford Track. Naturally everyone wanted to be on the top deck since the weather was nice and sunny again! 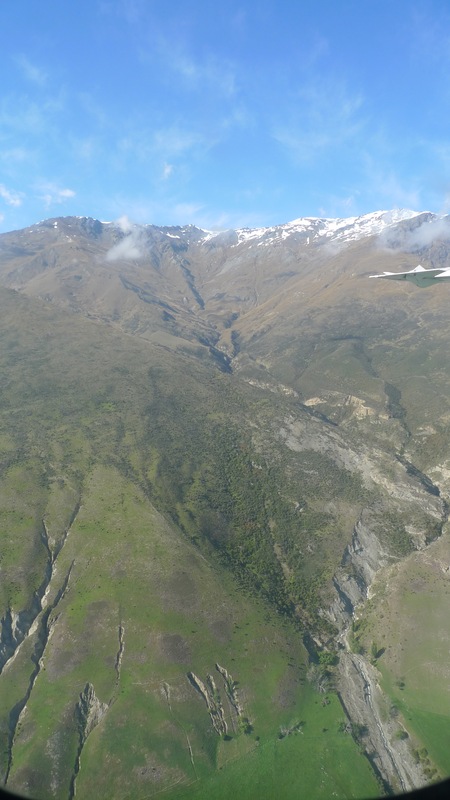 The scar on the side of the mountain on the left is due to a landslide. There isn’t much soil on the sides of the mountains; the trees roots entangle around each other for support as they grow. Thus it only take a few to come loose to take out a whole lot. 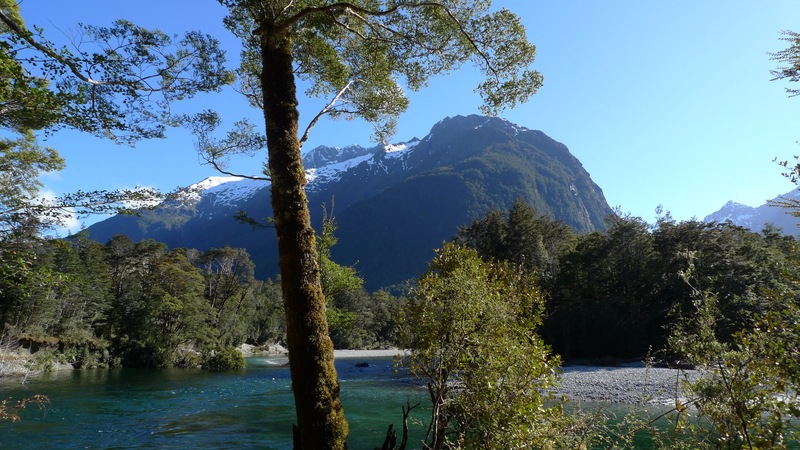 Quintin Mackinnon was the explorer who found the overland route to Milford Sound that we now know as the Milford Track. 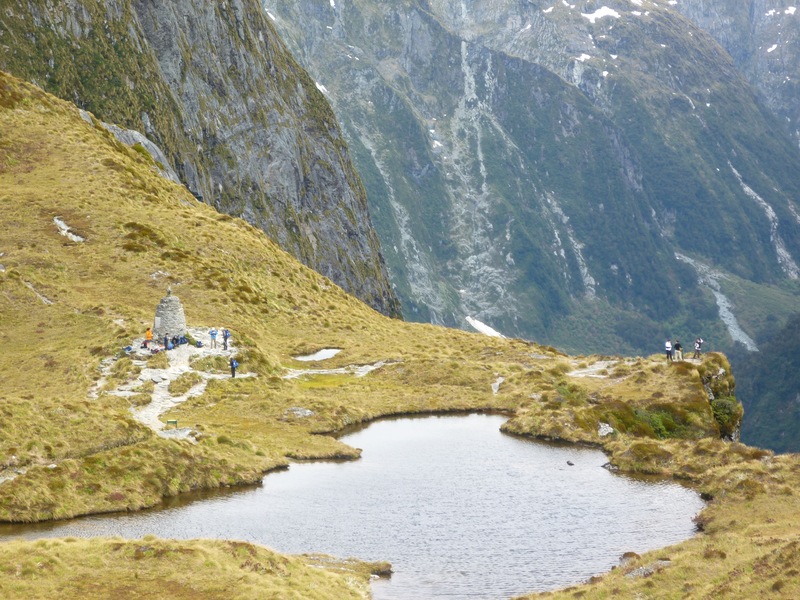 Several land marks along the way are named in his honour, including Mackinnon Pass (the highest point of the track) where there is also a memorial cairn, Quintin Lodge (night 3 with Ultimate Hikes), and Lake McKinnon. I believe it was Mackinnon who invited the journalist mentioned above – he was keen to take guests along the track. 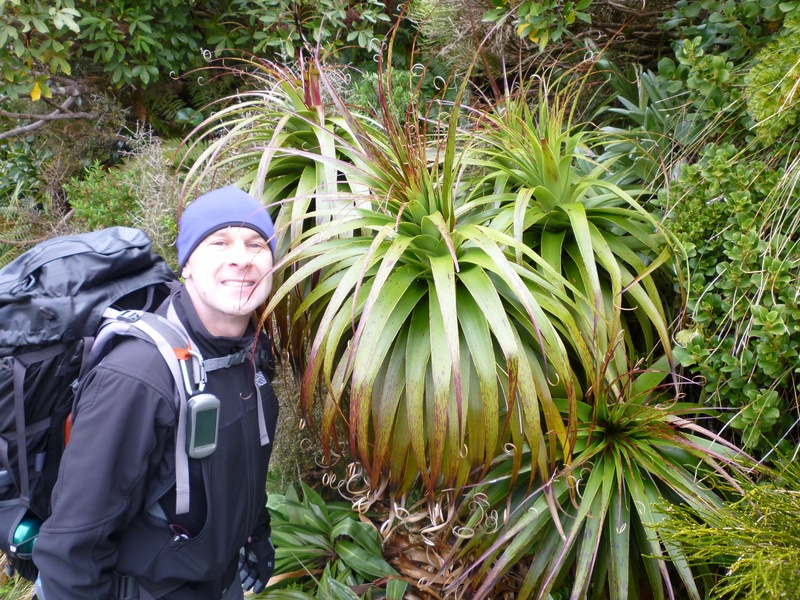 He is greatly revered by the Ultimate Hikes guides and you learn a lot about him and what what conditions were like back then over the course of the hike, and get a really good appreciation for how much easier it is for us to do now! 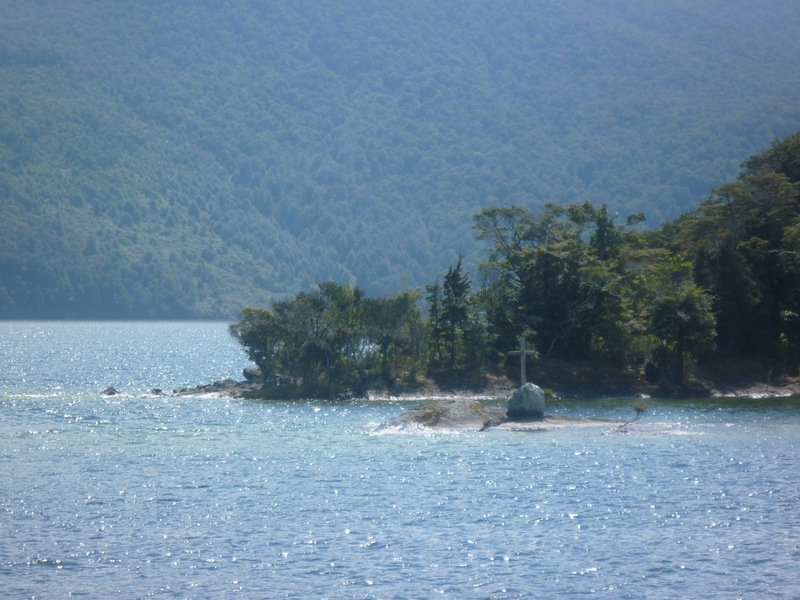 The cross on that rock on that wee island in the middle of Lake Te Anau marks the place that Quintin Mackinnon’s (sometimes spelt “Quenton” and “McKinnon”) boat was found, wrecked after a storm in the last months of 1892. His body was never found so it is assumed that he drowned (apparently drowned people sink in fresh water). 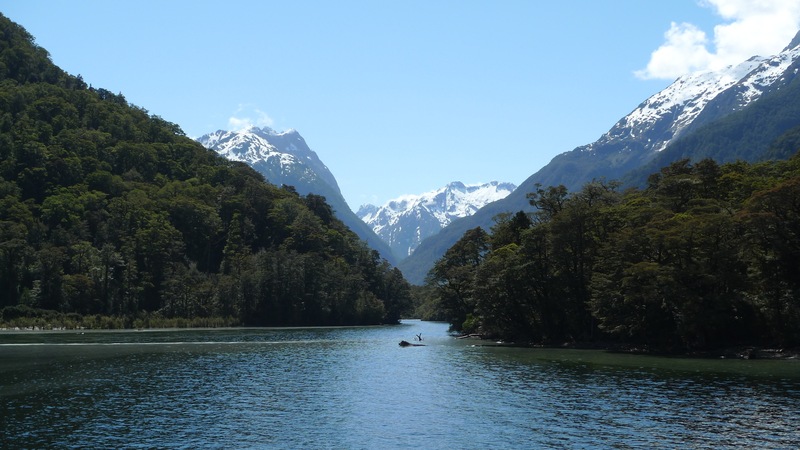 Given the lake extremely deep (the deepest point is 417m), a search – let alone recovery – was impracticable. Anticipation grows – we’d be walking amongst these giants very soon. 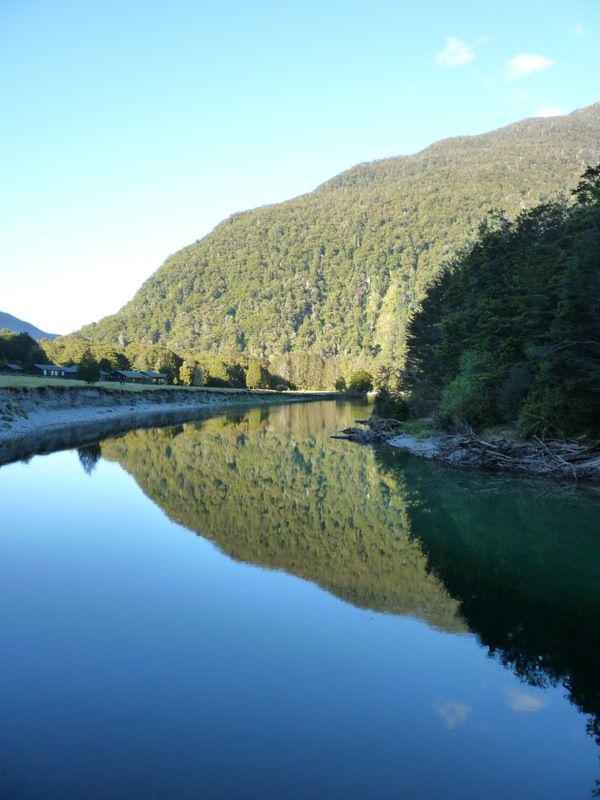 The Clinton River entering Lake Te Anau; there is a jetty just to the right of frame. 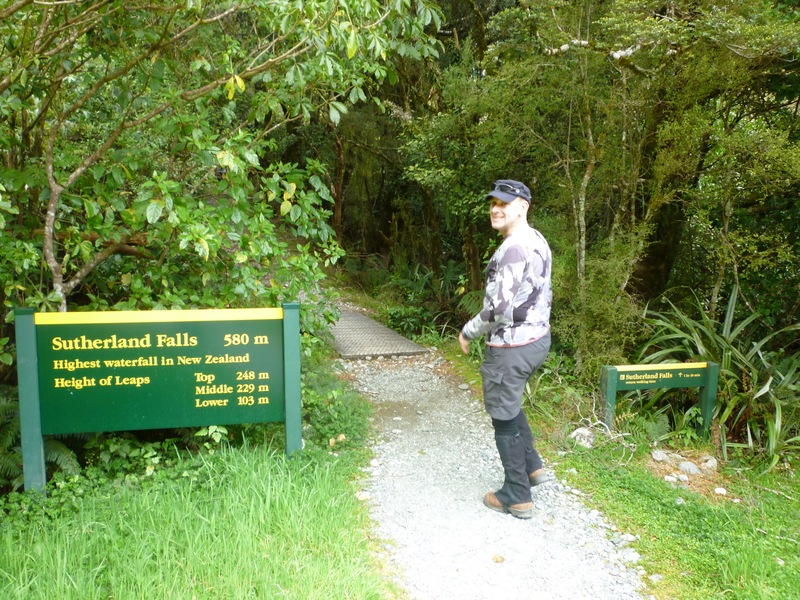 Within minutes of landing at the official start of the Milford Track, we realised that we hadn’t put on insect repellent yet!! So instead of waiting to get our photograph taken with the sign marking the start of the track, we headed off – if you keep walking the sandflies don’t bother you (of course, it helps if you’re not all standing around in a big group, too). GPS is working – we’re good to go! 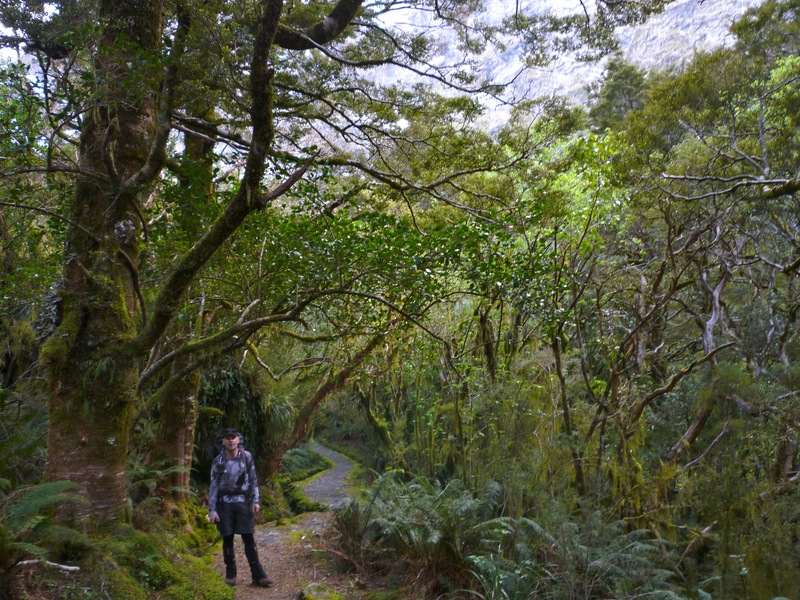 The start of the Milford Track. We didn’t hang around to pose for a similar photo. 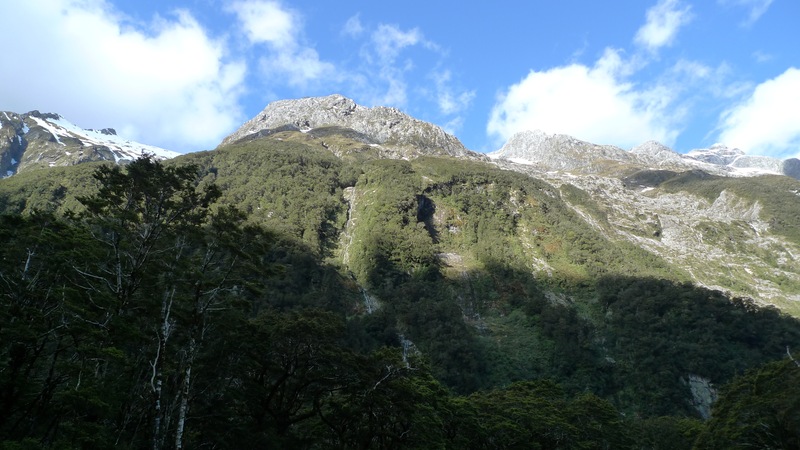 There were a few independent walkers on the boat who disembarked and headed off before us – they had about 1.5-2hrs to walk to the first DOC (Dept of Conservation) hut, named Clinton Hut as it is in Clinton Valley. A maximum of 40 independent walkers can start the track on any given day. 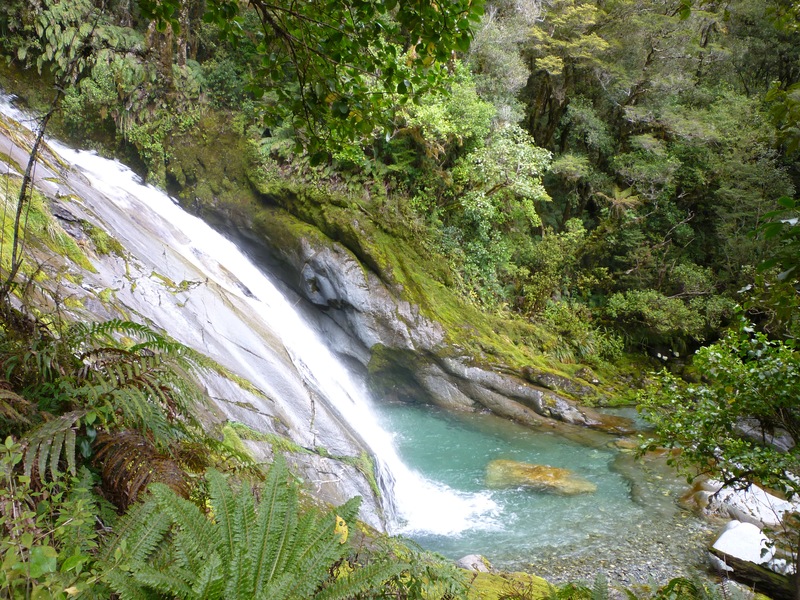 Ultimate Hikes is the only company that owns private accomodation along the Milford Track. Our accommodation that night would be at Glade House, a whole 20min walk away. That would be our official 1 mile (1.6km) first day section of the track completed! 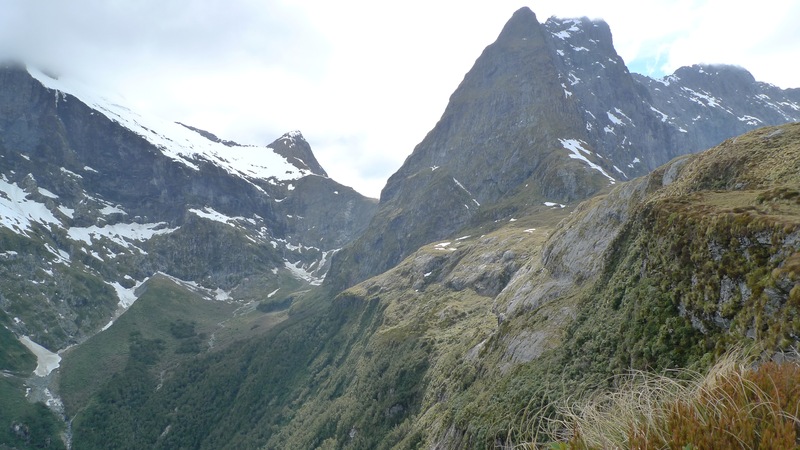 A note on measuring the track in miles: From what I remember our guides telling us, Quintin Mackinnon was paid by the mile to blaze the trail to Milford Sound. He used a Chain (an actual one made of metal links that was ‘one chain’ in length) to measure out the miles. At each mile he’d send back to town for payment, which I think came back in the form of provisions. 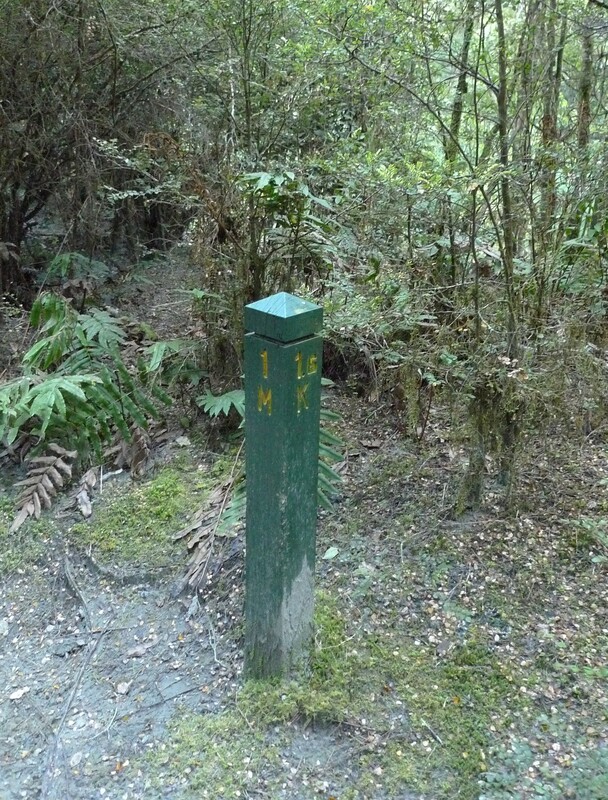 There is a post marking each mile of the track, that also shows the kilometre equivalent on the other side. After an easy 1.2km to Glade House (ok, not quite 1 mile on the first day), we dumped our bags and were almost late for the group photo! (which I’m sure I’ve got a copy of somewhere…) With the clear green Clinton River flowing in front of the house, Sentinel Peak rising beyond, and Dore Pass behind us, the view was pretty good! Arriving at Glade House. Dore Pass is the grey part at the top right of the photo. 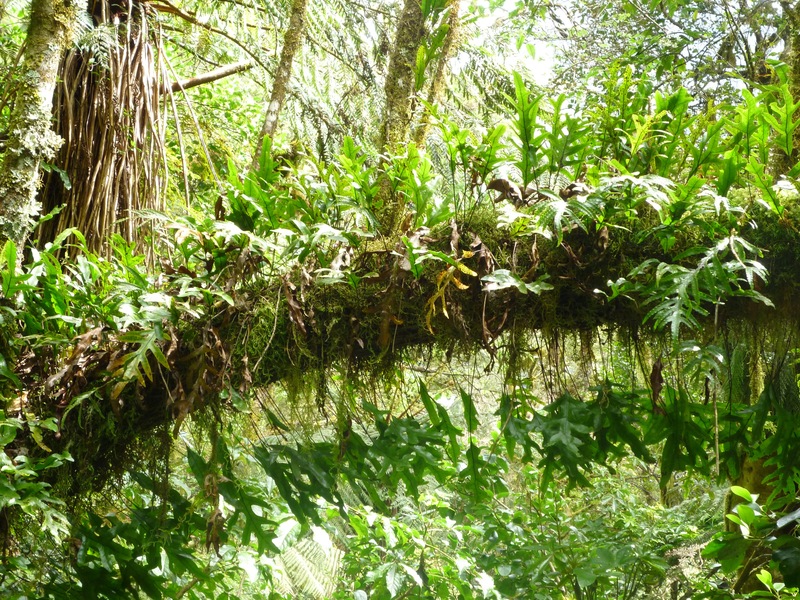 We then split into two groups for a nature walk – the guides gave us a brief overview of the plants and animals in the area. It was very interesting. We learnt that along with Possums the biggest feral animal threat in fiorland are ferrets who are indiscriminate killers. 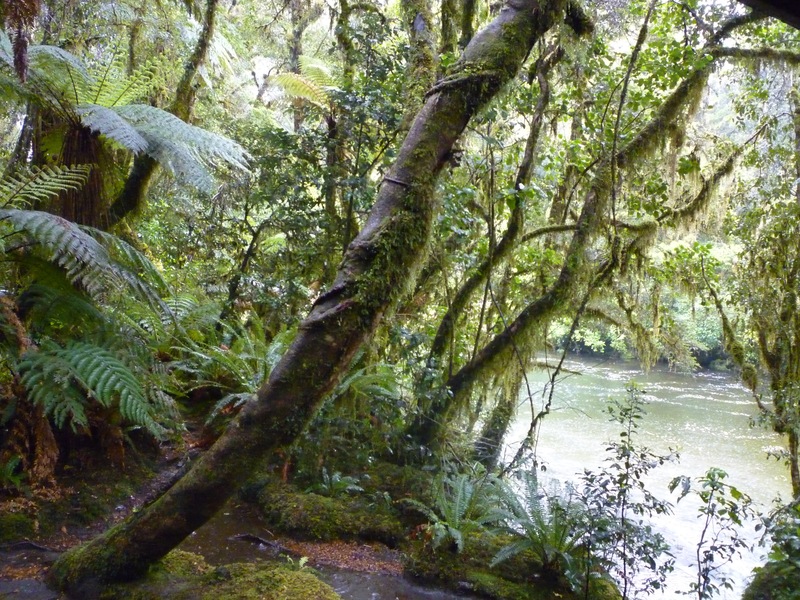 New Zealand has NO native terrestrial mammals (except for a few bats, and counting seals as marine mammals). Other feral mammals include 3 species of rats, cats, stoats, weasels, goats, various species of deer, wallabies, horses, hedgehogs! 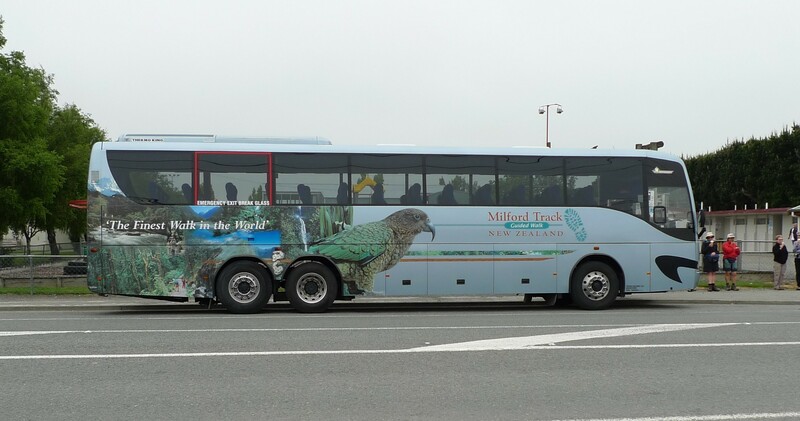 No wonder the native birds like the kiwi and kakapo (a flightless parrot) are under such pressure! On the upside, they don’t have ticks and leeches! Don’t know how that came to be, but it’s fantastic! The abundant sandflies almost make up for their absence though. 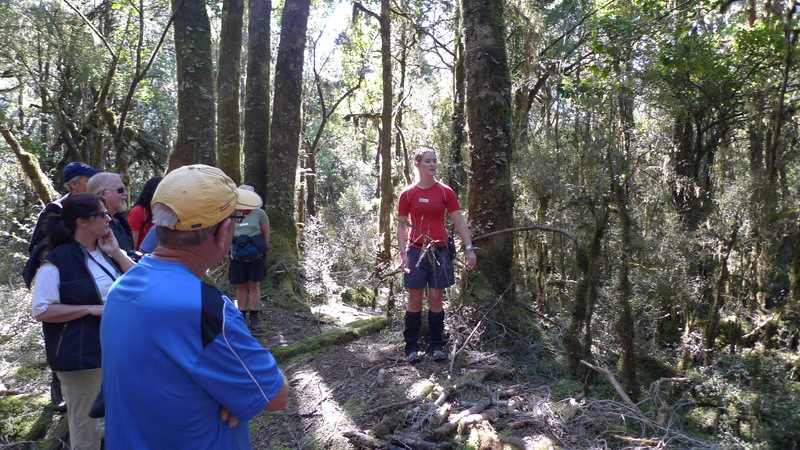 As short as this walk was, it gave some guests a much needed opportunity to get to grips with the walking sticks they’d encumbered themselves with. After everyone had made it back from the walk and wandered around a bit, it was time to gather in the lounge room for afternoon tea, a ‘getting to know everyone’ session which wasn’t too bad, and the evening power point presentation of what to expect the next day. The Lounge area at Glade Hut. The dining area is towards the back of the room. It turns out about ¾ of the group were Australian (mostly from Melbourne/Vic and Brisbane/Qld); of the rest there were 4 Japanese, 2 Indian ( a couple on their honeymoon), 2 American, 5 Kiwi’s (one who has lived in Perth for years but still thinks of himself as Kiwi, and the 4 guides) and one girl from Norway(?). 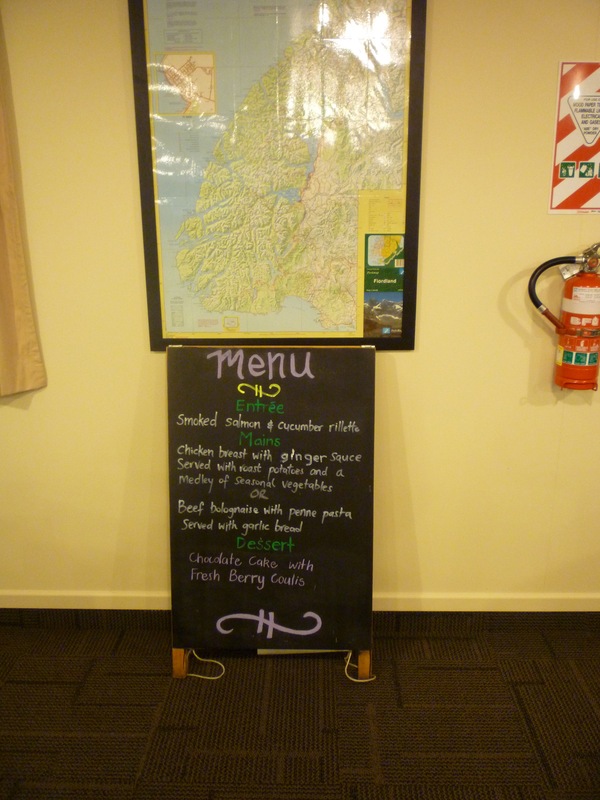 Each night we had a choice of two main meals – they’d pass around a list the day before (or at our lunch stop back in Te Anau on the first day) for you to indicate your preference so they can call ahead to let the lodge staff know how much to cook. It took the surprise away, but I guess it’s efficient for them and possibly reduces complaints from fussy eaters. The portions were a little on the small side, especially after a long day’s walk (certainly not the case on the first day), but there was salad and plain rice provided that you could help yourself to. Still, a 3 course meal of real food (more than freeze dried veges and noodles) that you didn’t have to cook yourself is not to be sneezed at, and we polished it off! A map to show you how far you’d come (or how far there was to go) and menu options. Our room that night had no view – I was happy enough that it was out of the way and people weren’t walking by our window! 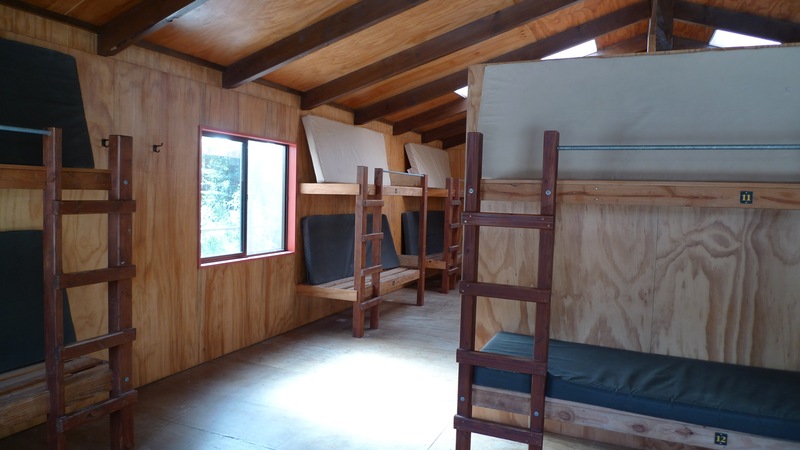 The rooms at the front are the multi-share bunk style rooms. Our room was at the back of these. The generator gets switched off at 10pm; they recommend that you leave your light switched on, so when the generator is turned on of a morning the lights coming back on act as your alarm clock. Not a bad idea! Being able to recharge my camera battery was appreciated, but until it went off the noise of the generator spoiled the serenity somewhat. I don’t know how eco-friendly or green the houses/lodges are. I guess they don’t have to worry about water since they get 7-9 metres of rain per year, but flushing loo’s, no time limit on showers, fresh linen each day (I assume they must either wash and dry it all on site or fly it out), big kitchens, a big generator, regular helicopters transporting stuff in and out – it’s very commercial and a bit wasteful, in a way. At the same time, I recognise that it’s only way they can provide a consistent, quality experience for each person in each group that arrives each day. So many people want to come and see this place – I don’t know how they would operate it differently and still make the track available to so many people of different abilities. 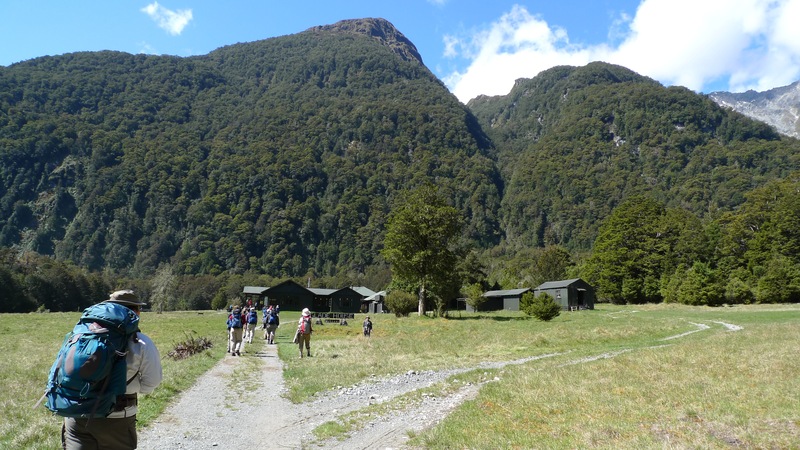 Day 2: We walk from Glade House up the Clinton Valley to Pompolona Lodge. 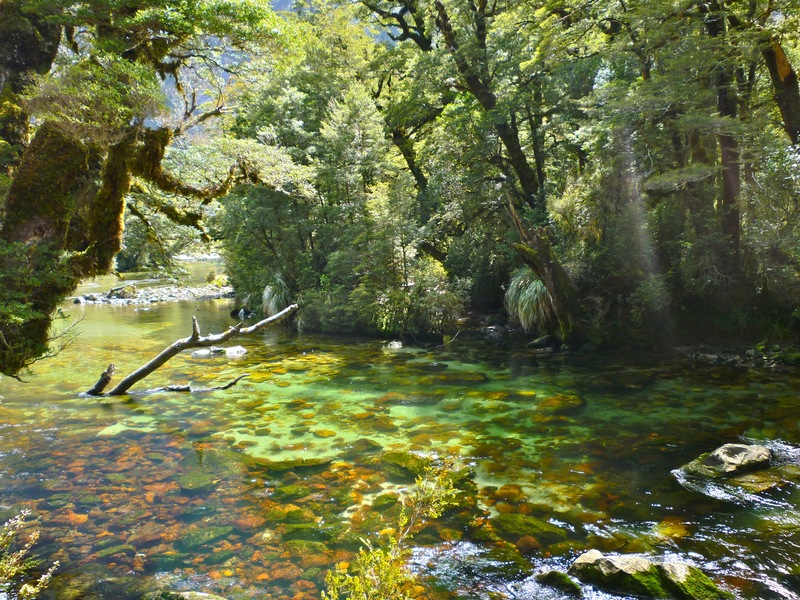 Categories: Holiday, New Zealand | Tags: "The Finest Walk in the World", Clinton River, Clinton Valley, Department of Conservation, DOC, Glade House, Glamping, Hiking, Lake Te Anau, Mackinnon, McKinnon, Milford Sound, Milford Track, NewZealand, Quintin McKinnon, Te Anau, Tramping | Permalink. 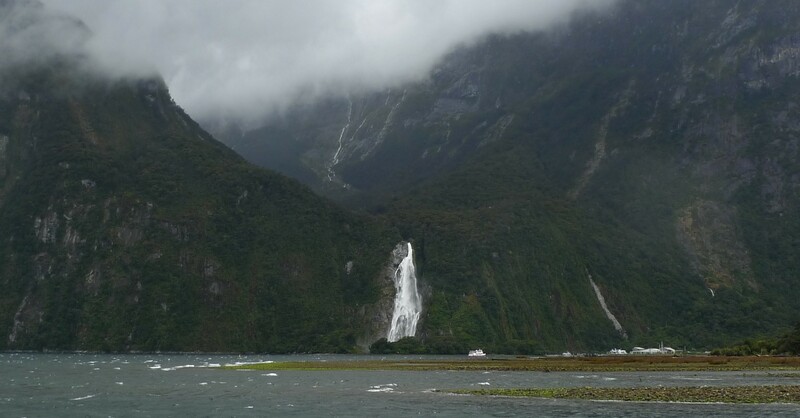 Milford Sound. 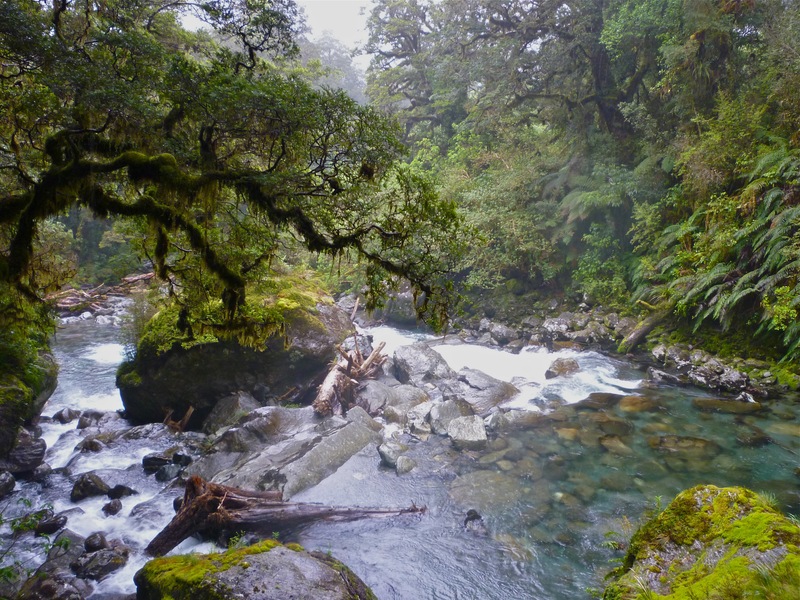 The jewel in the crown of Fiordland National Park, New Zealand. Renowned worldwide as a place of beauty and wonder. 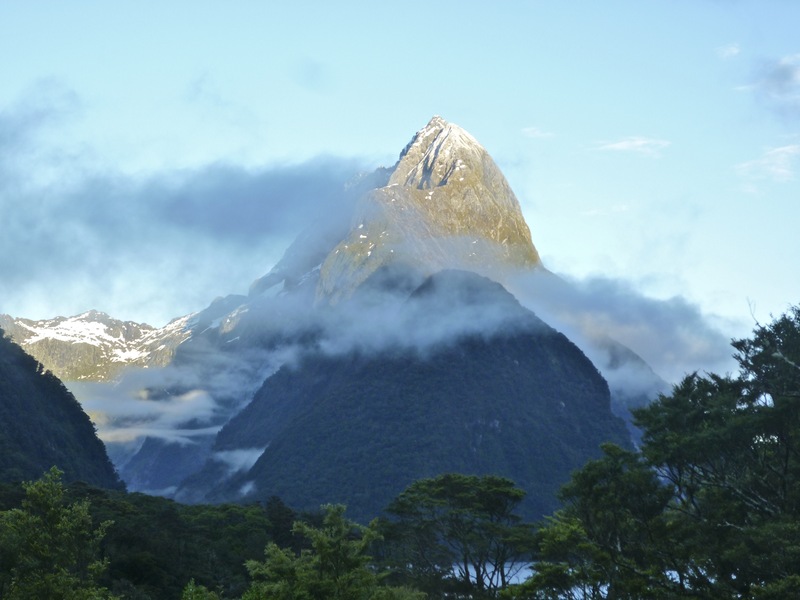 Mitre Peak; possibly the most photographed feature of Milford Sound… when it’s not hiding behind clouds. We were lucky this day! 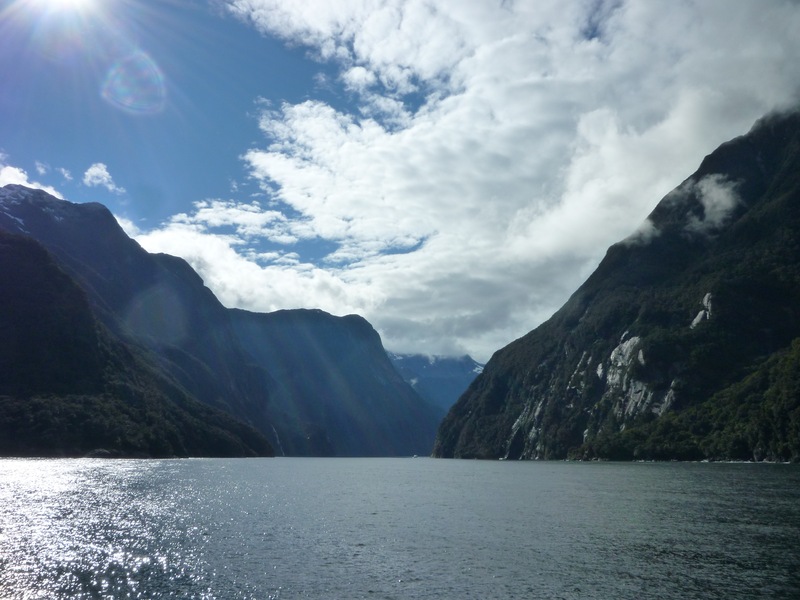 If you haven’t been, chances are that you know someone who has, and they probably went for a cruise along the fiord to the ocean and back. No one goes just to stand on the pier and get eaten by sandflies… do they? 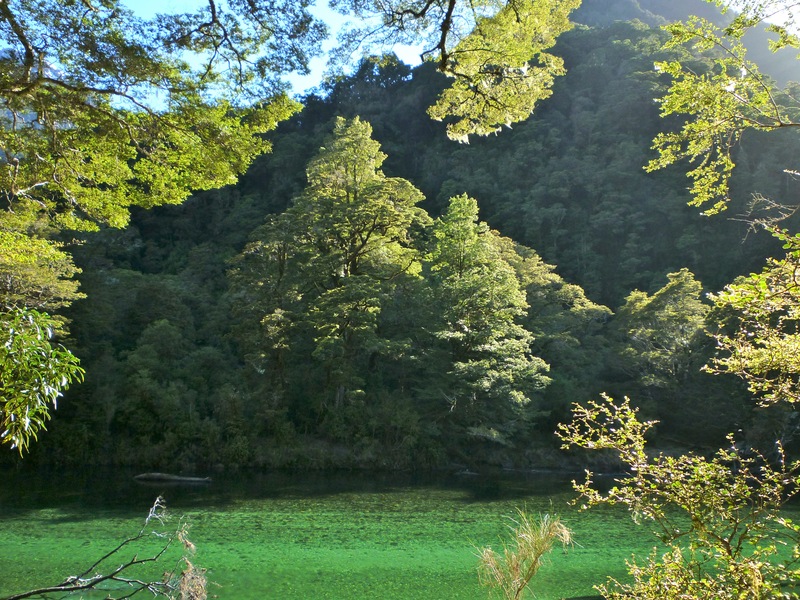 New Zealand Te Namu aka Blackflies (aka Sandflies or Midges). 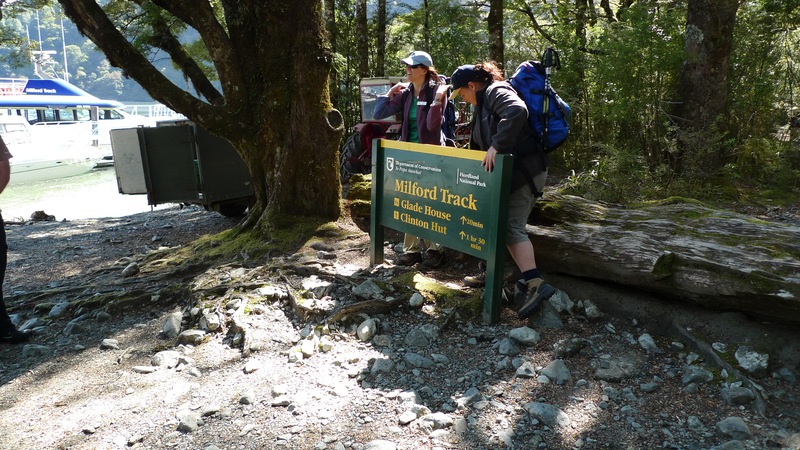 But how many people have heard of about the Milford Track? Maybe not quite as many. 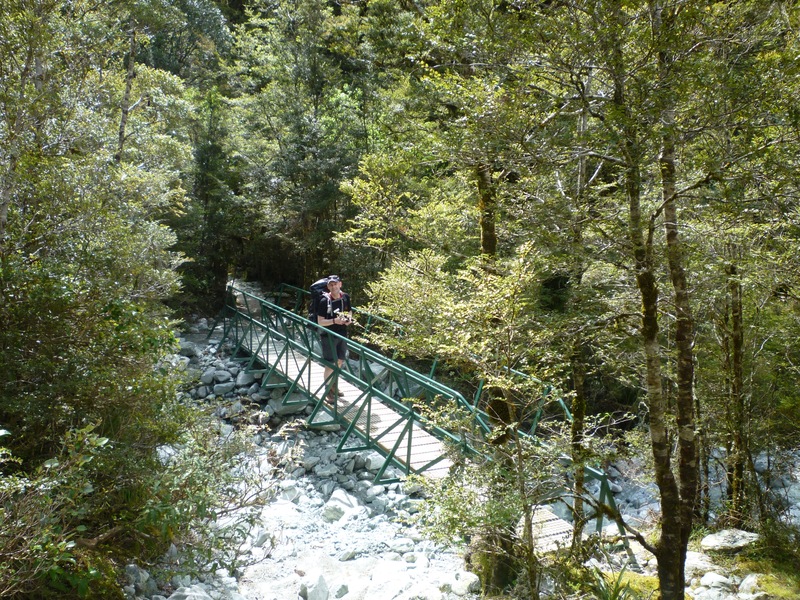 The Milford Track first crossed our radar while we were walking the Overland Track (in Tasmania). 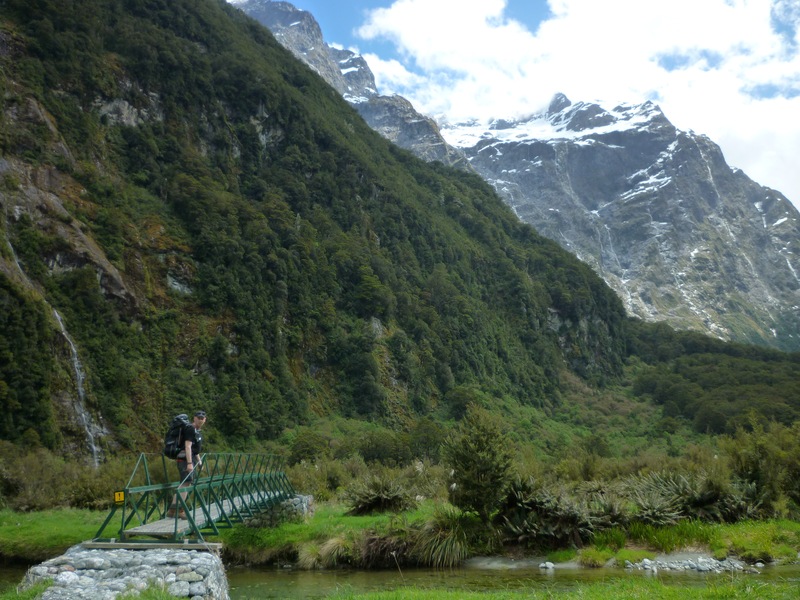 An older couple in our group had completed the 5 day walk with Ultimate Hikes and talked about their experience. It sounded pretty full-on! Whole groups (up to 50 guests) being moved from one camp to the next by helicopter because of obstructions on the track, and due to the next group following 1 day behind, you simply can not spend more than one night in the one location. It wasn’t the prospect of a helicopter ride that appealed to me though. 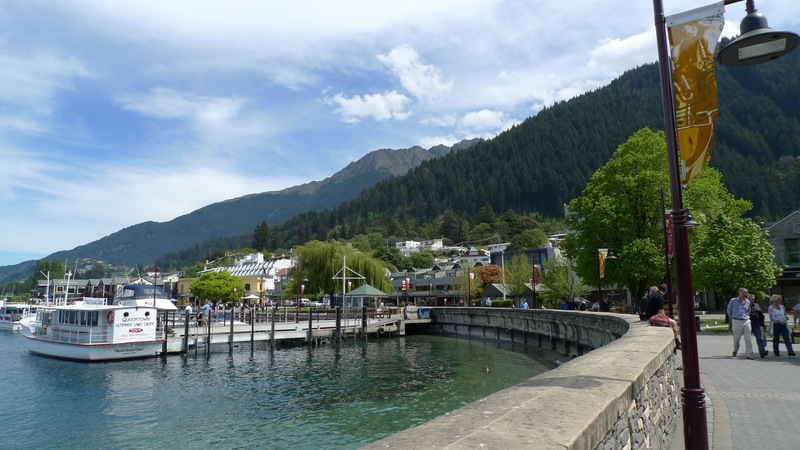 A few years prior I had toured New Zealand with my mum and I was keen to revisit Queenstown and Fiordland – actually, pretty much any part of New Zealand! 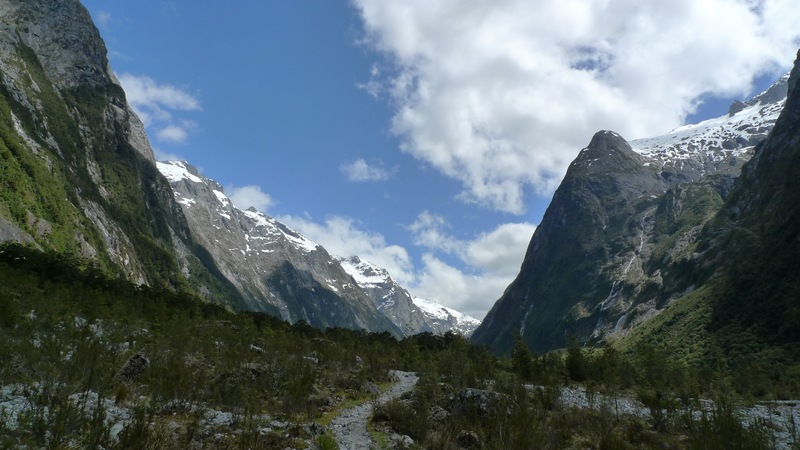 Stephen had not been to New Zealand on holiday before, so it would be all new for him. 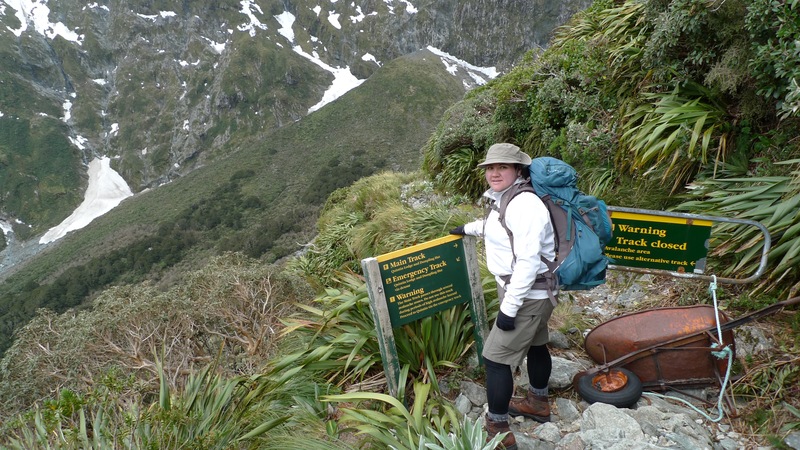 We were both keen to find another multiday walk similar to that offered by Cradle Mountain Huts – Ultimate Hikes offers an option of double/queen-sized beds in addition to hot showers each night and someone else to cook your food – how can you pass that up? We did our research on Google and You Tube. Everyone raved about the scenery, but we also read about groups who came back with next to no photos because it was raining the whole time. 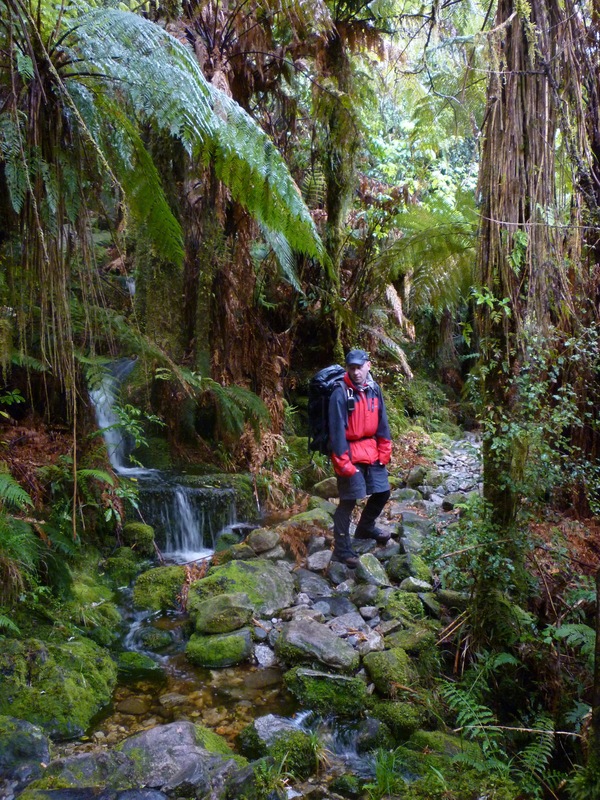 We saw the groups wading through hip-dep water covering the path, following the trail-markers. 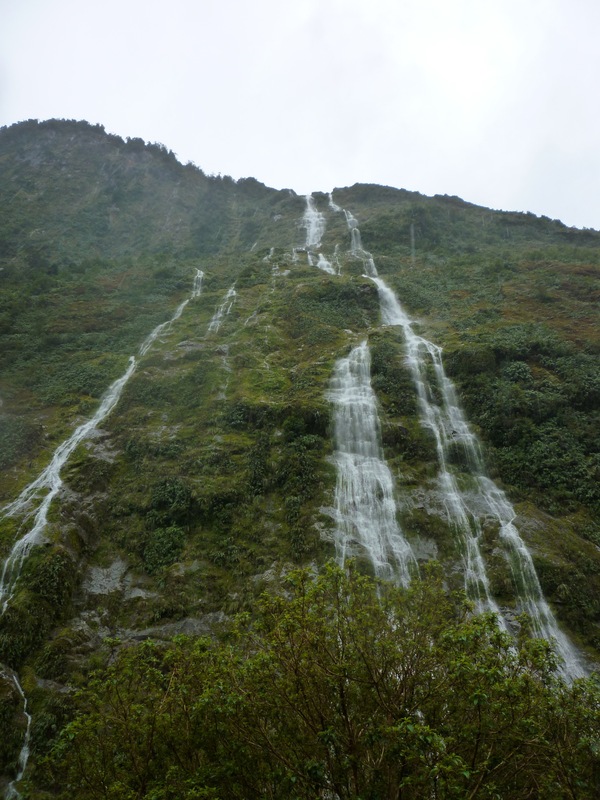 We stared, eyebrows raised, at the videos of the tracks up the mountain turned into waterfalls that hikers were trying to climb. We therefore knew we must be resolved to getting more than just our feet wet on this walk! We booked to go in November, when the track opens for the season and before things get extra wet in the summer, although it is highly likely to rain heavily throughout the year (that’s when it’s not snowing). They’re not kidding when they warn about the rainfall – they get 7 to 9 metres per year! No point measuring downpours in millimetres over there. 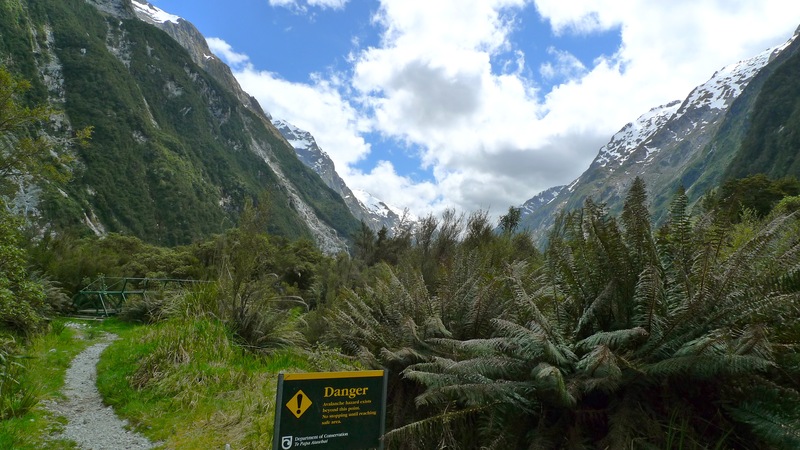 The track is closed during winter due to snow, and in spring the Department of Conservation (DOC) clear the valleys the track passes through from risk of major avalanches by sound blasts or detonations. 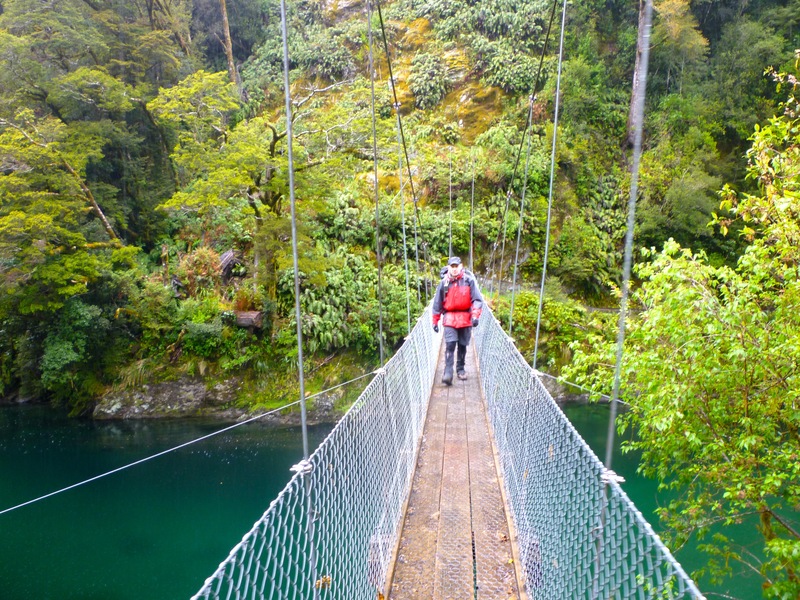 They also fly in (by chopper) the bridges that hikers will cross the streams and rivers on. 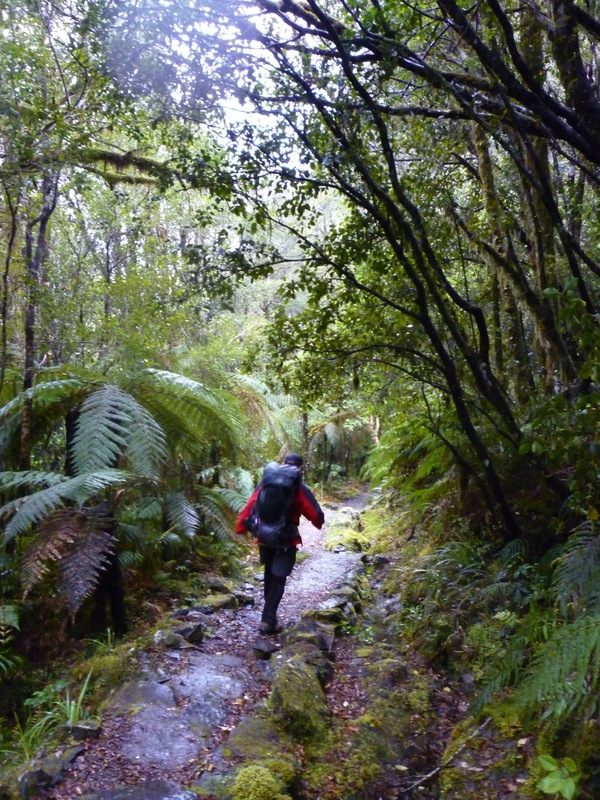 There is a fair bit of preparation done for us hikers – or trampers, as Kiwis say. 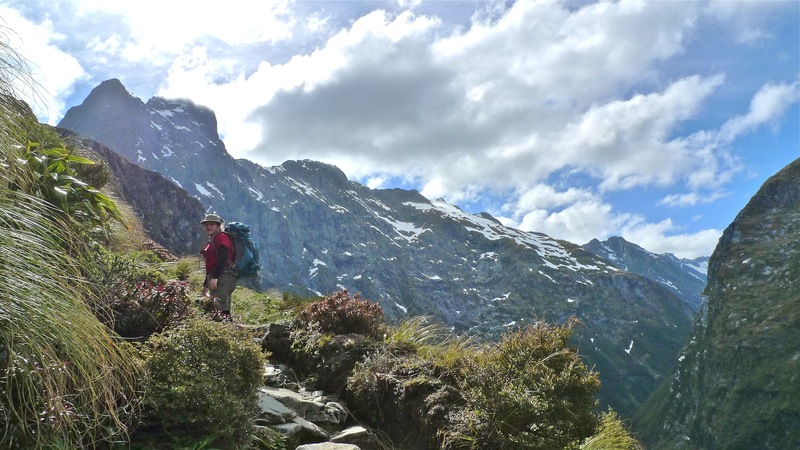 The list of gear that Ultimate Hikes advises guests to bring is not long (Ultimate Hikes – Milford Track – What to Bring) – you don’t want to be carrying more than you need to – but essential for a ‘comfortable’ trek. We decided to take our own backpacks because they don’t get much use otherwise, and because they’d be doubling as our suitcases on the way home we’d need the extra room for our holiday purchases! Not long before our departure date, our nice, convenient direct flight from Melbourne to Christchurch ended up being routed via Sydney. 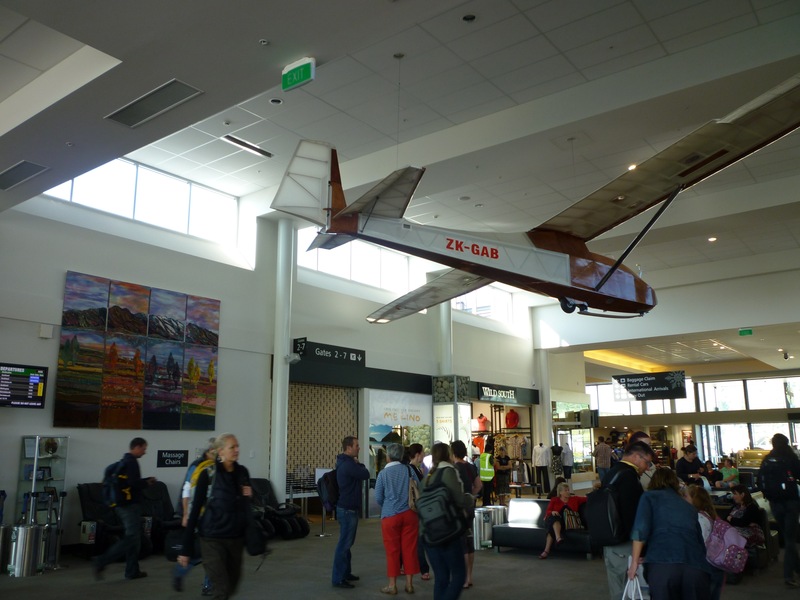 The only up side – if you can call it that – is that I can say I’ve departed Australia from three capital cities now. We arrived at midnight, got our hiking boots passed by customs – I think the guy was mildly impressed with how clean they were – and were asleep very shortly after getting to the motel, not far from the airport. 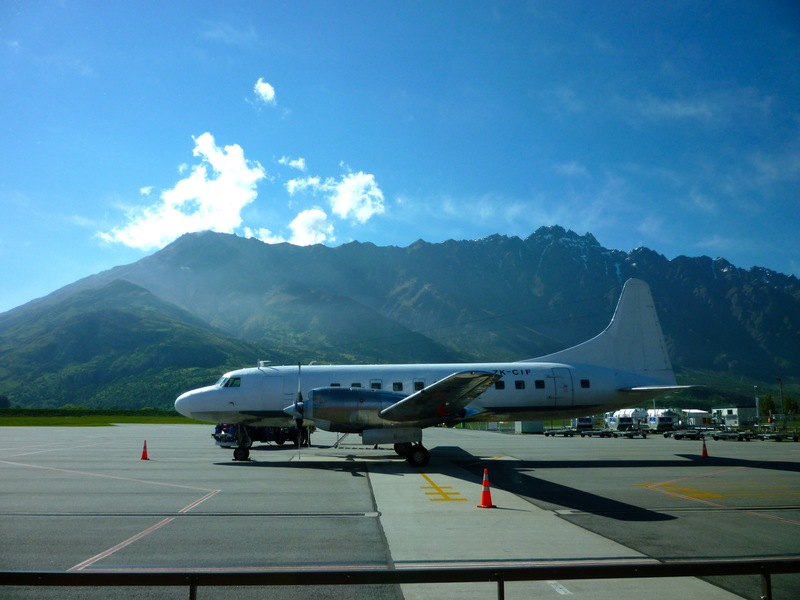 We were up bright and early for our flight to Queenstown. As I was checking out, Stephen saw a duck fly overhead which tilted both ways to look at him as it went. 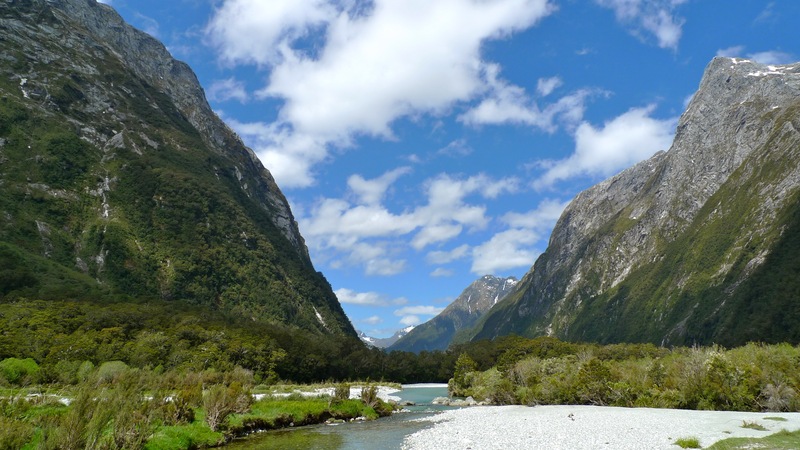 It became the standing joke of the trip that ducks in New Zealand say ‘queck queck’ instead of ‘quack quack’! 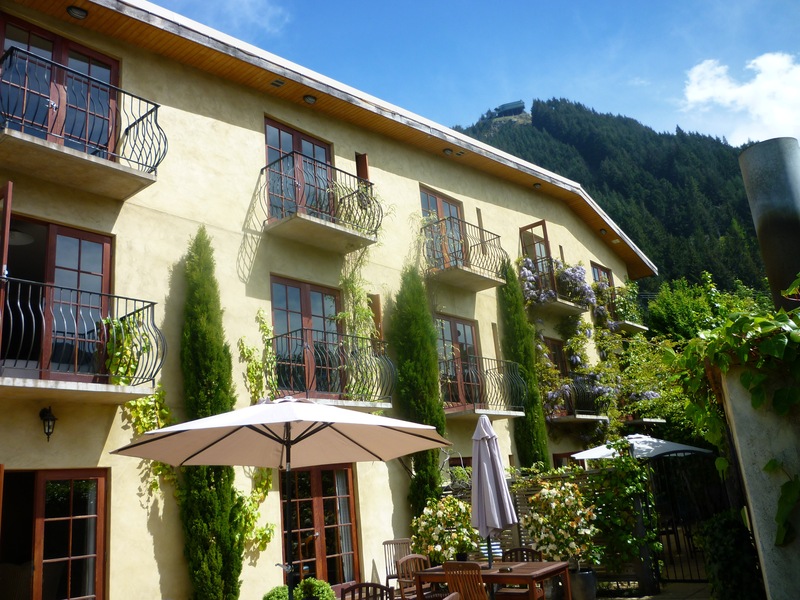 We caught a cab to Brown’s Boutique Hotel – it has a fantastic Mediterranean feel to it (and it’s so close to home! 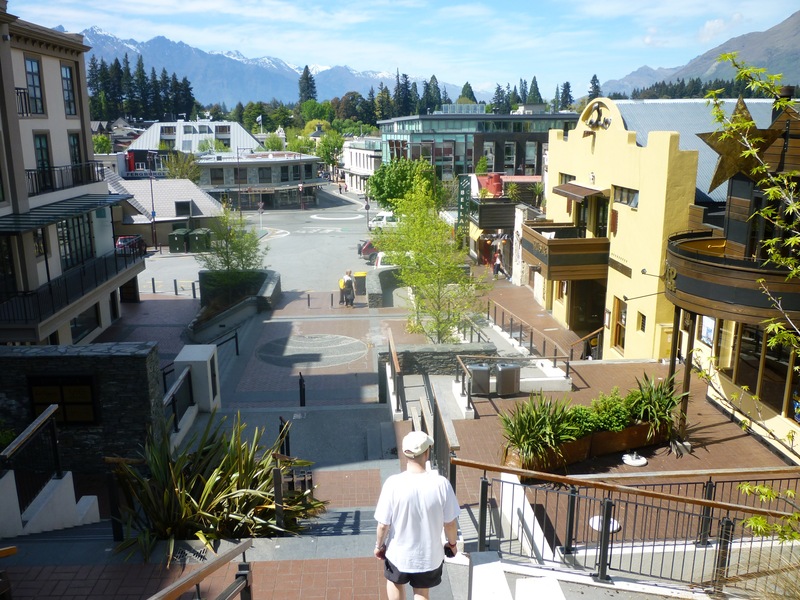 ), and since it’s in lovely location just up the hill from the main business area, the view is wonderful and it’s very convenient for shopping and dining, which we promptly went and did! 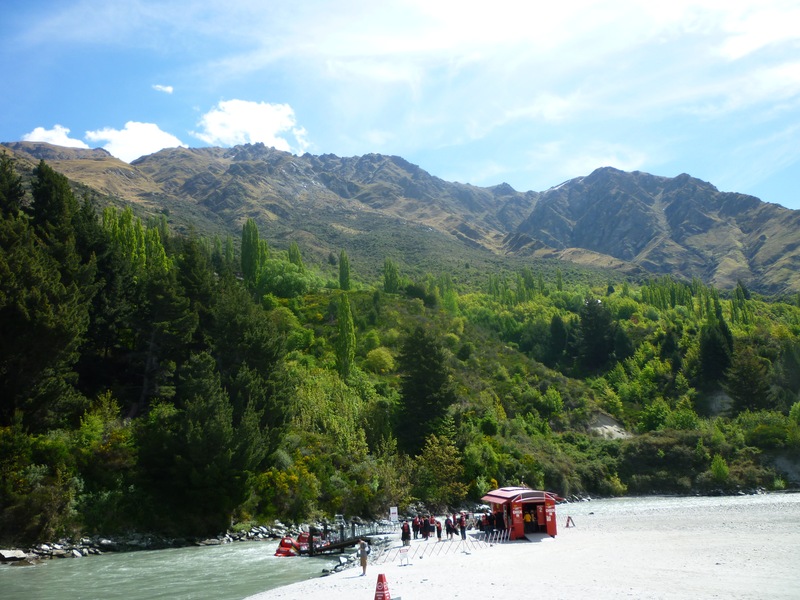 That afternoon we went on the Shotover Jet – no, not as part of a ‘combo’, which is an idea Kiwi’s seem to love with a passion (a bit like Tasmanians and buzzers*). Of course it was just as fun as I remembered it, and Stephen loved it too. We couldn’t have wished for a more beautiful afternoon, either. There was a pre-walk talk later that afternoon at the Ultimate Hikes office. 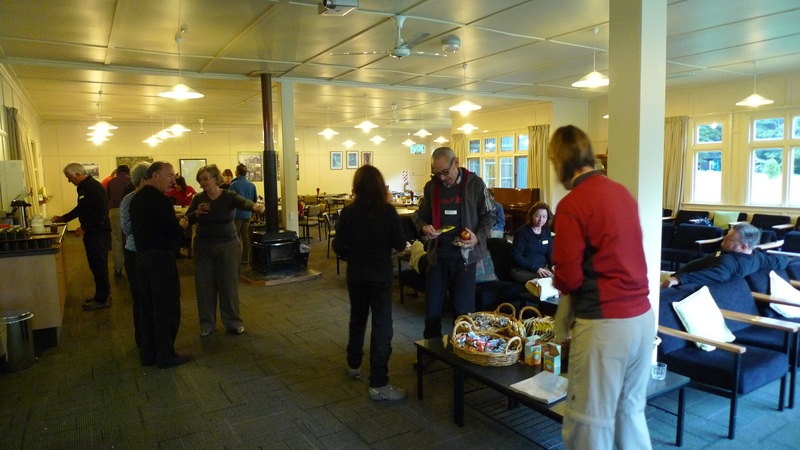 Everyone gathered to meet our guides, and for a Power Point presentation overview of what each day of the walk would entail, as well as being talked through (as a final check) what we’d need to take – and what we wouldn’t need! Day 2: Glade House – Pompolona Lodge (10 miles = 16km) This was the easiest of the ‘proper’ walking days. 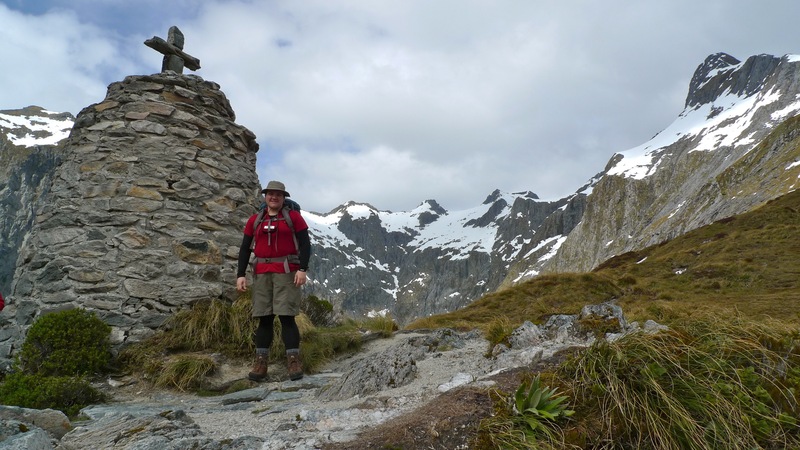 Day 3: Pompolona Lodge – Quintin Lodge via Mackinnon Pass (9 miles = 15km) I had thought going over the pass to be the most challenging day; it certainly was the most spectacular. Day 4: Quintin Lodge to Mitre Peak Lodge via Sandfly Point (13miles = 21km) Despite being relatively flat, this was possibly the most challenging day, which was somewhat unexpected. 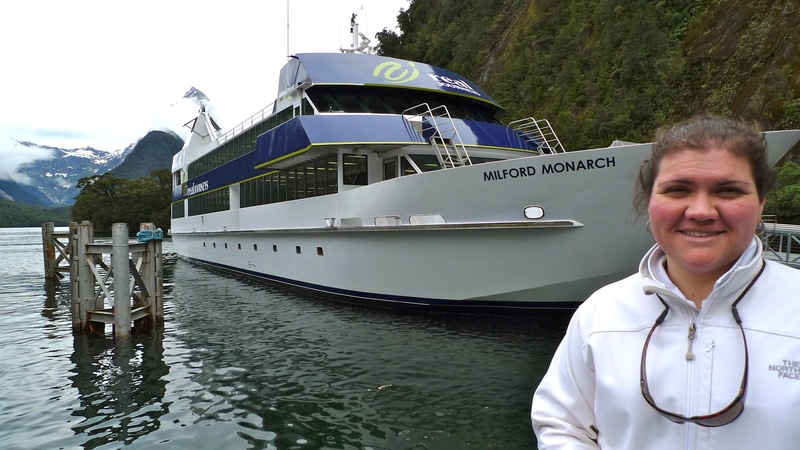 Day 5: Milford Sound Cruise, then back to Queenstown by bus (the finish post was passed yesterday). A lot of emphasis seemed to be put on taking walking sticks, the selling point being that even the majority of guides wouldn’t walk without them! 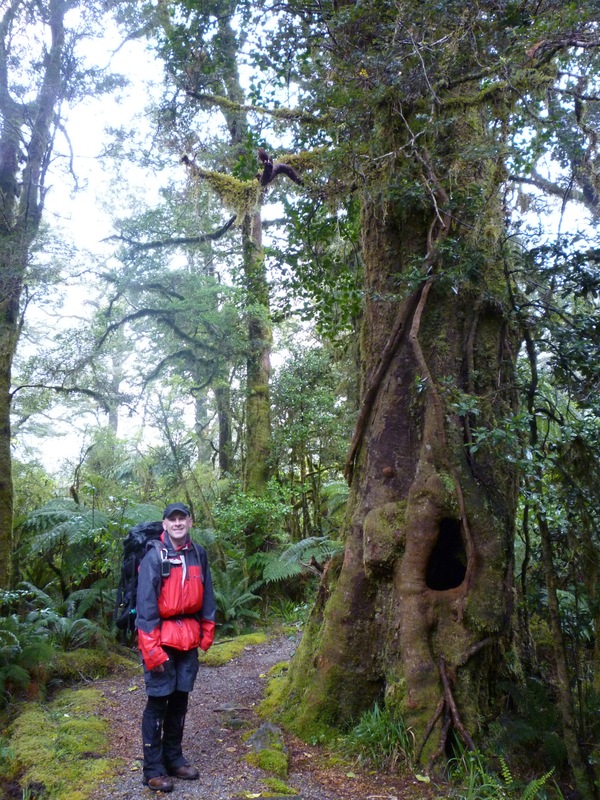 Stephen and I weren’t convinced and given that a) they weren’t a requirement and b) we managed the Overland Track fine without them, we were two of a very few number of people who didn’t bother to take at least one with us. They also had packs and other equipment available to borrow there for people who needed it. Something good that they did have (that we haven’t found back home) is “Foot Fleece” – cleaned but otherwise unprocessed wool to put inside your socks where you’d be likely to get a blister. It works a treat and we picked up more from the DOC office (it’s a little cheaper there) when we got back from the walk to bring home with us. The DOC fleece is called “Trampers Friend”. It’s slightly coarser perhaps, but does just as great a job. For dinner I had booked a Skyline combo (yes – a combo!) 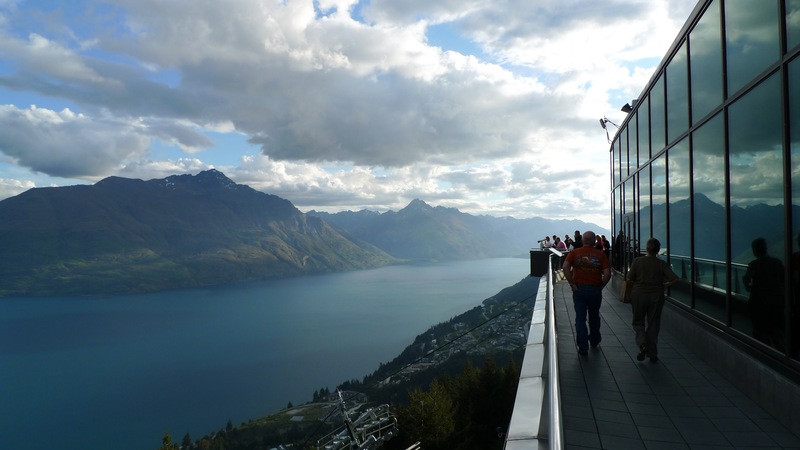 so we caught the gondola up the mountain to see their Kiwi Haka Show, and had dinner afterwards at their restaurant on top of the hill. The show was much better than we had expected. Stephen volunteered to be Chief of our group (which involved accepting/passing their chief’s challenge) and later most of the ladies in the audience (myself included) got up to try using the ‘pompoms-on a string’, or “Poi”, that the Maori ladies use in their dancing. It was fun! The view up there is spectacular (it is what you’re paying for, after all), and dinner (buffet) was also good. 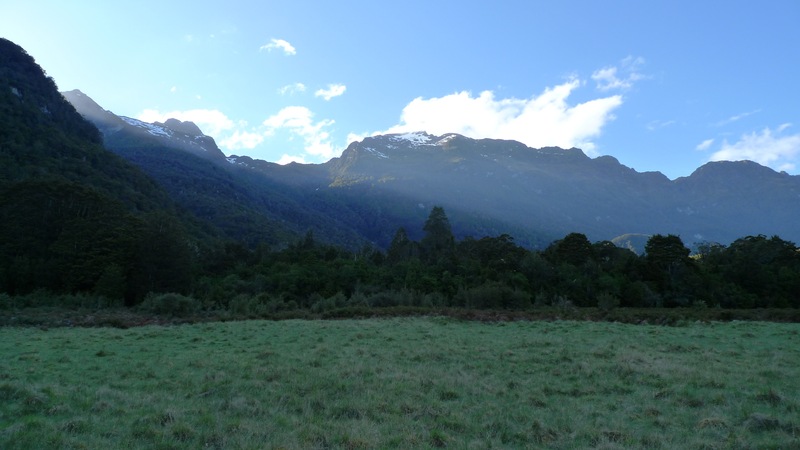 It was an early-ish night because the next day would be an early enough start to Day 1 (of 5) of our Milford Track walk! *Tasmanians and buzzers – if you’re not familiar with this reference, I promise I will write a post about it – please stay tuned. 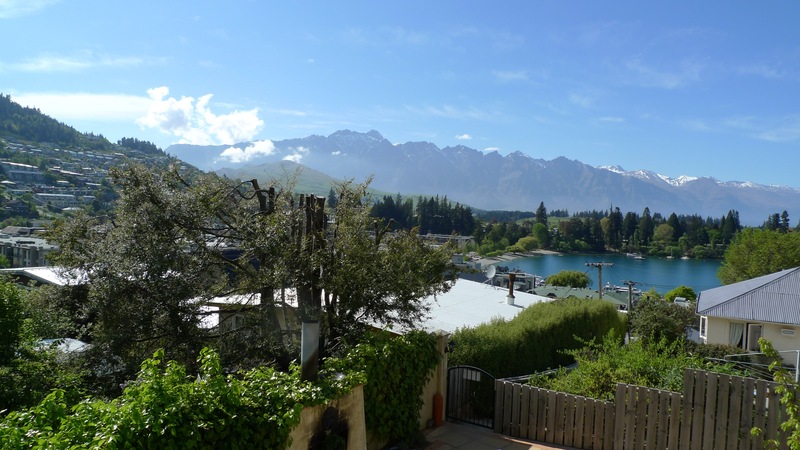 Categories: Holiday, New Zealand | Tags: Browns Boutique Hotel, Department of Conservation, DOC, Fiordland, Glamping, Hiking, Kiwi, Milford Sound, Milford Track, New Zealand, NZ, Queenstown, Shotover Jet, Tramping, Ultimate Hikes | Permalink. I sacrificed my usual non-work-day-sleep-ins for a very worthy cause while on a long weekend stay at Dunkeld, at the southern end of the Grampians in western Victoria last September. The cause? To take photos for our annual calendar! Well, our location made it so much easier. 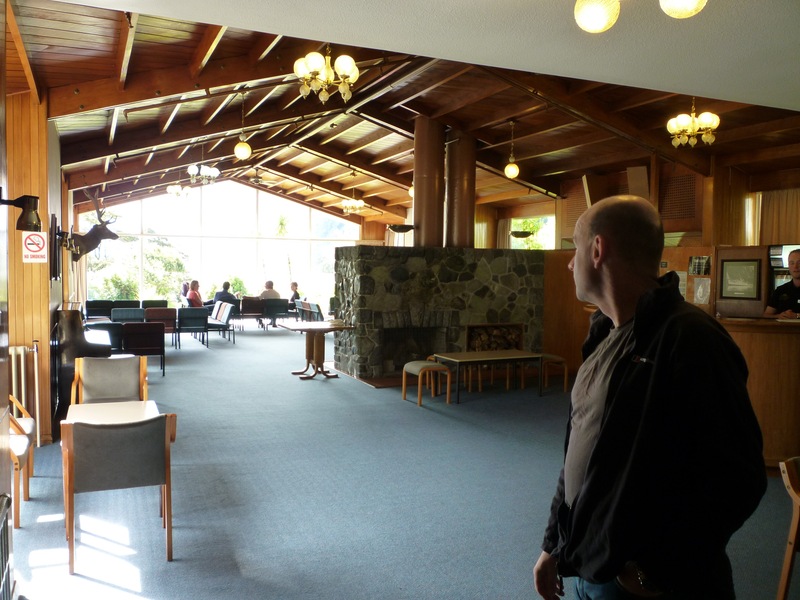 We had finally returned to the Royal Mail Hotel (3hrs or so west of Melbourne) after an absence of 3yrs 9mths & 14days. The place we’ve been talking about returning to for longer than any other! While I was standing on the veranda to our room (barefoot & in my PJ’s) photographing the fog roll over the mountains and through the trees, I realised that the bush was pretty loud. When I went back out a few minutes later the cacophony hadn’t stopped. And it was still going half an hour after that. I remembered the term ‘morning chorus’ and, you know, I don’t think I’ve ever heard a more varied and continuous example of birdsong. So the following morning I decided to record some of it. This is just a short snippet of what we enjoyed, and not all of the birds we heard or saw are included, but it’s a reasonable sample, I think. Please turn the volume up when you play this. An iPhone is good for spur of the moment situations, but I’m seriously considering taking proper recording equipment next time. Categories: Holiday, Victoria | Tags: bird calls, birding, birdsong, Dunkeld, Grampians, morning chorus, native birds, native birdsong, Royal Mail Hotel, Victoria | Permalink.